Your comments are welcome. An email address is required which won’t appear on the screen. 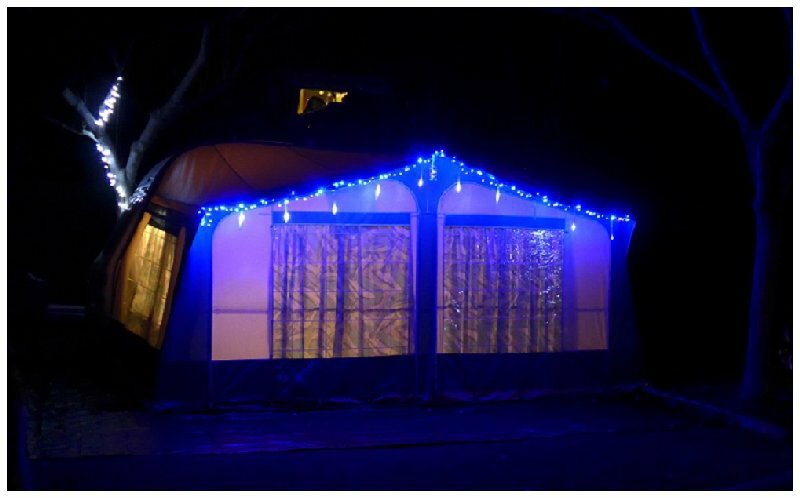 It was Halloween – and and I didn’t like the idea of leaving the car and caravan hitched up all evening and overnight on my drive? But I needed to leave by 6am in the morning ———- so I had to take a chance………… And it was fine! 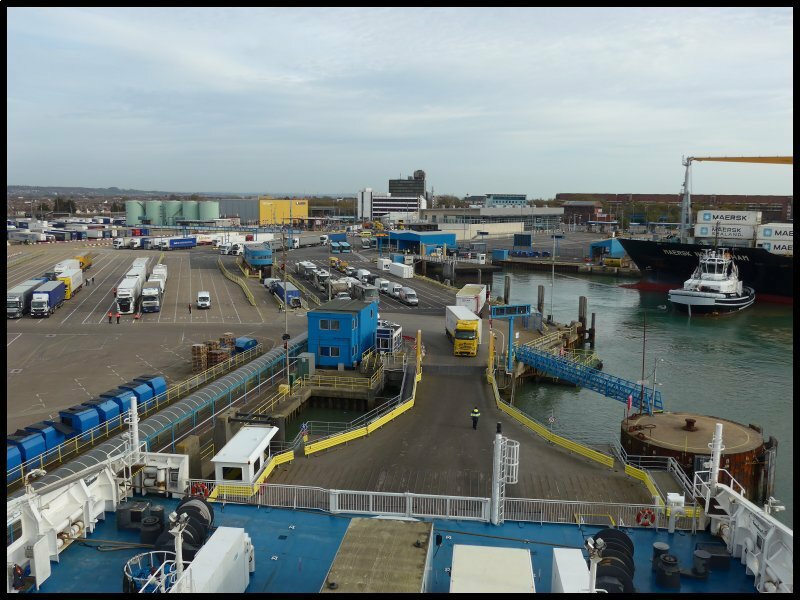 This latest blog begins on board Brittany Ferries’ Cap Finistere. The ship left Portsmouth harbour at lunchtime on Wednesday at the start of its twenty-four hour sailing to Bilbao. 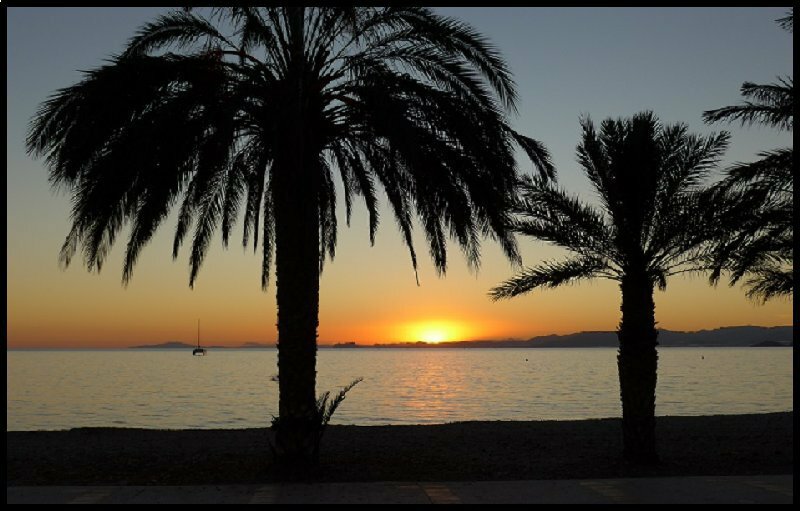 And as it’s the 1st of November I was on board heading to the sunshine in southern Spain. This will be my 24th winter there! Back in 1994 I first sailed with P&O from Portsmouth on the Pride of Bilbao but by 1997 I decided to motor through France so I drove to Dover and travelled with SeaFrance, NorfolkLine, P&O or occasionally with Eurotunnel. For the past five years I’ve been sailing from Portsmouth with Brittany Ferries. Taking the ferry to northern Spain has a lot in its favour. The weather whilst driving through France in November can be cold and wet – even snowy, although if you keep to the western route via Rouen and Bordeaux, snow is less likely. 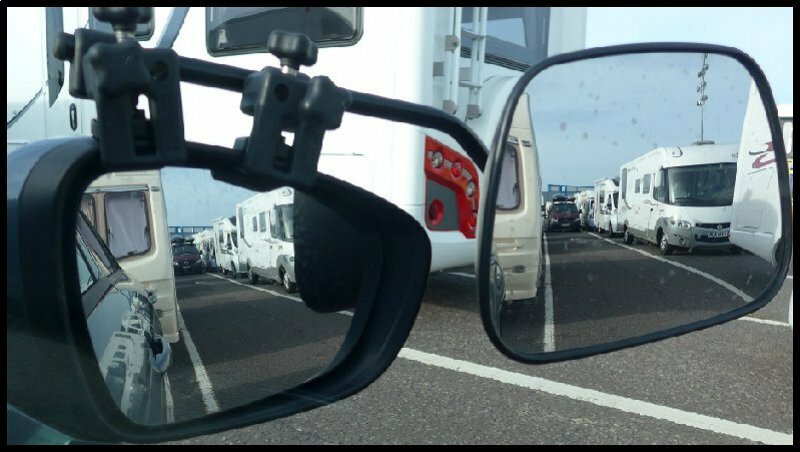 By the time the cost of extra fuel used for 1300 miles through France, some toll charges and site fees for the overnight stops are factored in, the fare difference between the two routes is not as much as it first appears. My outfit is parked on deck 5 whilst my cabin is situated on deck 9. The cabin I’ve got is the cheapest option available, which is an inside 2-berth cabin with its own en-suite bathroom containing a hand basin, toilet and shower with towels provided. The lowest of the two bunks is fixed at normal bed height with the second bunk being hinged into the wall. After it’s been lowered, it’s reached by a ladder. Since I travel on my own the arrangement suits me fine but for a couple who are not as agile as they once were, a cabin with two beds would probably be a better alternative. The cabin is also fitted with a couple of continental power points which are useful to charge a laptop or run a low voltage kettle. I get through numerous cups of tea or coffee throughout the day (and sometimes at night) so my kettle is essential equipment. As is a large bottle of water. Bottled water on board is a ridiculous price and the tap water makes unpalatable drinks. If you want to use electrical equipment fitted with UK 3-pin plugs, bear in mind that you’ll need a continental adapter. Facilities on board are excellent. There are two bars, very often with some sort of entertainment going on. There’s also several boutiques doing facials, nails and hair. Then there’s a sandwich bar selling pre-packs and salads. Finally on deck ten there’s a small bar doing basic hot meals. The restaurant on board Cap Finistere is waiter-service with continental menus. Finistere’s sister ship the Pont Aven has a self-service cafeteria instead. There’s also a cinema, a quiet lounge and a swimming pool. For passengers travelling with dogs, there are kennels on the top deck with a walk area. There’s a smaller ferry operating a cheaper alternative called “Economie”. It operates less frequently but I travelled on it in November 2016. To read my opinion of the journey see my last year’s blog. For now, suffice to say that the single journey was £110 less than my present one. 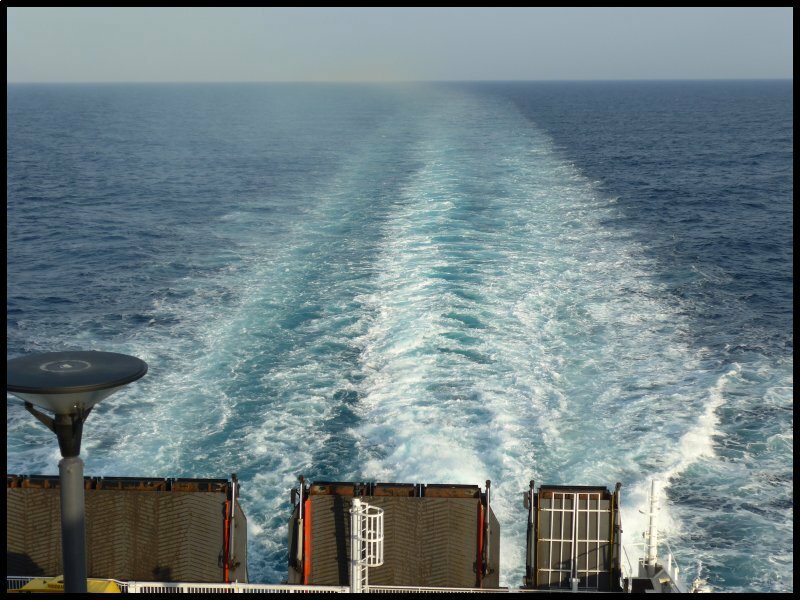 Once settled in my cabin I went along the corridor and out onto the open deck at level nine. I joined others who were watching the ship slowly leave it’s berth. Then a guy standing close by asked me if I towed an Avondale. I told him I did …….. and he said “You must be John.” I’d just met Jim, a member of CT forum and better known as Wigandiver…………………….. What a small world it is! 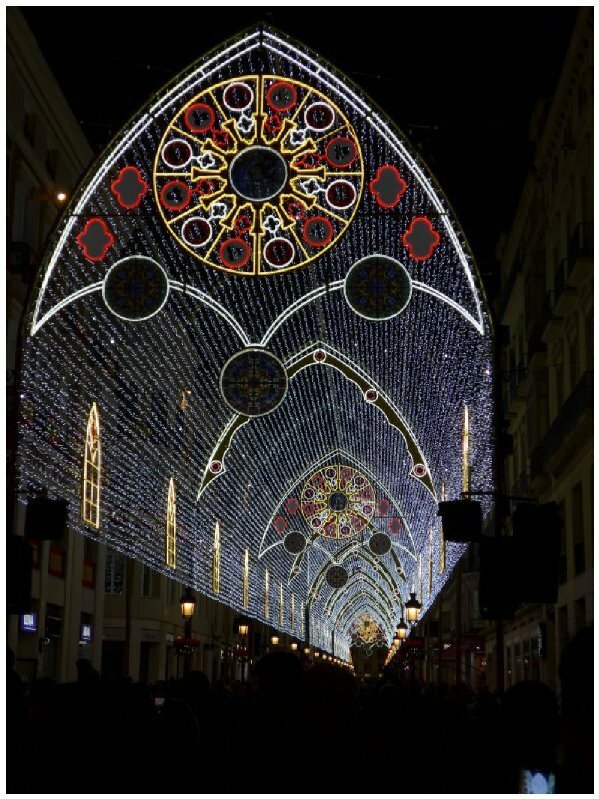 Each year that I visit Spain I like to plan a different route for travelling from north to south but should you happen to want to get to the southern coasts as quickly as possible then the most direct route from Bilbao or Santander is to take the motorway to Burgos, the A1 to Madrid then the A4 and A44 to Granada. With the exception of a fairly small toll charge between Bilbao and Burgos, the entire drive can be completed on toll-free motorways. 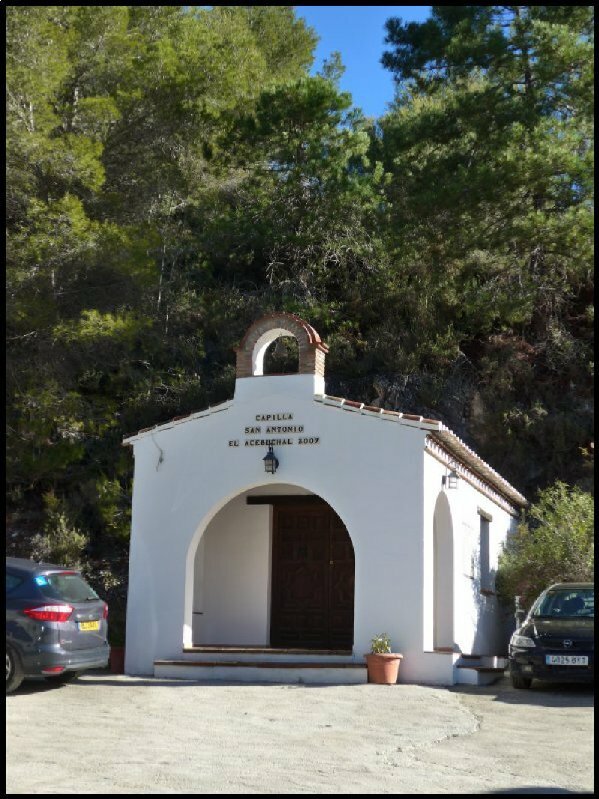 With an early start, the journey can be completed in two days, driving approximately 300 miles each day, with a night halt before or after Madrid at La Cabrera or Aranjuez. Should you want a more leisurely drive, additional sites can be found in the section, “Routes and Sites”. Also there are some alternative routes. 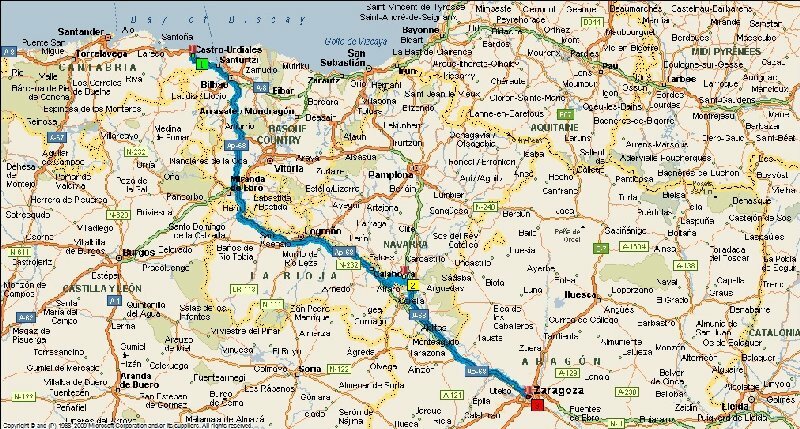 However for this year the route I’ve planned will take in Villafranca, Zaragoza, Teruel, Valencia, Cartagena and Almeria before arriving in Torrox. Although the route is planned; the camp sites checked out and the towns I want to visit are noted down, my overall plan remains fluid, depending mainly on weather etc. I don’t book any sites in advance so if the weather is unsuitable for sight-seeing, I just move on. This is a map of my planned route, whilst below is the route for the first two stops. 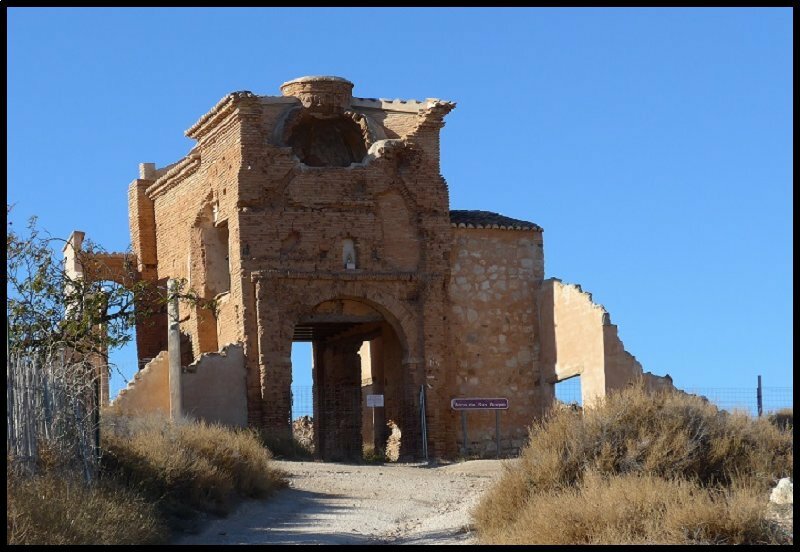 If you are heading along the AP68 the site is situated close to Villafranca, some 15 miles from the AP – so some might think it’s a bit too far to travel for a night halt. But I planned to stay at least two nights. 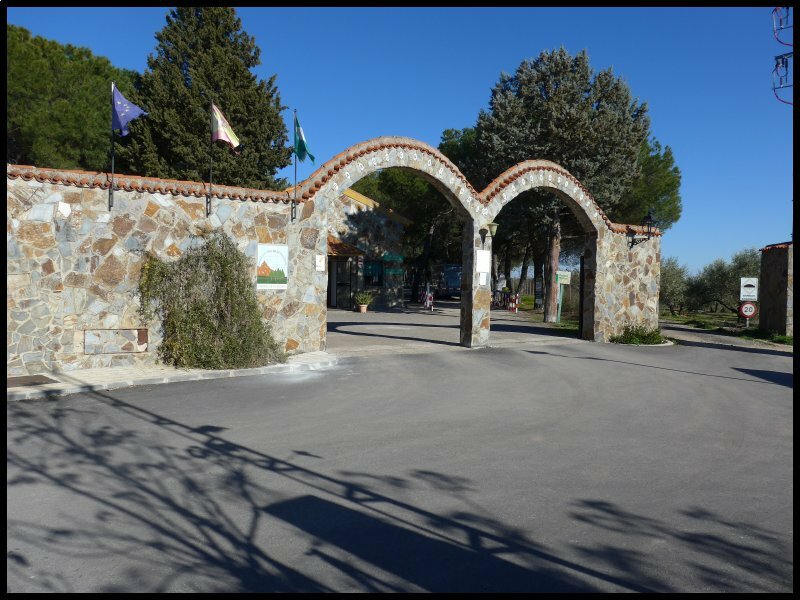 The site is just to the left of the main road heading towards Villafranca when travelling from the south. A turn across the road is prohibited , so it’s necessary to drive half a mile or so to the next roundabout. The site is a mix of touring pitches and mobile homes. The pitches are of a good size with the toilet block placed centrally on the site. It’s a modern building with spotlessly clean and tidy facilities. Showers are beautifully tiled with a push button tap for a controlled temperature flow. Electric bollards have two pin connectors but coped ok with my 500watt fire and 2KW kettle together. Camping Bardenas is the name of the site where I’m staying but I wanted to visit the National Park from which it takes its name. Bardenas Reales is the largest semi-desert in Europe covering more than 160 square miles. 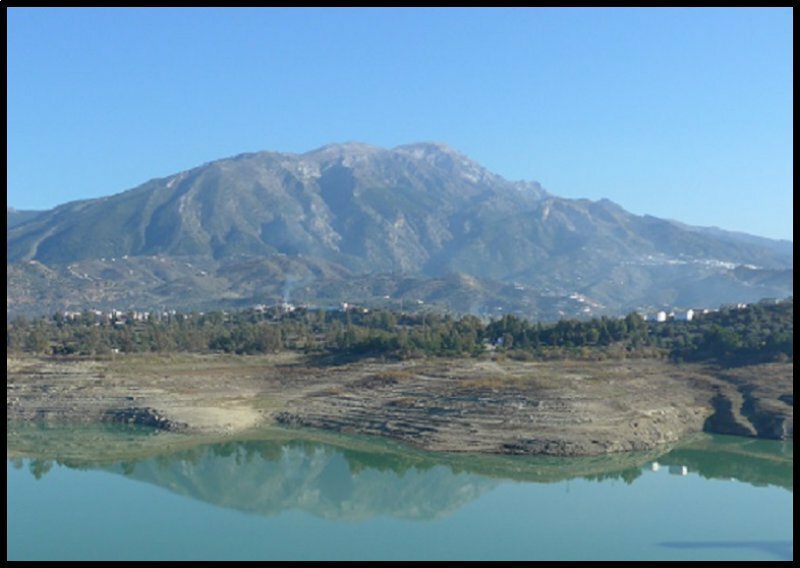 It’s located in the middle of a depression in the Ebro valley and surrounded by three distant mountain ranges. The clay, chalk and sandstone have been eroded by wind and water over the centuries into weird canyons, plateaus and isolated hills. Las Bardenas is divided into several areas, two of which are Bardena Blanca and Bardena Negra. It’s the Blanca district to which I drove. 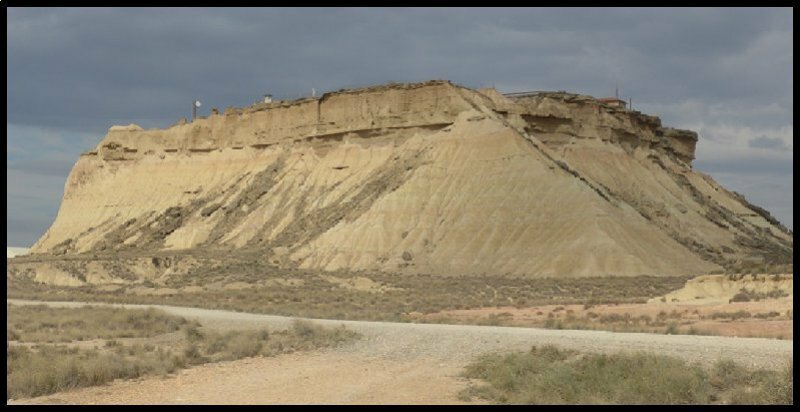 As you can see from the pictures, the landscape is mainly white gypsum and clay. The Park has become a popular location for the film companies . If you watched the recent series of Game of Thrones, parts of White Bardenas became the Dothraki Sea. 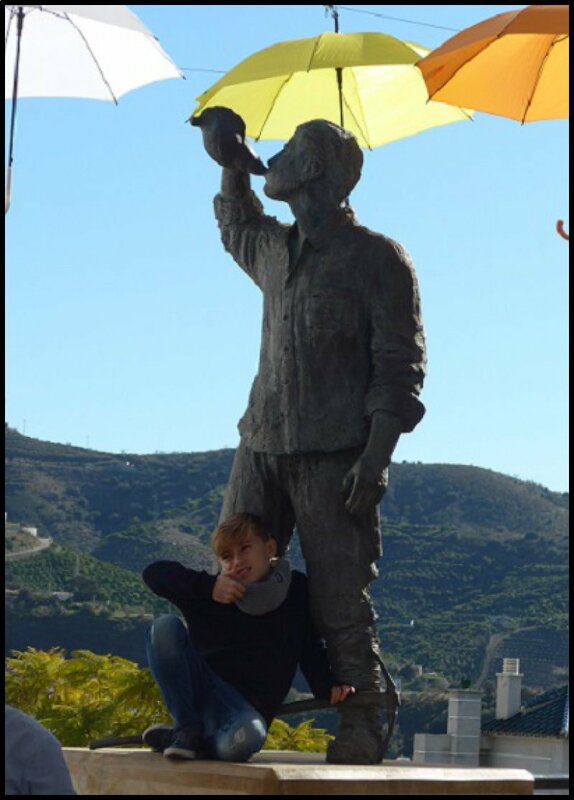 A few years ago James Bond met Dr. Christmas Jones in Bardena Blanca. Also Citroen filmed their C4 as it drove along the dirt roads in it’s television advert. 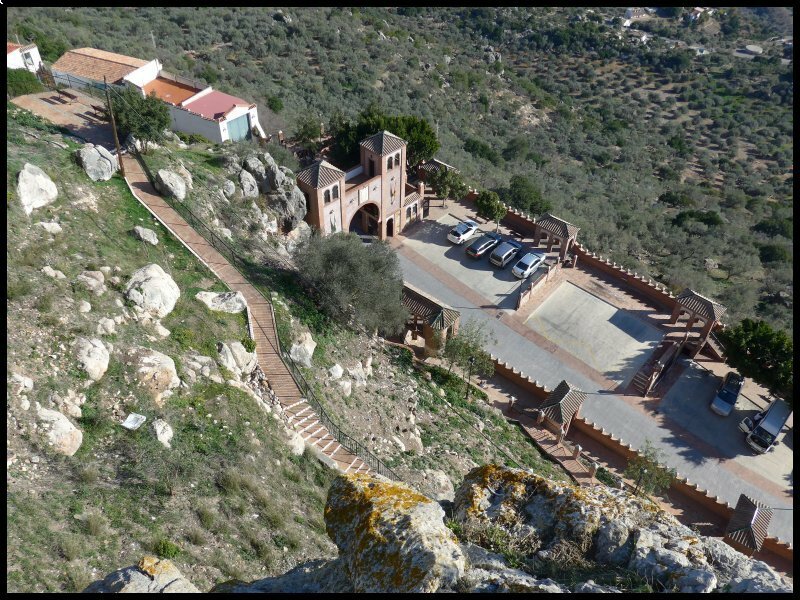 During the 1980’s the Park was used as a bombing range by the Spanish air-force but after a long public protest, the bombing was stopped. At the centre of the Park there is a high security military establishment with sufficient staff to fill a large barrack block. Most of what takes place inside the precincts is well hidden from view because it all takes place on a high plateau. 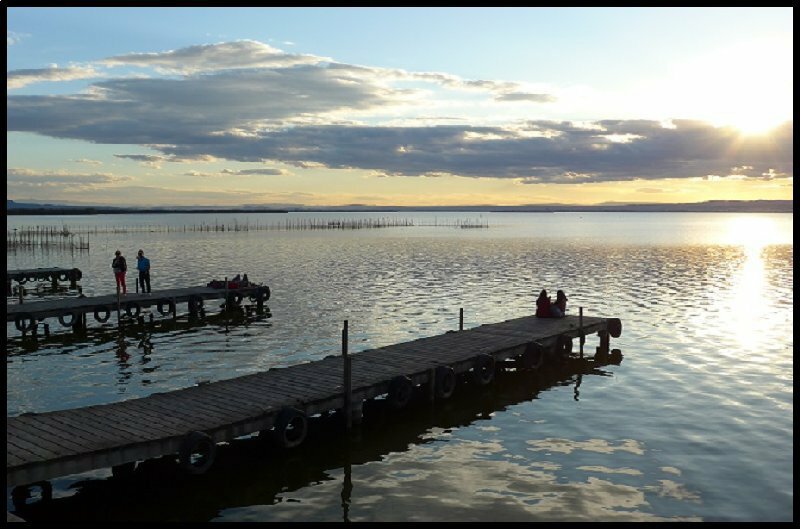 In the year 2000 the Park was declared a Biosphere Reserve by UNESCO. 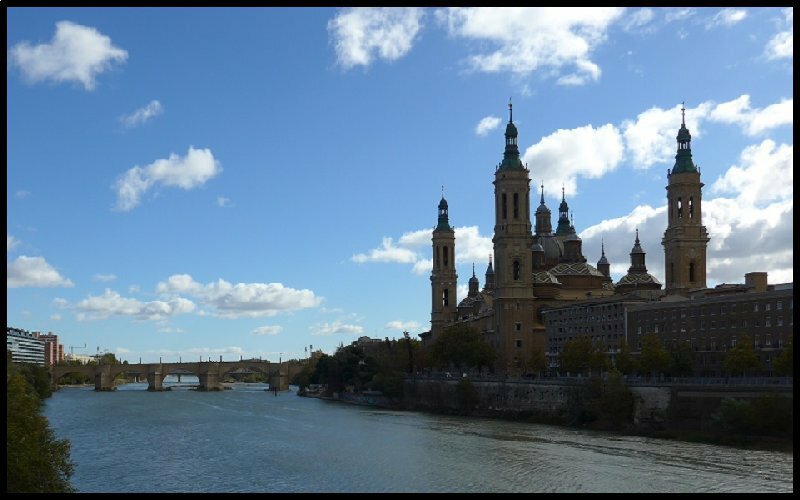 Saturday was spent moving on to Zaragoza. It was only 70 miles to my next camp site so I was in no hurry to leave Camping Bardenas. Besides, the longer I delayed my departure, the more chance there was that the rain might finally stop. It had rained heavily during the night with at times, constant fflickering of far off lightning. For the next stage of the journey I was faced with a choice of N-roads or the AP68 toll motorway. By the time I’d reached the slip road, I used the drizzle as an excuse to use the motorway. At least it was quick and allowed me to check in at Zaragoza Camping by about 1pm, having parted with €9.25 for the toll charge. Considering it’s the off season this Council owned site is an expensive stop-over. There’s no ACSI discount and in spite of being on my own, the nightly charge is €20.75 But if you want to visit Zaragoza, there’s no other site close to the city, so it’s grin and bear it! 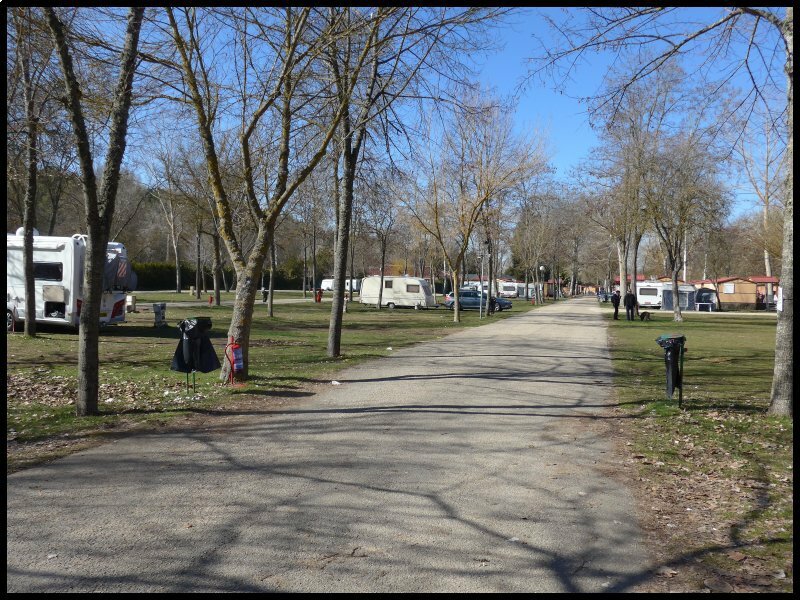 The site is situated within a large public park with the caravan site being around the perimeter. In the centre of the park are public tennis courts and a childrens’ play-park. 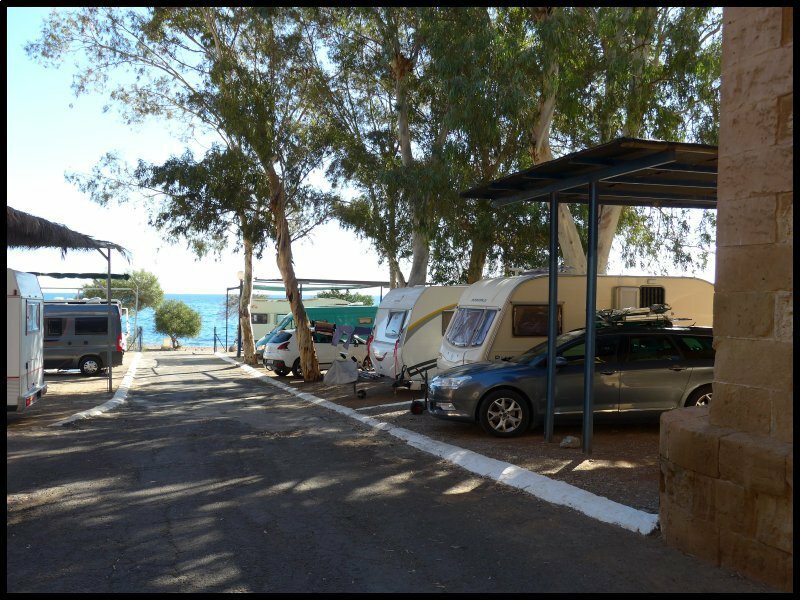 On the site here’s a mix of tourist pitches and static mobile homes with three toilet blocks being spaced around the camping area. The back to back pitches are quite large with an electric bollard being shared between four pitches. Water taps are in the base of the bollards. The toilet block nearest to my pitch has a room with washing machines and deep sinks. Further along is another room with toilets and another with shower cubicles. Toilets are modern and reasonably clean however, the shower cubicles are small with no divider between wet and dry areas, also no stool and no hooks on which to hang clothes. Spray heads are fixed and the mixer tap is of the self-closing push type. I made up a packed lunch and drove the four miles into the city. Although it was early on a Sunday morning, parking was dreadful. But since every habitable dwelling is in an apartment block, it’s likely that most of the parking will be residents. But finally I found a slot on a back street. I made a careful note of Calle Palencia just in case I got myself lost. It has happened in the past, and I have a dread of it happening again. I set off walking towards the river – then across the bridge. 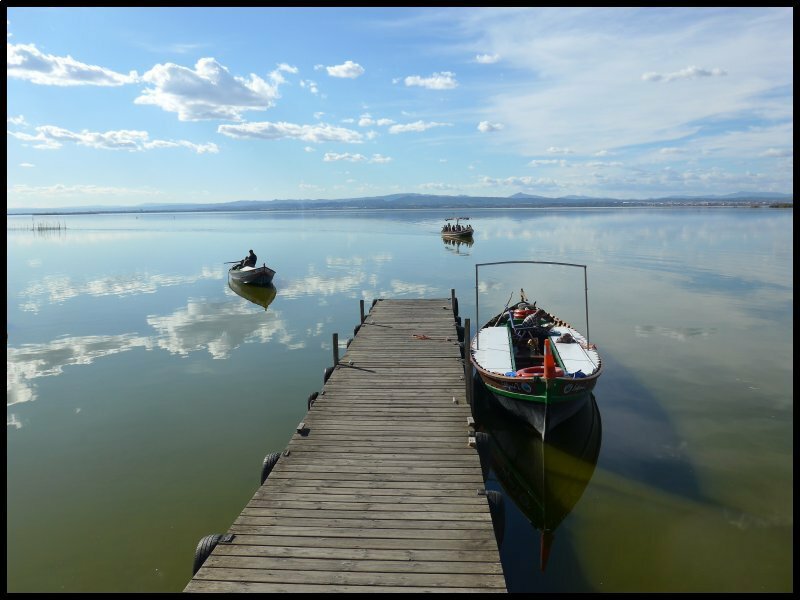 The river is the Ebro – and very wide at this point. Having crossed the bridge the first thing I encountered was a section of the original walls of the Roman City. Built into the walls was the tourist office together with a tower which promised a fine view from the viewing platform on level five. I thought I would give it a try, but I quickly realized that four flights of steps only took me to level one. By the time I’d reached level two, I’d had enough. I gave up and returned to street level. 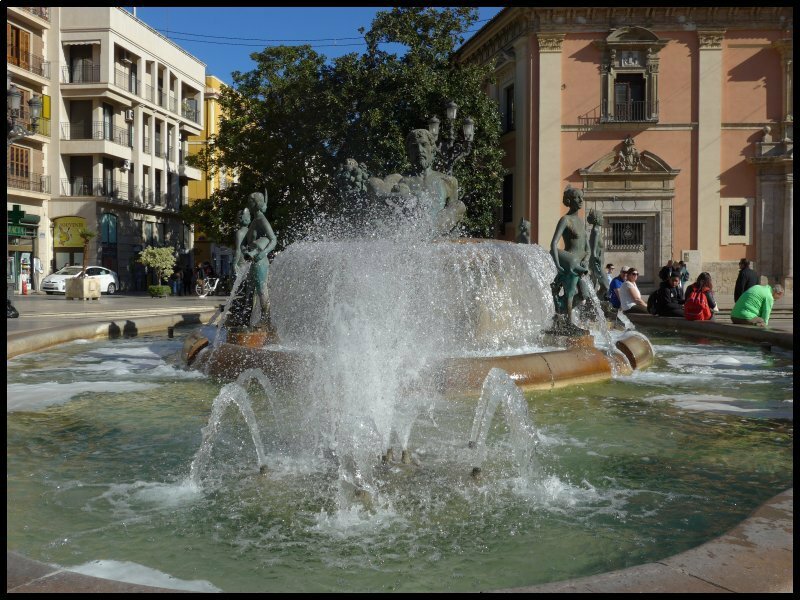 A few more steps and I’d reached Plaza César Augusta with a statue of the man himself. 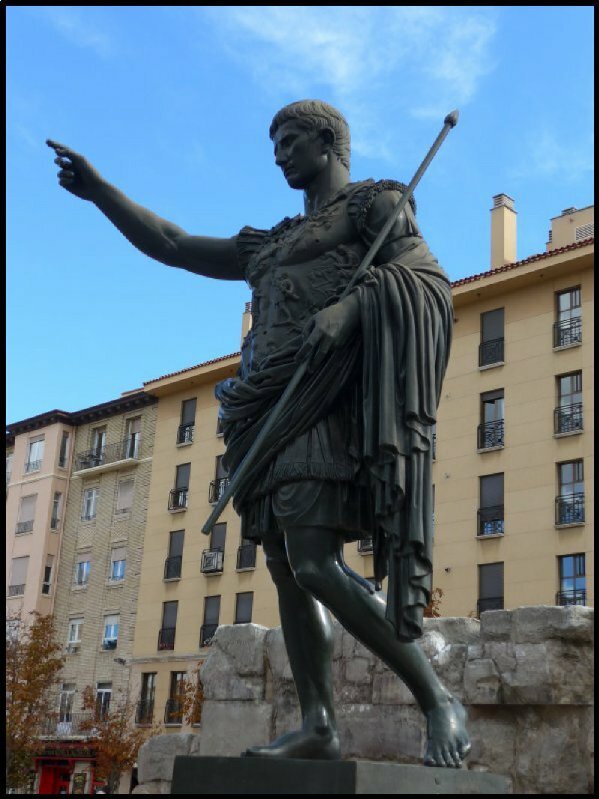 The reason for his statue to be there is because in Roman times the city bore his name. Around the corner was a huge, modern sloping feature with water cascading from top to bottom. 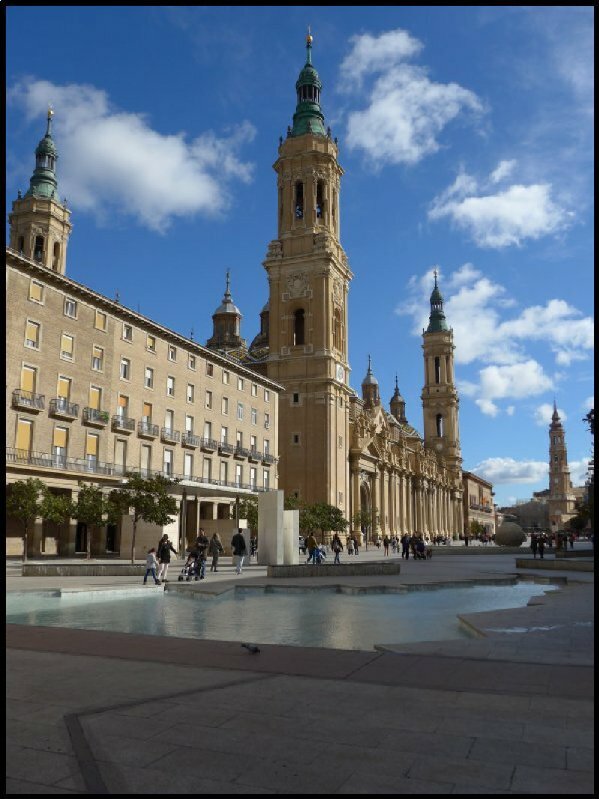 Another couple of hundred yards and I arrived at the Basílica de Nuestra Señora del Pilar. Being 11 o’clock on a Sunday morning I felt sure that it would be closed to wandering visitors. But not a bit of it. It was open with hundreds of visitors milling about whilst a mass was being conducted. 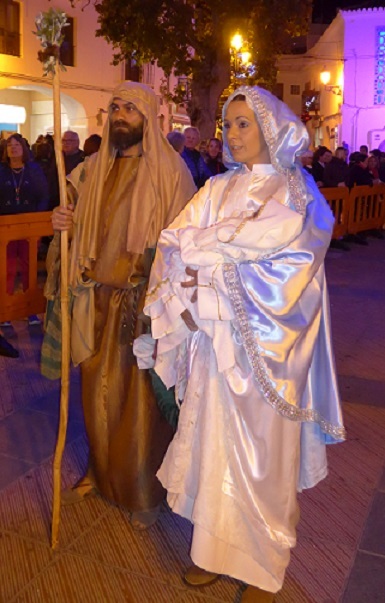 Some Christians believe that the Virgin Mary visited Zaragoza to see the Apostle Santiago whose biblical name was James, preach on the banks of the Ebro. The Virgin gave him a jasper column as a symbol. As I walked around the Cathedral I saw a queue waiting at what looked like a small viewing window surrounded by a polished brass frame. 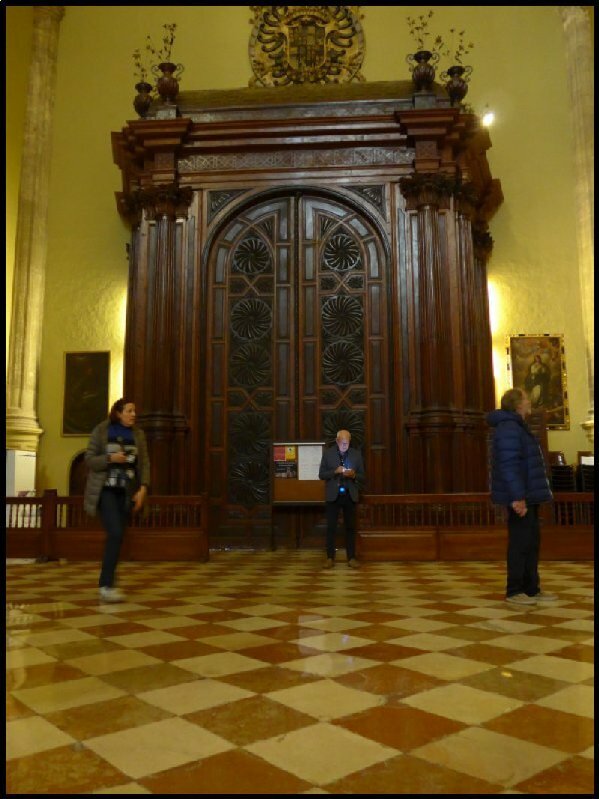 It seemed to me that each person in turn knelt or bent down to look through it. But as I got closer I realised they weren’t looking through the frame – they were kneeling to kiss the wall. I decided to give it a miss and quietly moved away! 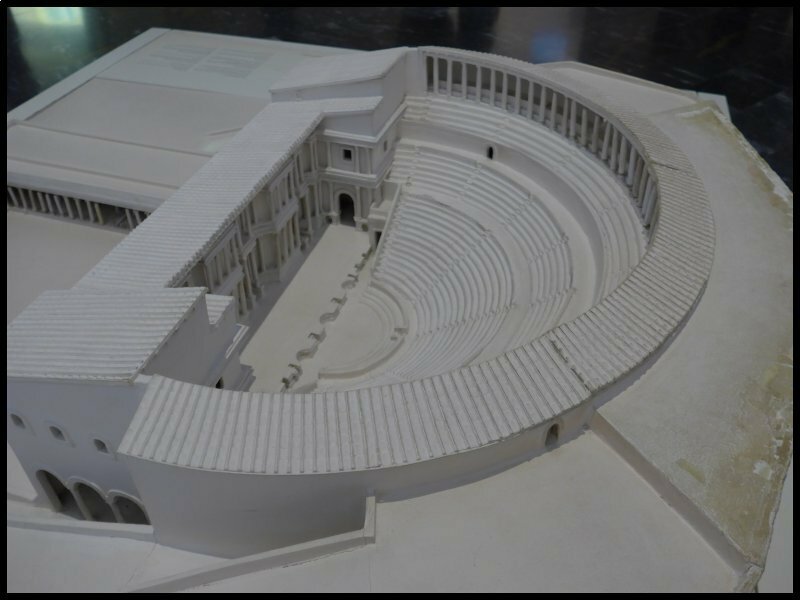 At my next stop – the Roman Theatre, there was a disappointment in store. It was closed. Rather short-sighted of the organizers I thought, since the City was teeming with visitors. Not only that – it was also closed on Mondays as well. 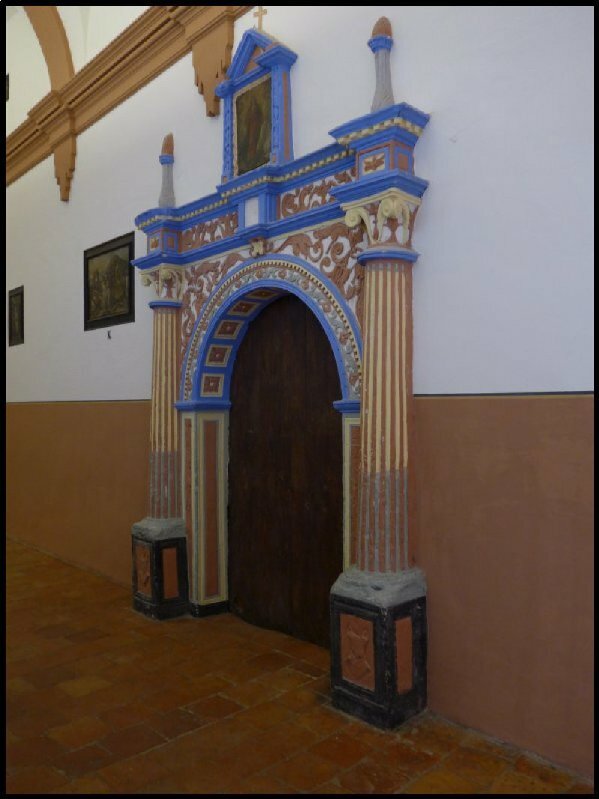 So it was on to the Aljaferia Palace, an important piece of Moorish architecture. 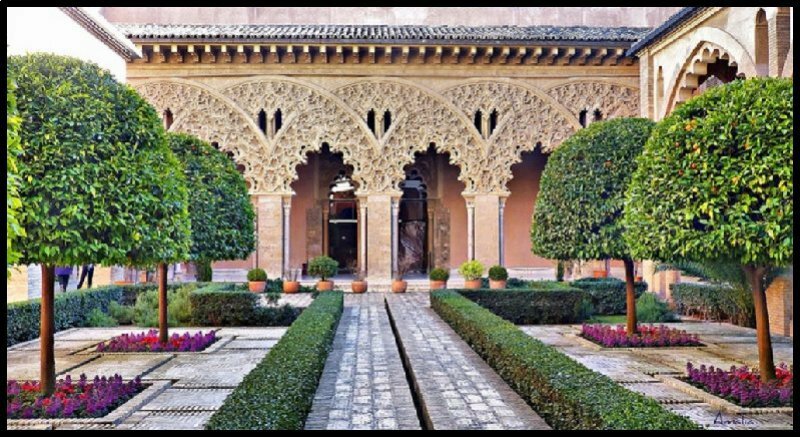 It was built by the Islamic rulers in the 11th century but over the years, has undergone many changes and renovations, The Catholic monarchs Fernando and Isabel used it and made changes when their rule began. From the outside the building has the appearance of an imposing castle but on the inside it is a typical Moorish palace with features similar to those found at the Alhambra in Granada. . Today it is home of the Aragón regional parliament. 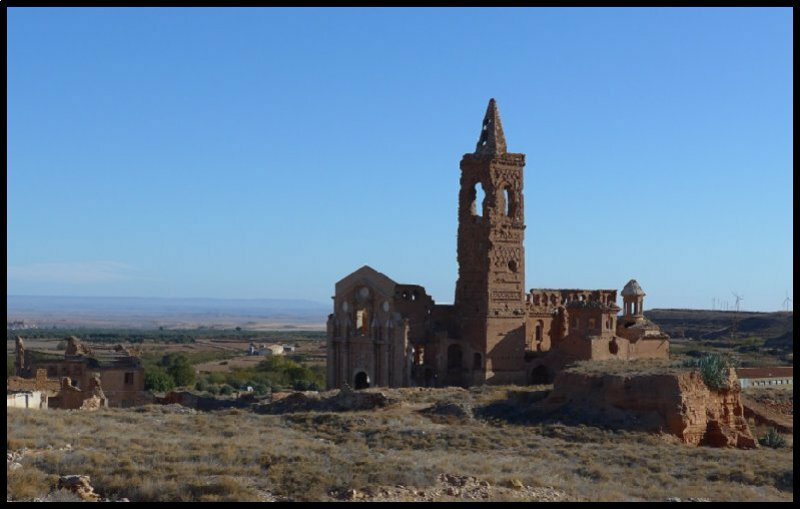 On Monday I set out from the site to drive 40 miles to Belchite. 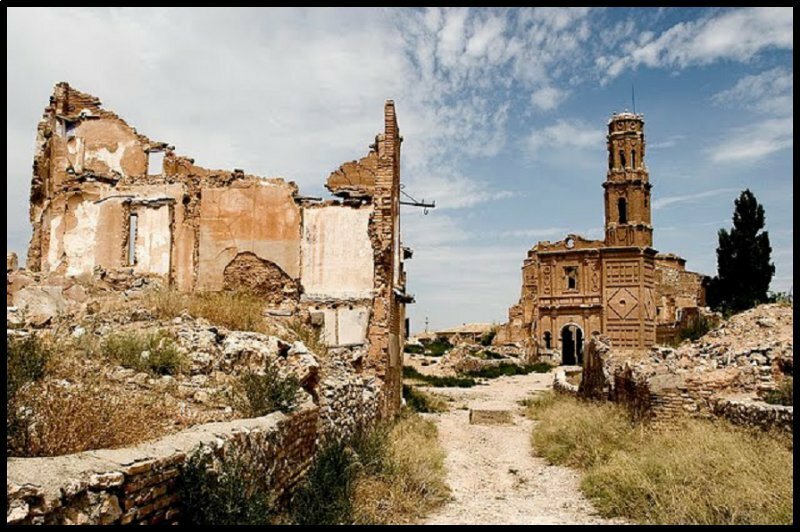 It was here, eighty years ago, that one of the many atrocities of the Spanish Civil War took place. 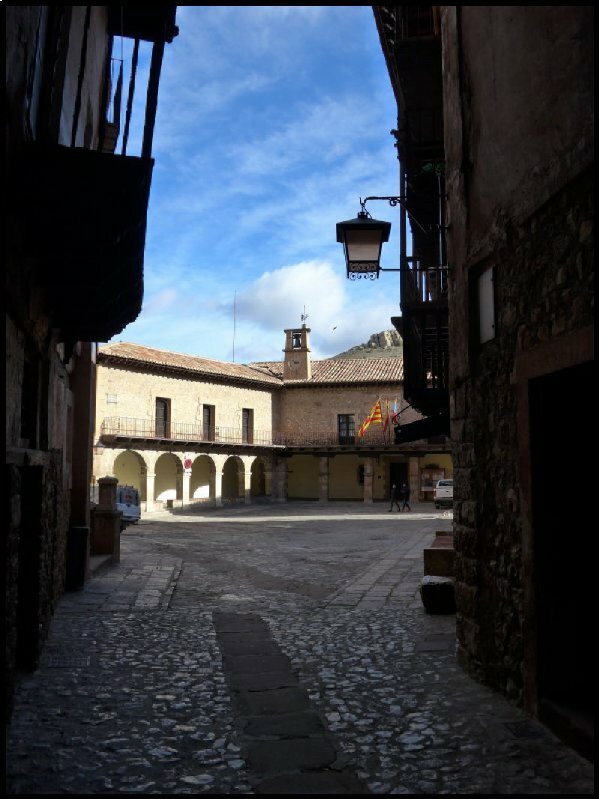 The Republican forces had occupied most of the small towns in Aragon. In September of 1937 Franco’s Nationalist army attempted to dislodge them but the Republican forces repulsed the attack and they held their ground. Not to be outdone, Franco called on Hitler for help. It was a heaven sent opportunity for the Condor Legion of Göring’s Luftwaffe to show off its newly acquired Stuka dive bombers. 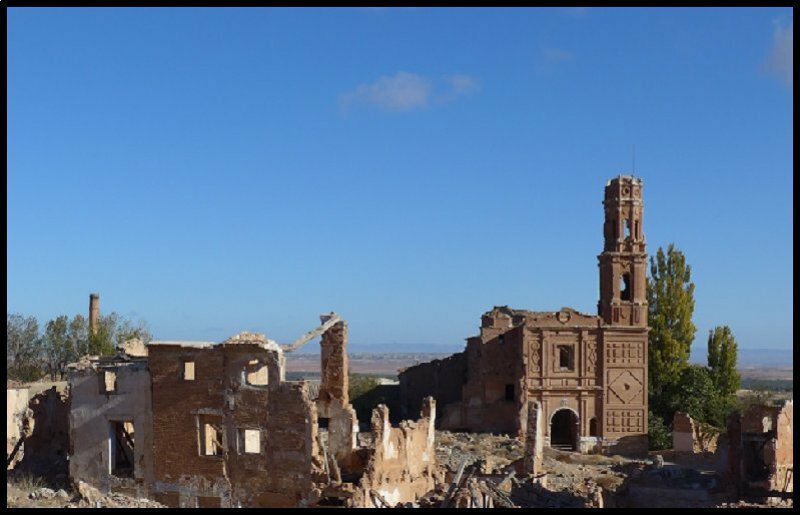 Over the course of the next two days thousands of townspeople were killed leaving the town completely in ruins. Franco rounded up all the Republican sympathizers, put them into concentration camps, then forced them to build a new town nearby. He ordered that the old town should be be left as a ruin to serve as a warning to any who wished to oppose him. Tomorrow will be time to move on again. As I set off on my drive yesterday I noticed an Alcampo filling station less than a mile from the site, so before I hitched on the caravan this morning, I drove up the road to fill my almost empty tank. It was a card-only station without attendants, but what a price! €0.975 per litre. That’s the GBP equivalent of 85p. So having filled, it was up to the next roundabout, down the other side and I was back on site ready to collect the van.. And more than a little bit concerned about the strong wind which has been blowing for a couple of days. Generally, except for the overnight rain a couple of days ago, the weather has been good with fairly clear skies but there’s been the ever present wind. Looking at the forecast for the towns still to come on my itinerary, the wind is going to persist. So it isn’t an option to wait until tomorrow. On the road, my Tomtom guided me along fairly traffic free roads, through the outskirts of the City till eventually, I reached the A23, the road I needed for this next section of my route. It’s a toll-free dual-carriageway and this morning, traffic was very light. After fifty miles or so I was disappointed to see only 24.7mpg as my average fuel consumption, but then I noticed the altitude reading – almost 3000 feet. 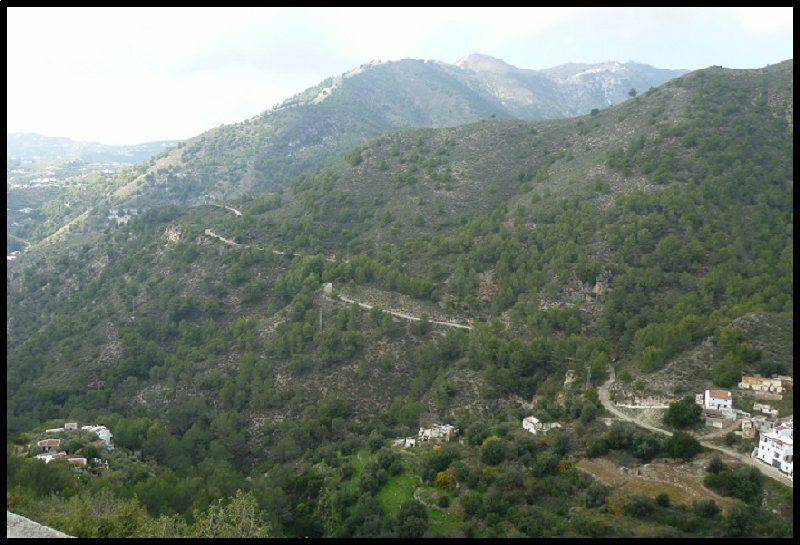 The route so far had been a constant gentle climb after leaving Zaragoza at around 600 feet. After 100 miles Tomtom indicated that I should turn right off the motorway, so with 20 miles still to do and with some trepidation I turned onto what looked to be a four-figure country road. But once through a village, I bowled along for the next 14 miles. 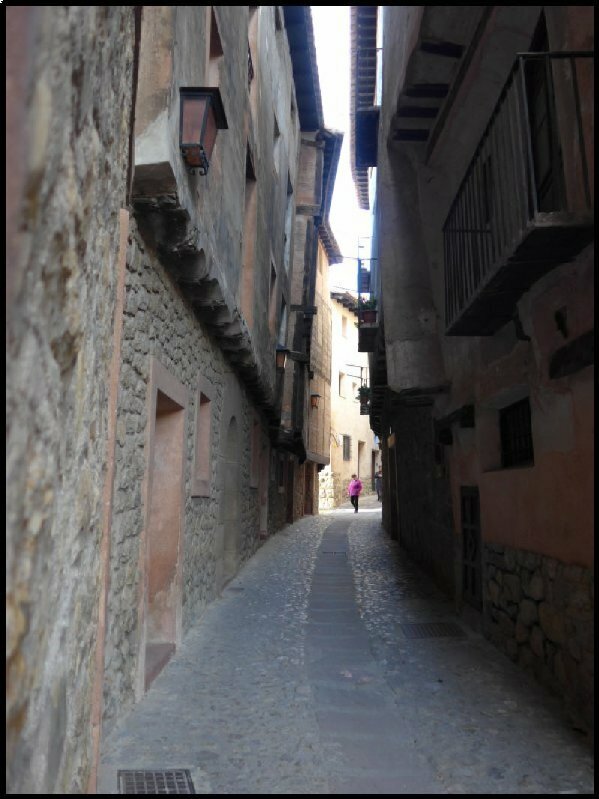 Only in the last seven miles did the road begin to twist and turn till eventually I arrived at Albarracin. The site is well signed through the village. 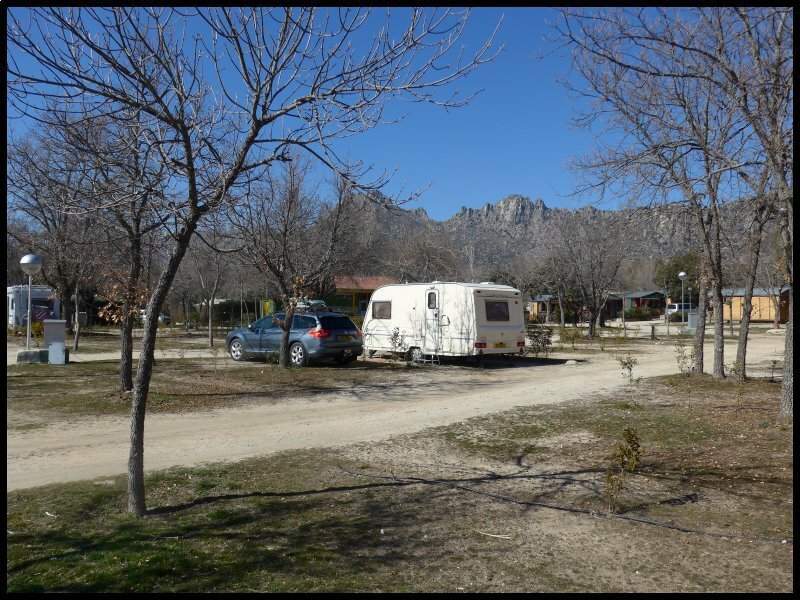 Some caravanners might think that a site situated in the mountains and twenty miles from the motorway is a bit too far for a one night stop – and maybe it is. But the village – I shouldn’t refer to it as a village because it has a cathedral so that makes it a city – should be on everybody’s to-see list. 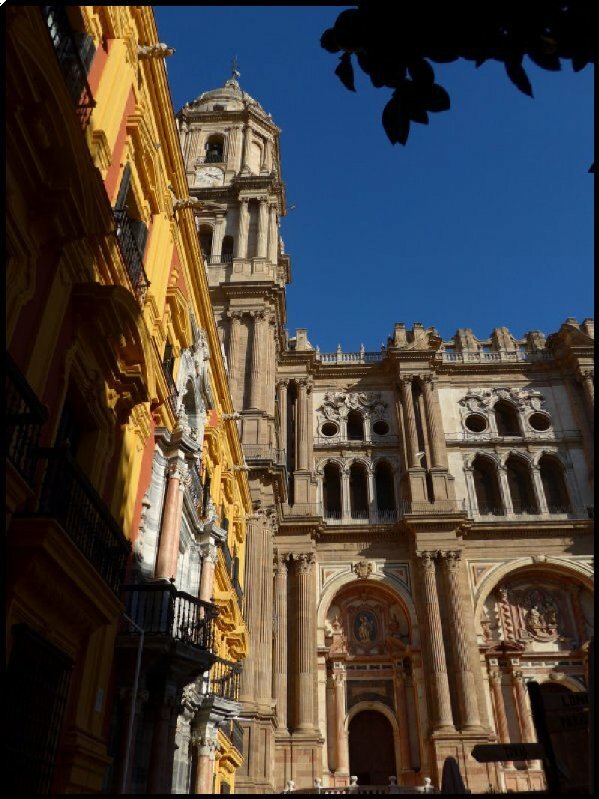 Certainly when a Spanish national newspaper ran a competition for Spain’s most beautiful town, this one came high on the list. However, I arrived and went to reception. I proffered my ACSI card and it was accepted for €17 per night. Together with the wifi key, I was told to park where I wished. The site is situated on the edge of town with the pitches being on both sides of a central road. The toilet block is centrally placed so I chose a pitch close to the block. Most of the pitches have been bulldozed level with a high bank to one side, and a drop at the other. Security fences run along both sides. Parts of the site is shaded by mature trees. The toilet block appears to be comparatively new and modern. Sinks have mixer taps with very hot water. Showers are very well equipped with hooks, a dividing curtain and a mixer shower head which is removable. The electric bollards have two pin sockets so an adapter is required, but the supply was sufficient to power my 2KW kettle at the same time as the 500W fire was operating. Did I mention that it was cold? Afternoon temperature in full sun was only 11oC and by late evening outside was down to 3.4oC. But that’s to be expected at nearly 4000 feet! I was ready to visit the old city by 9am so I did the short drive down through the newer part of the town and found a car park. More younger and active visitors would find it an easy walk. The ancient part is built on and into the mountain side, consequently every where is a climb. Only authorized vehicles are allowed to use the road way to the top. Visitors either take the steps or walk up the hill. I chose the hill. Of course the Romans were here. Where weren’t they!? But even before them there is evidence of earlier habitation because not too far away, higher in the mountains, cave paintings have been found. 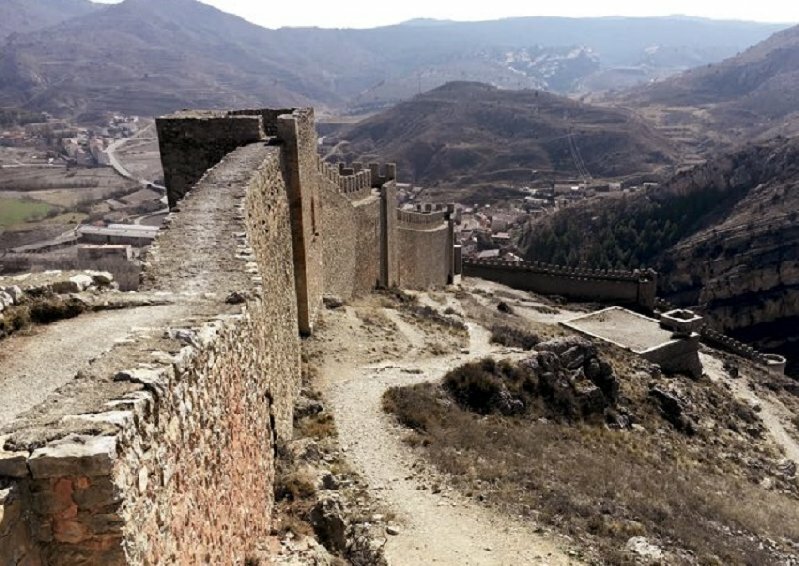 But the more modern history begins in the 11th Century when the Castle and City walls were built by the Arab invaders. 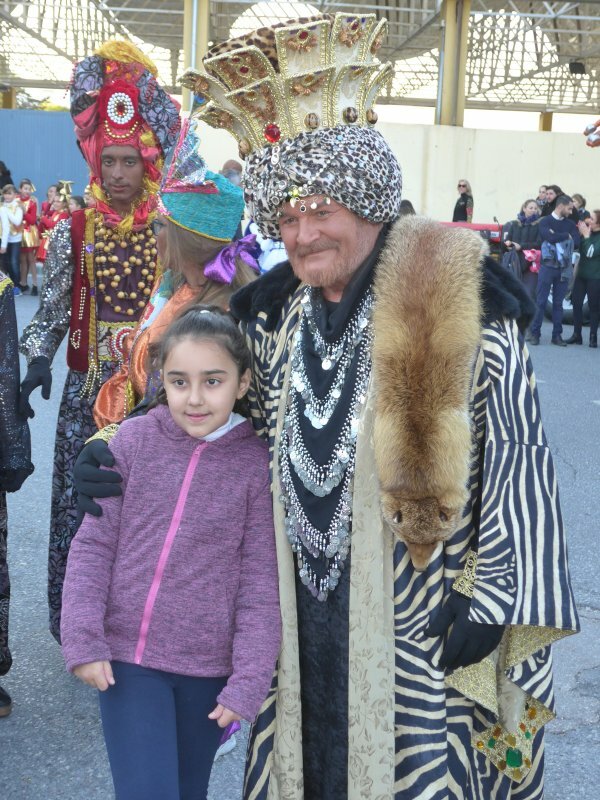 During the next two hundred years the City and surrounding lands changed ownership between rival Arab dynasties several times but by the late 1200’s the Moors had been driven out of Aragon. 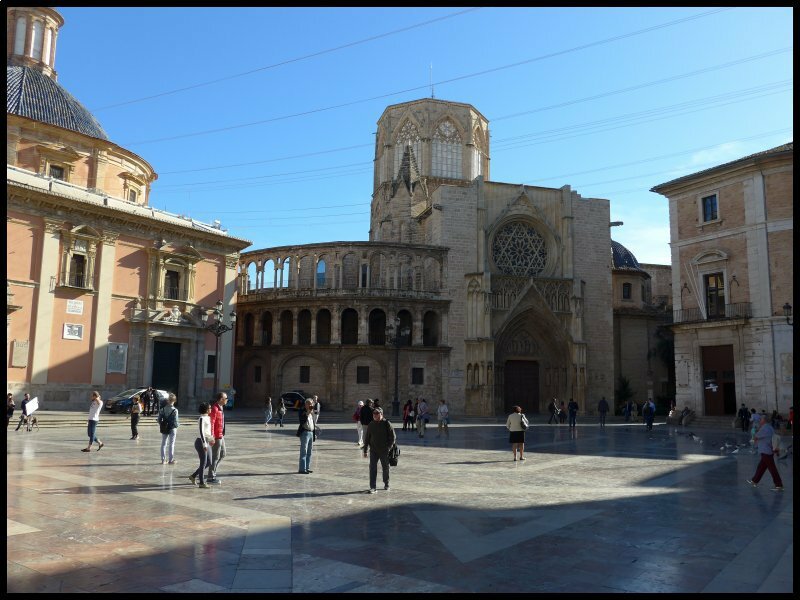 In the 16th Century the Cathedral was rebuilt on the footprint of a previous mosque. Sadly on the day I visited I found the building locked and barred because of building maintenance going on inside. 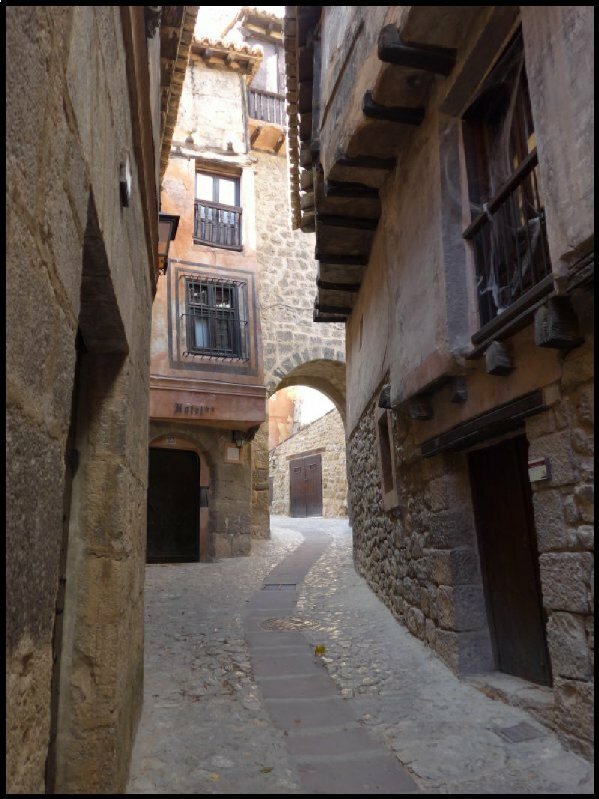 I contented myself with wandering up and down the narrow, steep streets of the medieval city. Looking down into the river valley, the leaves were just beginning to fall. The sunlight caught their gorgeous colours beautifully. This next leg of my journey was 120 miles down to Valencia. 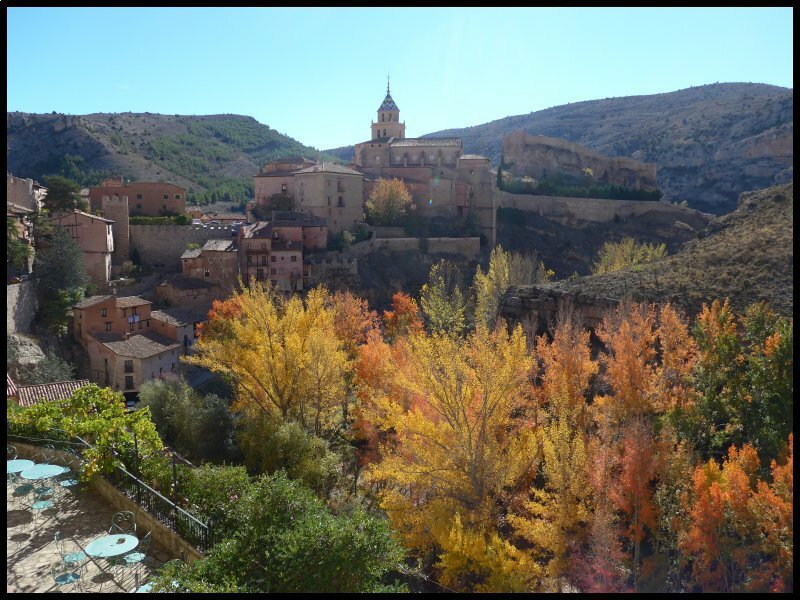 As I said previously, the seven miles closest to Albarracin is a twisting, mountain road down to the junction with the road I came in on. Instead of taking that road which goes north to the motorway, I took a different one going south. For twelve miles the road went arrow-straight, across a slightly sloping plain, down to the motorway. Obviously it was a fairly recent build. Far over to my left I could see what looked like an airport because I could make out the tail fins of aircraft. But it was strange! As I got closer instead of seeing one or two, there were dozens of them. All closely packed together. Eventually I arrived at a T-junction and saw the sign “Teruel Airport”. Within another few minutes I’d reached the motorway – but for a while I couldn’t help but wonder why a small provincial airport had so many planes. 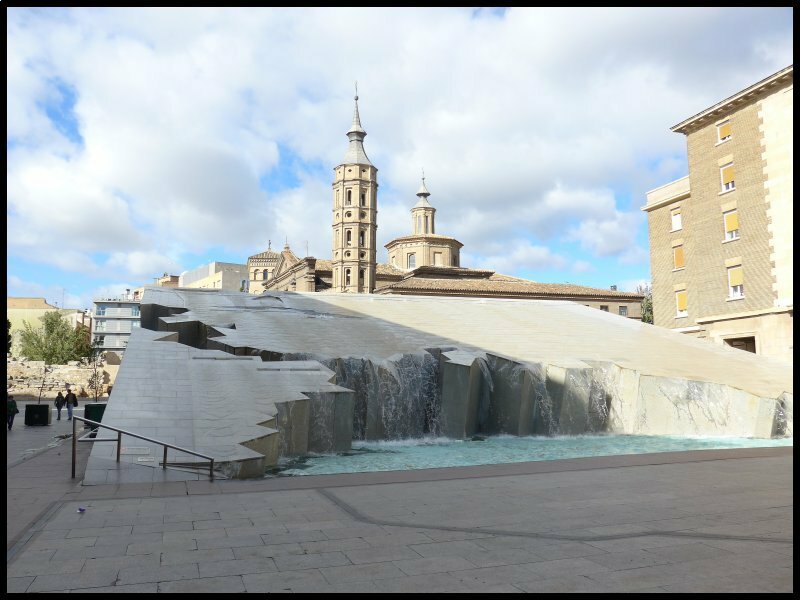 Next day I Googled “Why so many planes at Teruel.” Being Google – they had the answer! 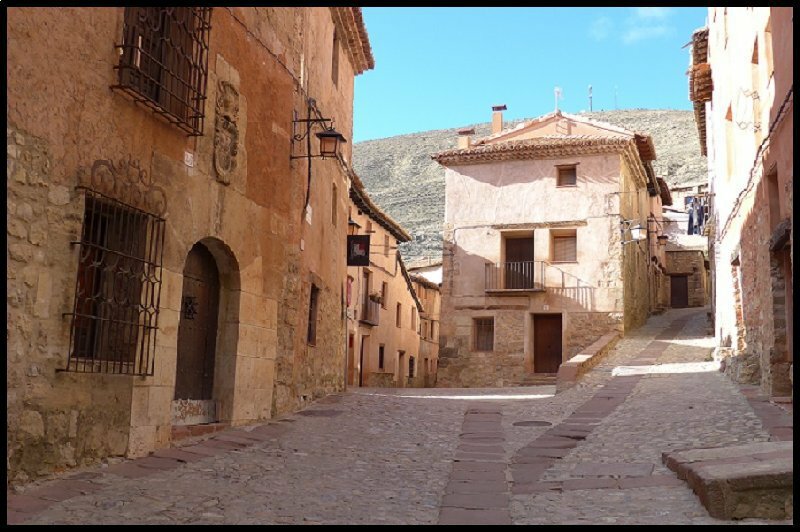 Unlike the rather depressing average fuel consumption on the day of my arrival from Zaragoza – 25.4mpg, the drive from Albarracin to Valencia was generally downwards, so I ended the run with a much better showing – 36.2mpg. The only thing to mar the journey was that my Tomtom chose to take me through the city centre. Hair-raising just about covers it. 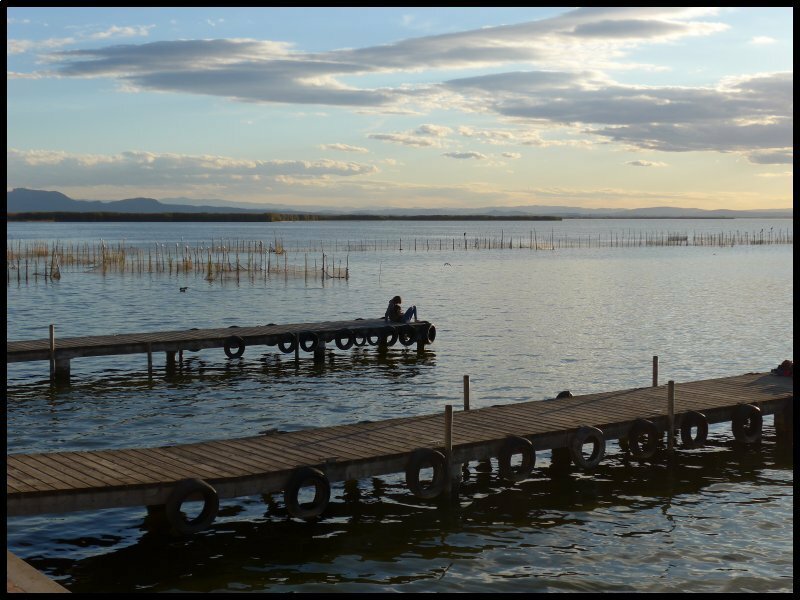 From several ACSI sites around Valencia, I chose Coll Vert which is on the coast road, south of the city but close to the Albufera Lake. The site was quite busy mainly with motor vans. After check in with my ACSI card being accepted for €14 per night, I was directed to a pitch which had tennis courts behind. On the other-side of the courts was the main road with occasional traffic noise which some campers may find intrusive, but with my poor hearing, was no problem. Toilet blocks were clean, having all the usual facilities but were looking somewhat tired, however everything was fully functioning. Free wifi was available close to reception but a login key which gave reception on your pitch was available at €2 for 24 hours. I decided to pay for one day but my connection was still available after 36 hours of use. Within ten minutes of getting set up, I had my first visitor. 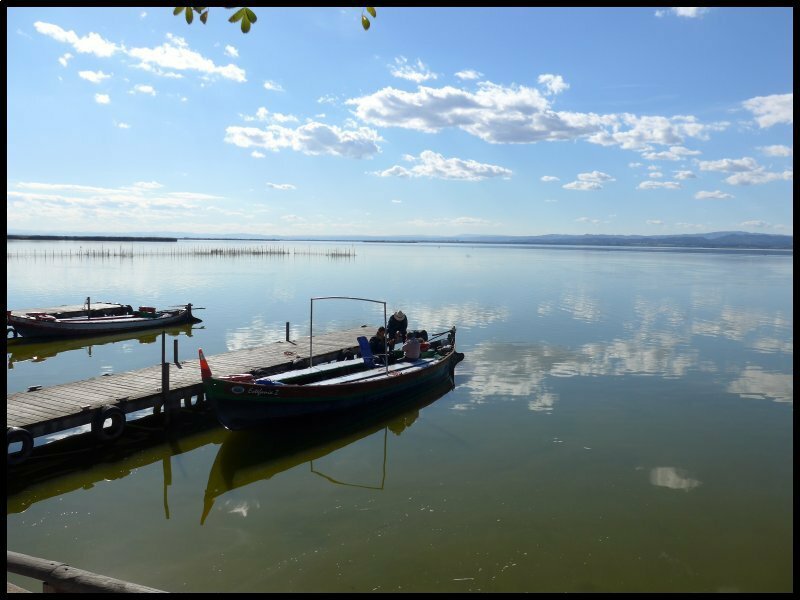 As it was still only mid-afternoon I drove the three miles down to the landing stage at the Albufera. Fortunately there was a parking space empty. What a beautiful view across the water. And what an amazing place. A huge stretch of fresh water covering an area of around 80 square miles which was once a salt water lagoon but by building sluice gates at various spots, to control the outflow from the lake, the water has now lost it’s saline content. And yet the sea is only a few hundred yards away across the dunes. Fresh water fish abound in the waters which local fishermen catch in large tunnel nets. Also some salt water fish make it through the sluices when they are open to the sea. The wetlands surrounding the lake are ideal for growing rice and because of the rice production, paella is a favourite dish in the area’s restaurants. 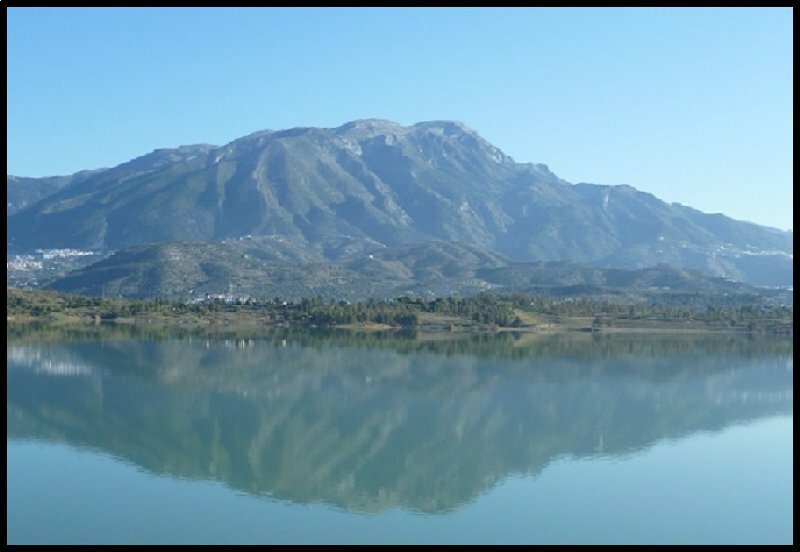 There are even Valencians who claim that paella was first invented around the lake. Who knows – they may be right – but rice was first introduced into Spain by the Moors when they arrived in Spain. 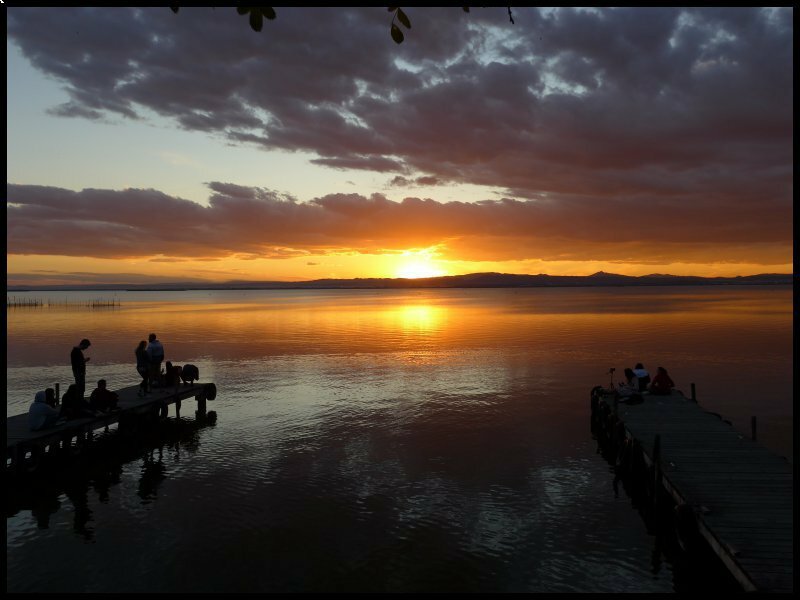 As I stood and admired the view I heard someone mention the sunsets which could sometimes be seen. As it was a fairly clear day, I decided to return at 5.30pm. I wasn’t disappointed! Early on Friday morning with the coordinates of a couple of car parks in the centre noted down, I set out to drive into the city – some nine miles away. What a disaster! I couldn’t find a parking place anywhere. 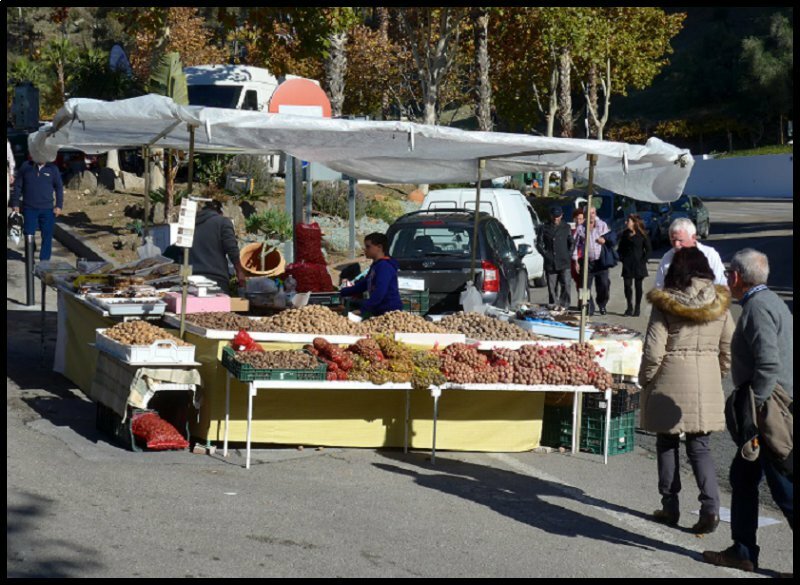 After picking up a few necessities in a Mercadona, I returned to the site and went to talk to the receptionist. She told me about the route 25 bus service which ran from the site entrance into the city. I returned to the van, had an early lunch and was at the stop in time for the ten past one bus. It took half an hour and cost the princely sum of €1.50. With the aid of a map also given to me by the receptionist, I set off to walk to the cathedral. 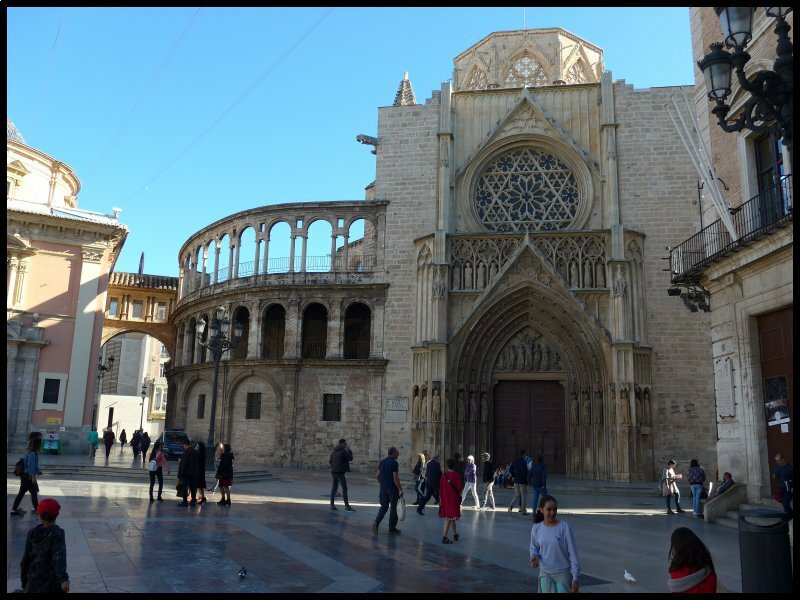 After what was to me a long trudge up a busy shopping street I arrived in a plaza with the cathedral at the far end of it. I have never seen so many beggars congregated around one entrance. There must have been ten of them, some making the most of their deformity. 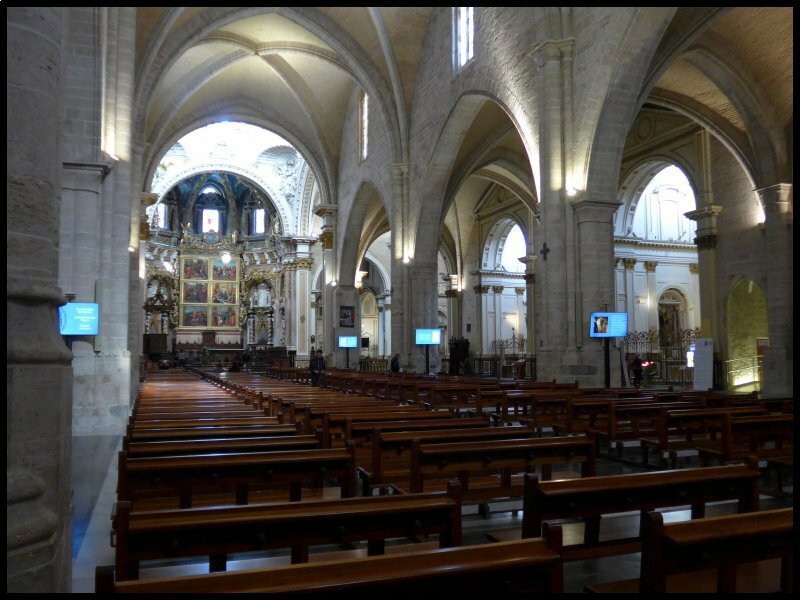 Most parts of the cathedral were built during the period between the 13th and 15th centuries. A previous nearby mosque was dismantled as the cathedral was being built. 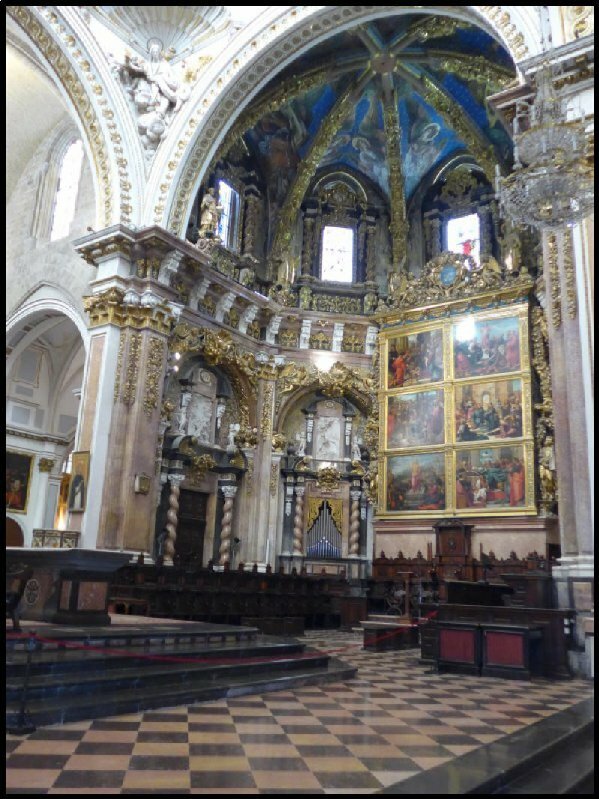 In a chapel behind the high altar is what is claimed to be the chalice used by Jesus when he held the last supper with his disciples. Experts however are of the opinion that it’s no older than medieval. Another gruesome exhibit is that of a severed mummified arm. 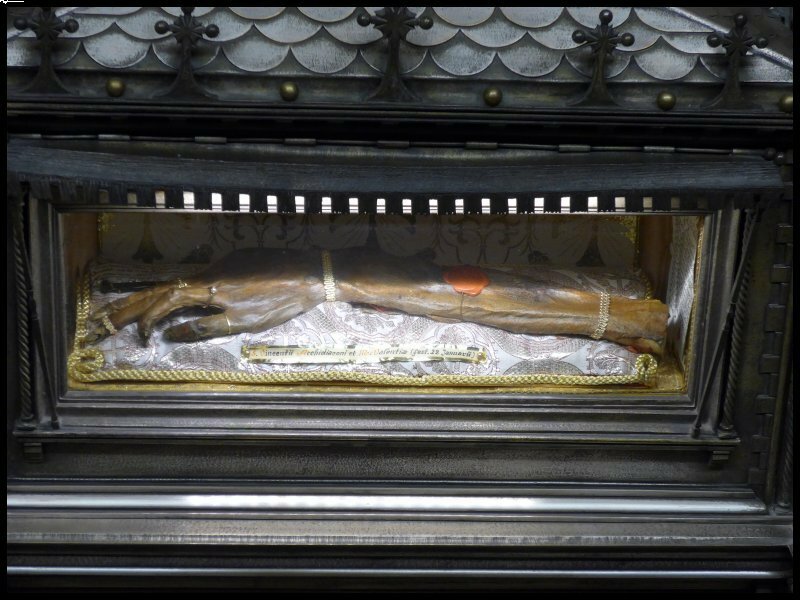 It is said to be the arm of St. Vincent the Martyr who was imprisoned and tortured by the Romans in the third century. 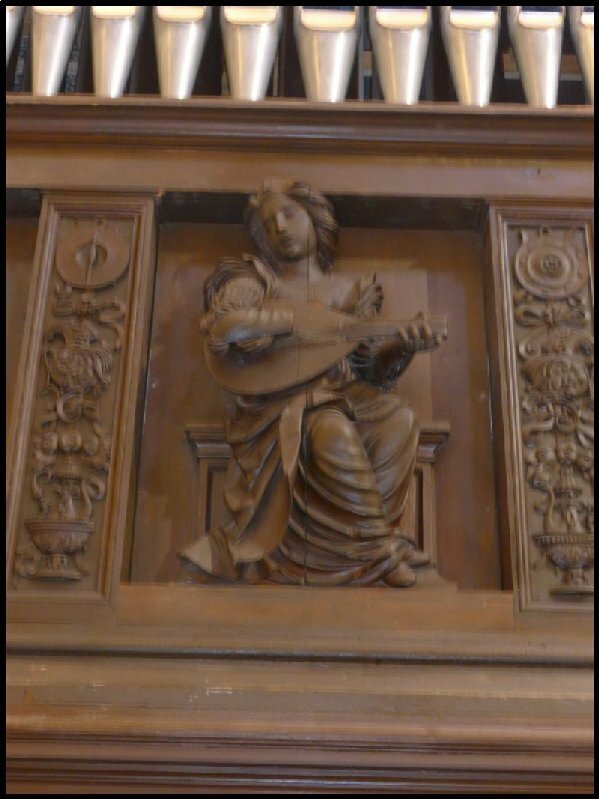 As a wood-worker myself, I stopped to admire some of the wood carvings which were so beautifully worked. One cannot help but wonder at the skill of those ancient craftsmen. As I came out of the cathedral two of the beggars were just packing up for the day. Amusedly I watched the two women load all their belongings into a two wheeled shopping trolley, light up their cigarettes and go off home together. After a walk around the outside of the cathedral I returned to the bus stop. 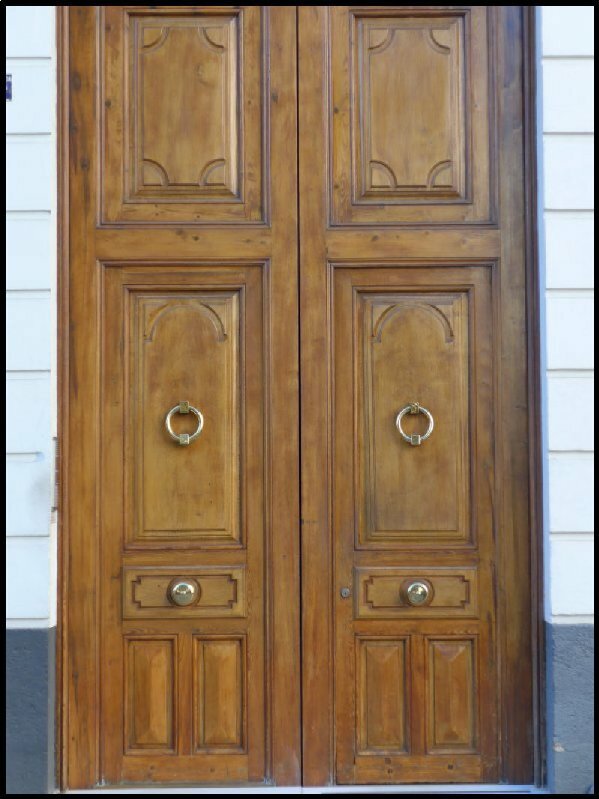 On my way back I couldn’t resist photographing what must be the biggest pair of knockers in the entire city. Tomorrow I move on to Cartagena. My two nights at Coll Vert had cost me just €28. Now I had 190 miles to do to reach Cartagena so I left the site by 9.15. 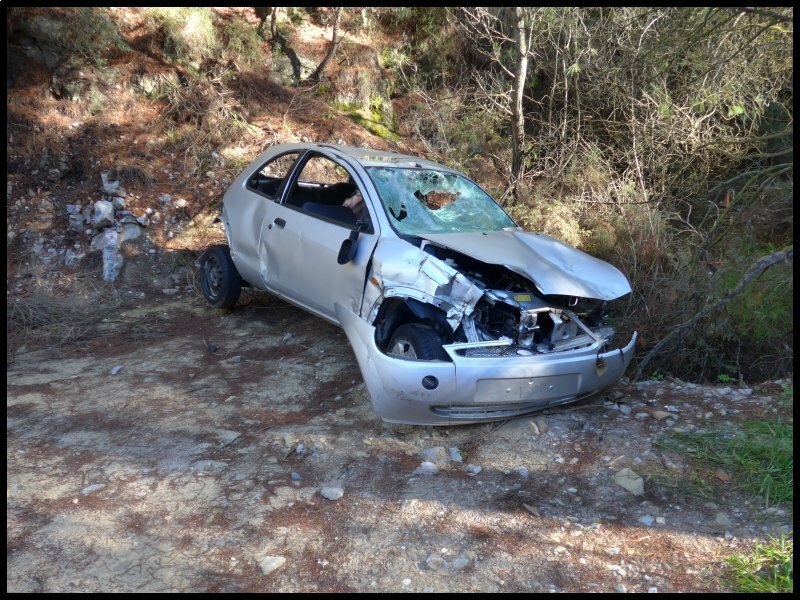 Within minutes I was on the local main road heading north towards Valencia. Having reached the ring road my next direction sign was for the V31, the motorway heading south out of the city. After eight miles I reached a point where I had a choice between the toll-free A7 or the peage AP7. I chose the A7. After about 30 miles my Tomtom directed me to leave the A7 and take the A31. After a couple of minutes of indecision I decided to go with Tom’s suggestion. In another 20 miles I was directed on to a road with two way working which was in the process of being converted to motorway. However that didn’t go on for long before I joined the A31 which eventually rejoined the A7. The Spanish highway authority has done a wonderful job with their motorway system except for the fact that they’ve omitted to build any rest areas alongside them. All the more amazing when you see the amount of uncultivated scrub land alongside most routes. All they have are signs directing drivers into a nearby filling station – very often in a nearby village. After driving for around two hours I was becoming desperate to find somewhere to stop and have a stretch of the legs. But there was nowhere. Finally after about 120 miles I arrived at a picnic area with a cafeteria. It was time for either a late coffee break or an early lunch. I decided on an early lunch and a beer – followed by 30 minutes doze. Back on the road, and before long I was seeing signs telling me that it was 60Kms to Cartagena. But what I’d momentarily forgotten was that my destination was another 16 miles along the coast – and over yet another range of mountains. That last 16 miles was particularly slow because much of it was along quite a narrow, steep mountain road with some nasty bends in it. Finally, down on the coast road I found that Tomtom and Google Earth had taken me to the very entrance to Camping Los Madriles. I checked in with my ACSI card and was given a plan of the site with the available pitches marked with green pen. There weren’t too many of them. The central road through the site is on a fairly steep gradient however, the lanes to both sides of the road are in terraces with all the pitches being flat and levelled. I found a suitable one close to one of the toilet blocks. None of the pitches could be described as large. At 6.4 metres long, my van had just sufficent space both behind and in front, but a longer van would have difficulty. Also width wise – it was a tight fit to comfortably squeeze the car alongside. Each pitch was separated by hedges and on each there was a water tap and a drain outlet. The electric power supply box – which was locked – was on the next higher level so to connect and disconnect was quite a long walk. Toilet blocks had the usual equipment which was modern and clean. However no toilet rolls were supplied. At 5.30, noticing the position of the sea in relation to that of the sun, I decided to drive a couple of miles along the coast road. I was just in time with my camera. I drove the fifteen or so miles up over the mountains and into Cartagena. Tomtom took me to the entrance of the underground car park, but then I drove on along the promenade. Eventually I arrived at a piece of waste ground where parking was available. But then having looked at the map, realised how far it was to walk back along the prom and into the town. I decided to return to the underground park and pay the fee. Out on the prom again, I stopped at the enquiries for the Tourist Bus. I thought it might be my solution to getting around the sites, but I discovered it didn’t make stops so I rejected the idea. I took a walk and found the Roman Theatre. The dedicatory inscriptions to Gaius and Lucius Caesar and Augustus places the date of this theatre to before the birth of Christ. 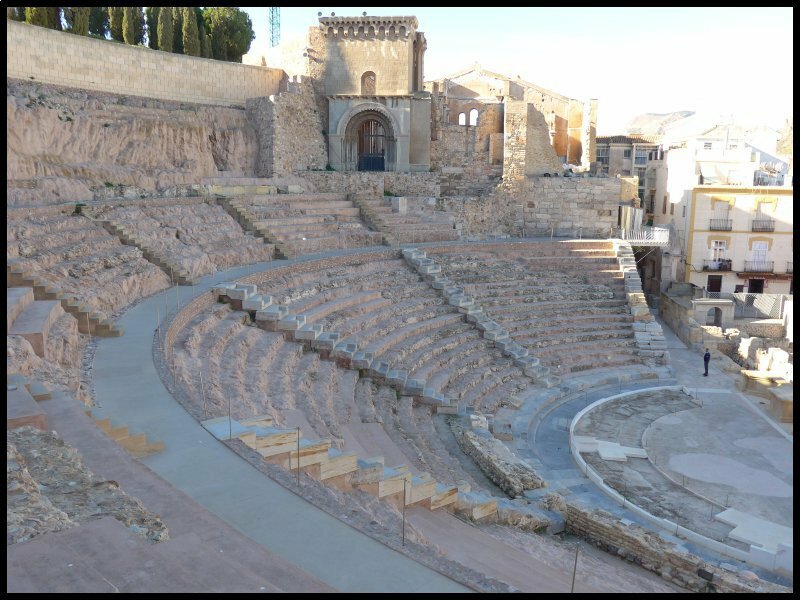 It was built on the same lines as most Roman Theatres with three sections of tiered seats. This particular theatre was only in use for 200 years before gradually becoming buried with newer buildings being erected over it. Only in 1988 when a 19th Century building was being demolished was the Roman work discovered. My next stop was to see the air raid shelters built during the civil war. Cartagena being a seaport, was one of the main routes for incoming food supplies and also armaments for the fighting taking place in Madrid. A Newspaper photograph taken at the time. For that reason it became a frequent target for Hitler’s and Mussolini’s air forces and navies. 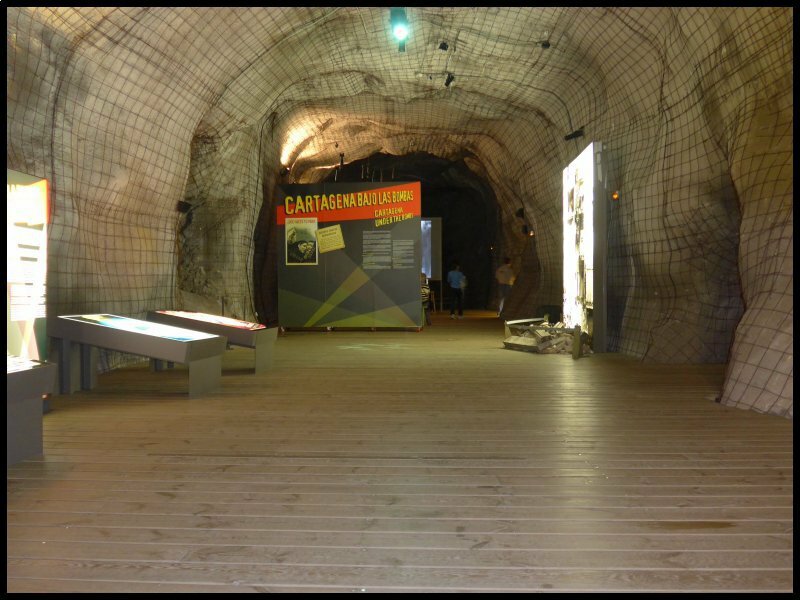 The museum mentions one particular air raid on the 25th Nov. 1936 which went on for over four hours. The whole civil war period must have been quite bewildering for young children. By the time I’d made it back to my car, I’d had enough. It was time to head back to the caravan. 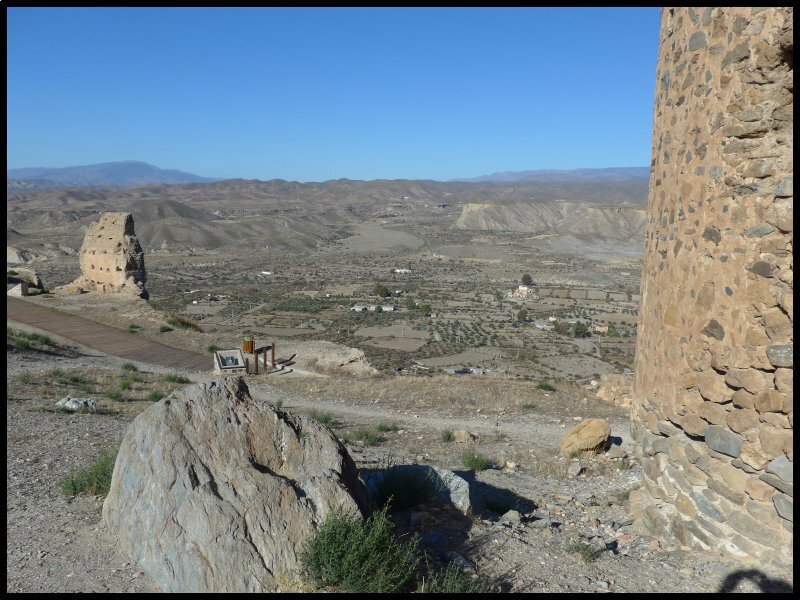 The drive was uneventful and after two and a bit hours I reached the slip road leading down into Almeria. Camping Garoffa is on the old coast road so it was necessary to drive to the first roundabout in the town, then double back to filter off to the N340. After four miles my Tomtom told me I’d reached my destination – but I saw no sign of the site. I drove on – for a couple of miles – before turning and coming back. Only then did I see the camp sign – pointing down a narrow road heading to the beach. I offered my ACSI card and checked in at €17 per night. The receptionist told me to take any pitch – but “don’t park your car on a second pitch”. I drove on down the twisting road passing some very tiny pitches. Finally I stopped and got out near to the toilet block to see what was available. My first thought was to recommend that you give this place a miss. Most of the pitches have sun shades. Not on slim poles but on pairs of 4” I beams. All of the reasonably sized pitches had already been filled so I inevitably had to settle for a smaller one. 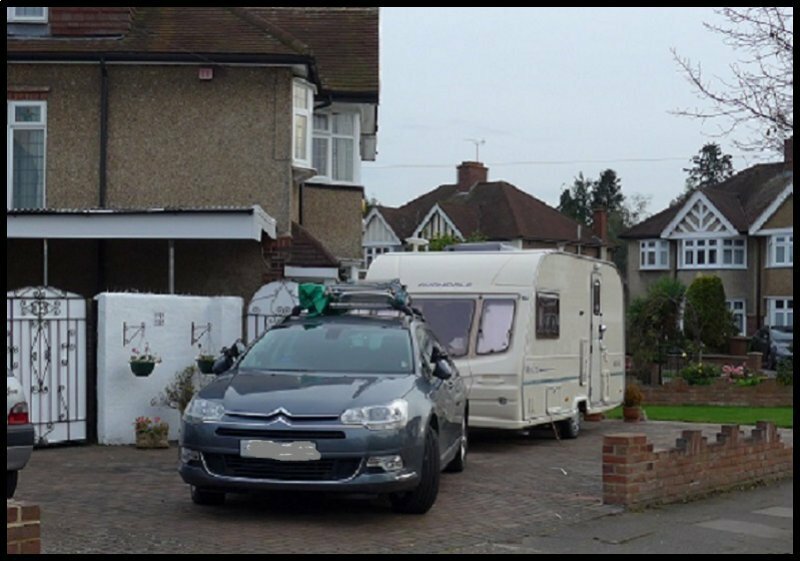 Many just weren’t deep enough to accommodate my caravan’s 6.4 mtr length. Others were too narrow to accommodate car and caravan along side each other. Finally I found one – but then I noticed that most of the pitches had a curb. The narrowness of the roadways didn’t allow for reversing – especially with all the girders and trees. Finally I unhitched and applied the mover. Even with the mover I couldn’t mount the kerb. A couple of ramps and the help from a burly German guy finally got the van in place. Providing the wing mirrors were folded, I could just manage to squeeze the car alongside the van. So far I’ve told the negative side of the site………………………… Here’s the positive. The toilets and showers were all fine. The shower water was hot and adjustable for temperature with a good pressure of water. There was a nice laundry room with a washing machine if required. Just one peculiar thing – a notice in every toilet cubicle requests that paper be deposited in the bins and not flushed down the pans. Could it be that the toilet flush goes straight out into the blue sparkling water of the bay? 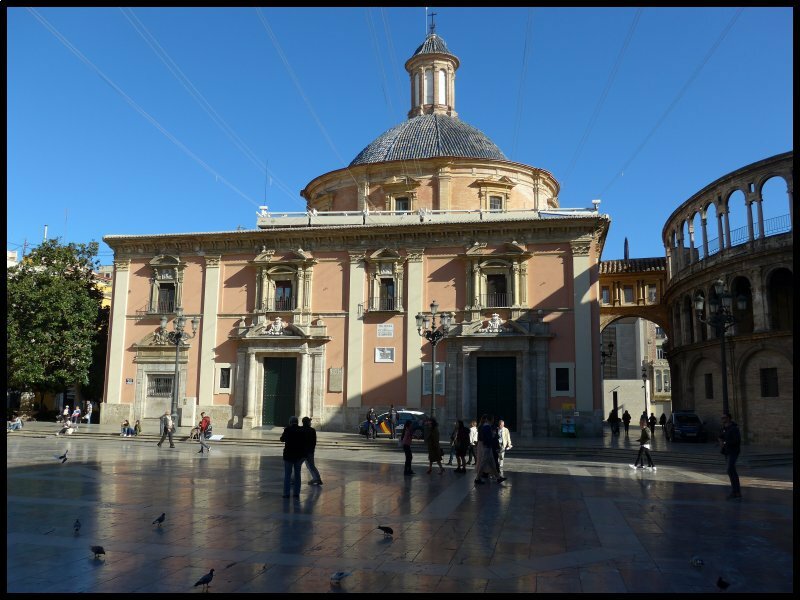 Early on Tuesday morning I drove into Almeria to an underground car park which was not too far from the Cathedral. 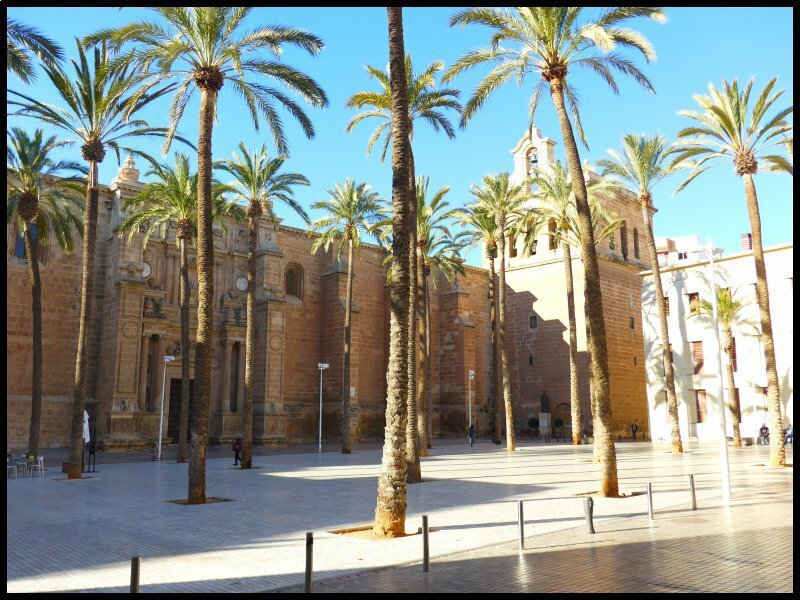 Ten minutes walk and I was in the lovely palm tree shaded Plaza outside the Cathedral. 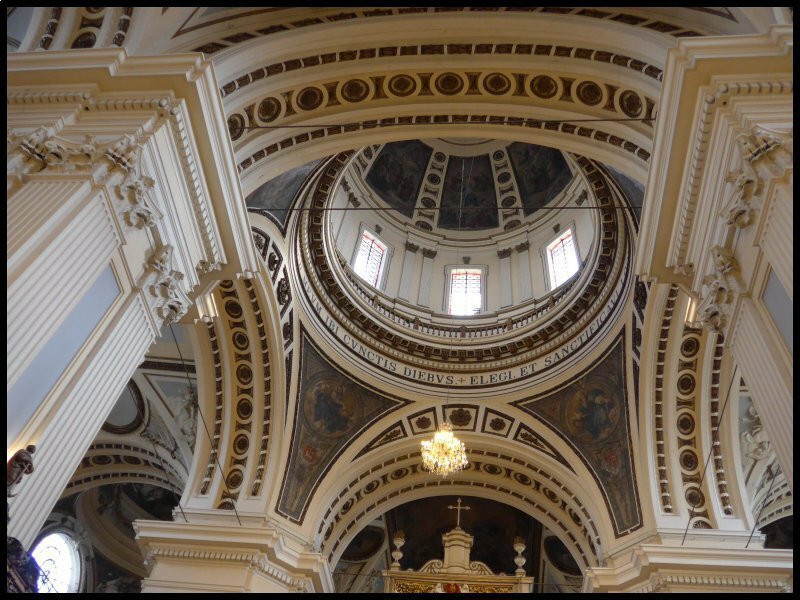 This Cathedral could be mistaken for a Castle with its towers, high windows and loop holes. That’s because when it was built in the 16th Century to replace an earlier one severely damaged in an earthquake, it was intended to have a dual purpose. Not only was it a place of worship but also a place of refuge against marauding pirates attacking from North Africa. 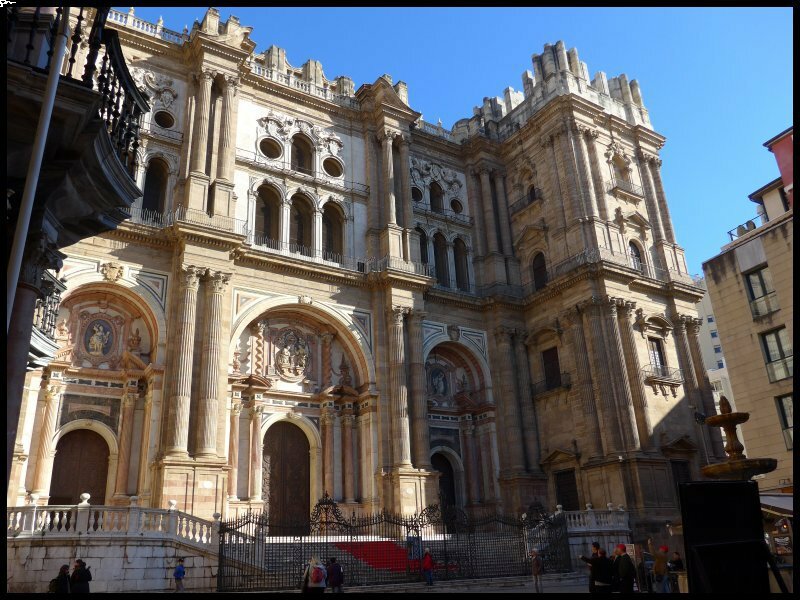 As with many other Spanish cathedrals, this one is built on the footprint of a previous mosque. 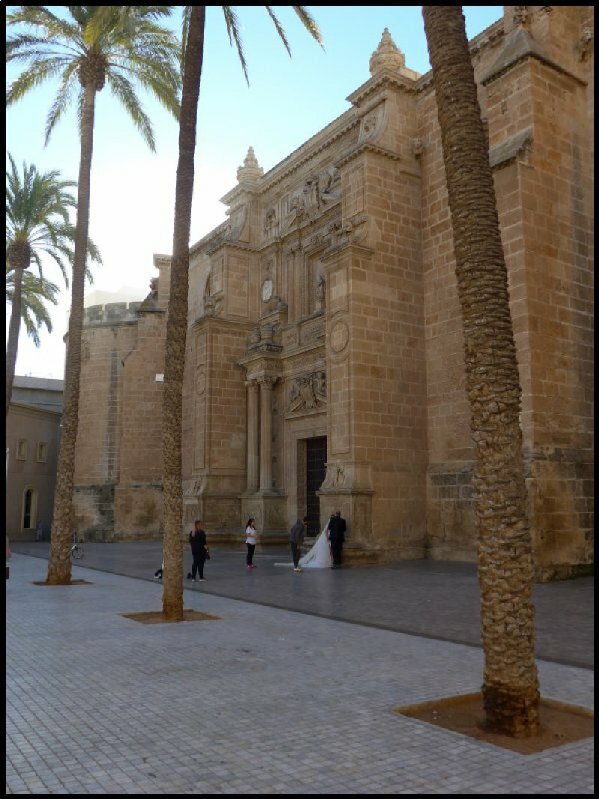 When I arrived in the Plaza a couple were having wedding pictures taken. Whether they were a newly married couple or models having fashion photos taken, I know not. But I joined in. Then I pulled open a door behind the couple which led into the Cathedral porch. I went in but to my surprise I was quite alone. I walked around the aisles, surreptitiously taking the occasional photograph – notices forbade photography! But then after ten minutes a young man suddenly appeared ushering me towards the door. Apparently I wasn’t supposed to be in there because they didn’t open till 10am and I’d by-passed the ticket office at another entrance. During my research for this tour I’d seen on Google Earth a piece of waste ground close to the Castle which had cars parked on it. I’d already noted down the coordinates so I returned to the car park, paid the fee and headed off up the road. 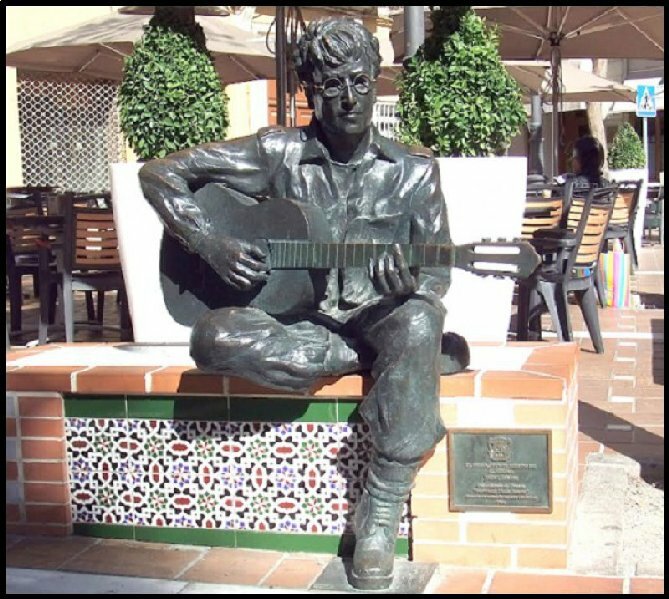 On the way I pulled into a loading bay in the Plaza de las Flores and grabbed a quick photo of Beatle, John Lennon. 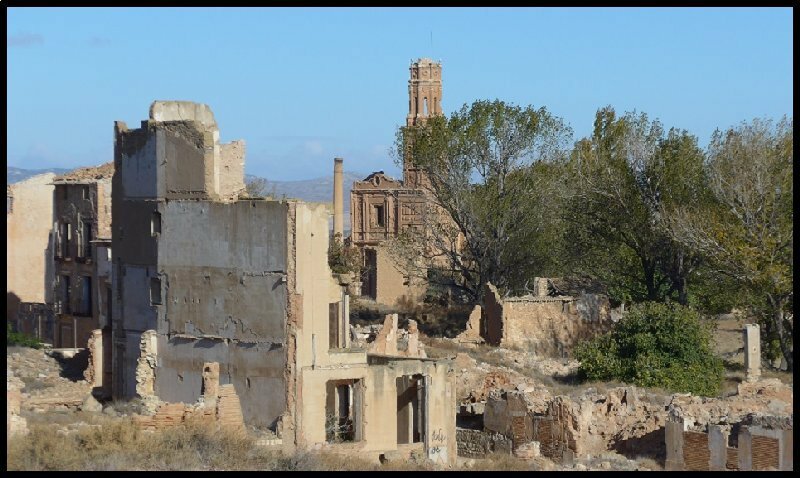 His association with Almeria goes back to 1966 when he stayed in the town for the filming of “How I Won the War”. It was during his time here that he wrote Strawberry Fields Forever. Parked once again, I set off on the uphill walk to the Castle entrance. I arrived at the ticket office to find that as an EU citizen I didn’t have to pay the entry fee. Building at the castle first started during the Arab occupation in the 10th Century but it went on for several centuries afterwards. It is built as three walled compounds each one higher than the last. The lower two are Arabic whilst the top one was built during the times of the Christian monarchs. 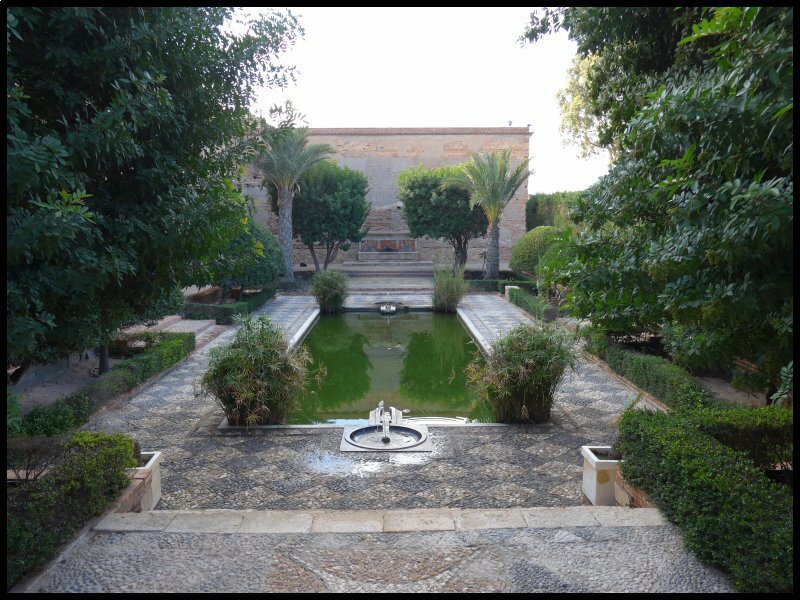 The lowest area has recently been restored in the Islamic style with water features and walled gardens. but then I saw the twisting path up the hillside and although it was steep, it had a good surface so I decided to give it a try and take it in easy stages. Eventually I reached the top. The castle itself is in very poor shape but the views from the top are superb. 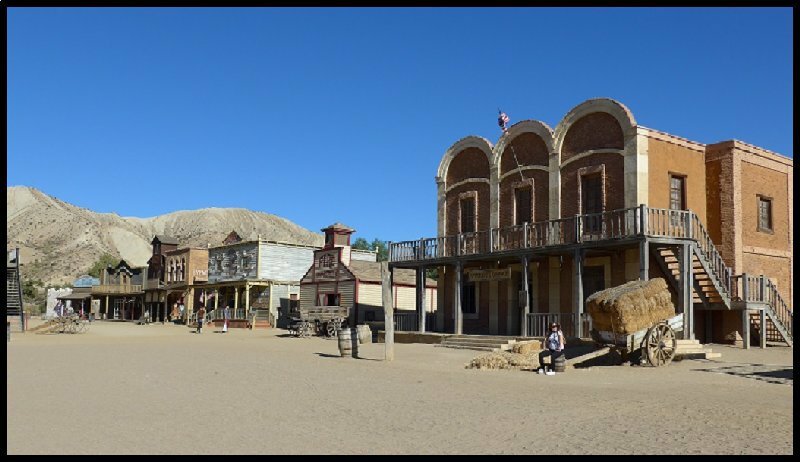 Many of the filming locations which have been used over the years can be seen . in the surrounding areas. A large somewhat tattered information panel pointed to some of them. 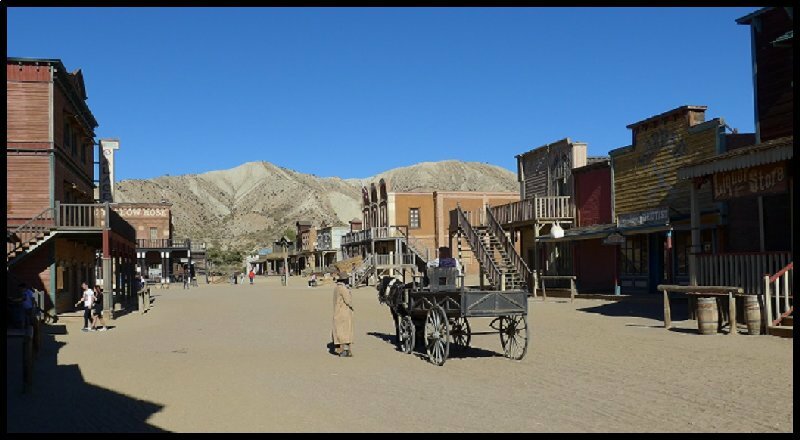 Scenes in Lawrence of Arabia; Patton; Cleopatra; Exodus and several Clint Eastwood Spaghetti westerns have been shot in the area. Back at the car I drove to one of the “Western” towns. Apparently work has just finished on a film to be released early next year. 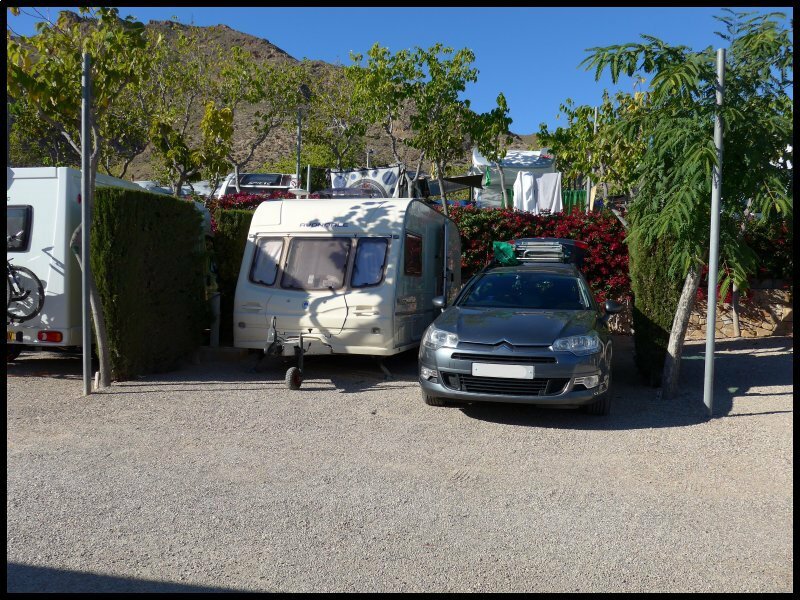 It was time to leave Camping Garoffa at Almeria and head for home. 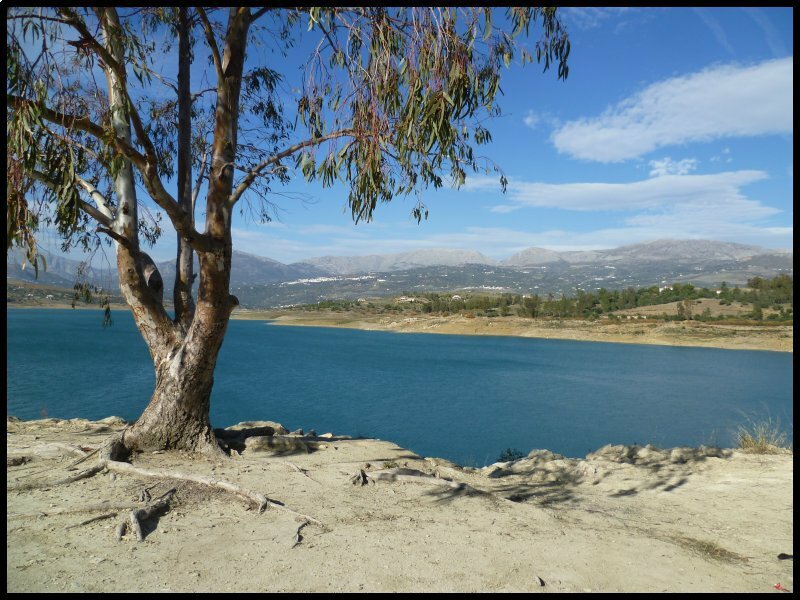 Not home as in HOME – but what will be my home for the next three month at El Pino. 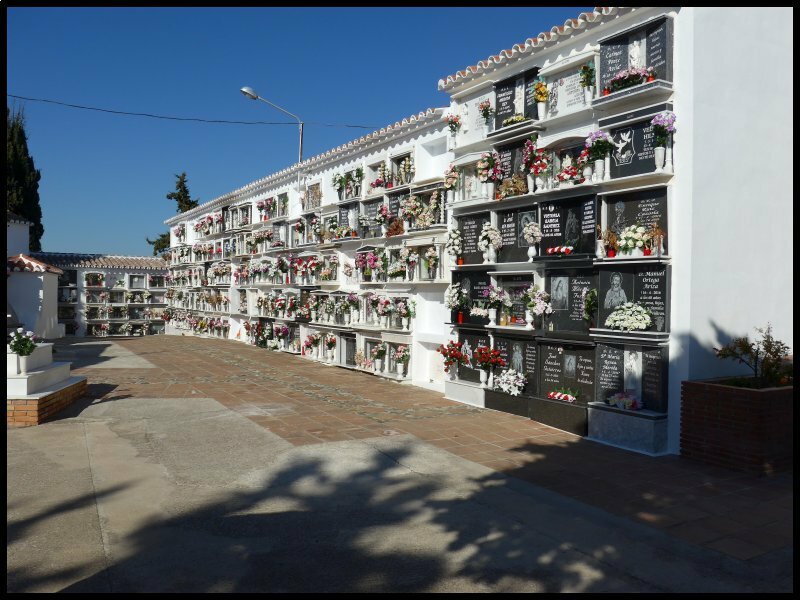 The journey from Almeria to Torrox was just 100 miles and except for a few miles at both ends, it was completely on toll-free motorway – although my Tomtom didn’t seem to know that. It was only 11.15 when I arrived. I parked outside and went into the site. The pitch which I’ve used for the past five years had been kept for me, but during the summer, work has been done – widening and resurfacing the roadway, putting in curb edging and pitch dividers – in short, my old pitch is a bit narrower now than it used to be. Consequently, I chose a different pitch just two places away. 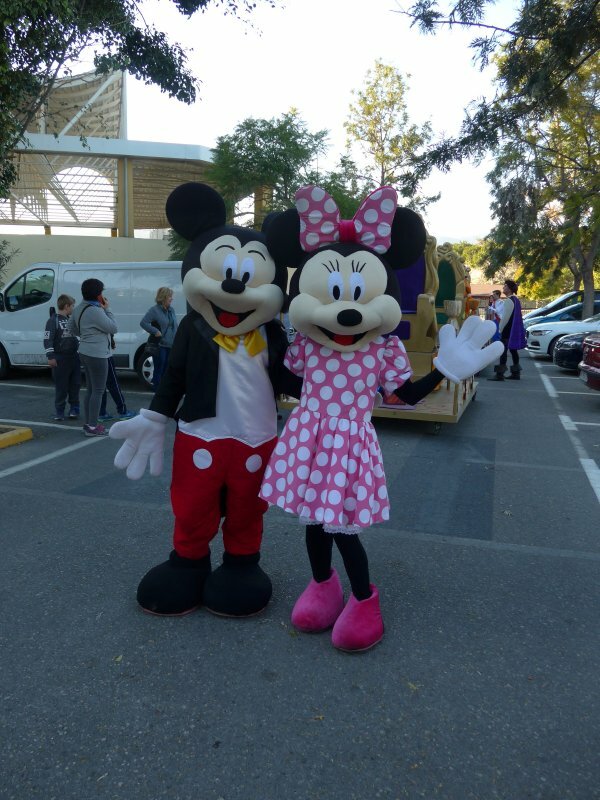 I positioned the caravan, got the legs down, water and electric connected……………… and that was it for the day …………………… Well – you can’t be too busy when there are so many friends and acquaintances to talk to! I made an early start on Friday morning by unpacking the awning and poles from the car. I’d barely got started when Martin and Joanne returned from walking their dogs. Martin said he would come and give me a hand. Within minutes he was back again – so we got stuck in. Then minutes later, Paul arrived. Soon Jim (Wigandiver on CT) also arrived. So with all the help, the job was done in record time. What a great bunch of guys they are. This year I decided to bring some 180mm coach screws to peg down instead of the spikes and club hammer. With two electric drills going they were screwed in in double quick time. I did have doubts as to whether they would hold in the loose gritty sand, but they screwed in with a good hold. Later in the day I got my carpets down and set up my kitchen range with small electric oven, two ring hob, and micro-wave oven. The journey from Bilbao to Torrox could have been as little as 600 miles and could have been done in two days. The crazy route I mapped out for this year has been 860 miles and has taken two weeks. But what a wealth of interesting places I’ve seen. 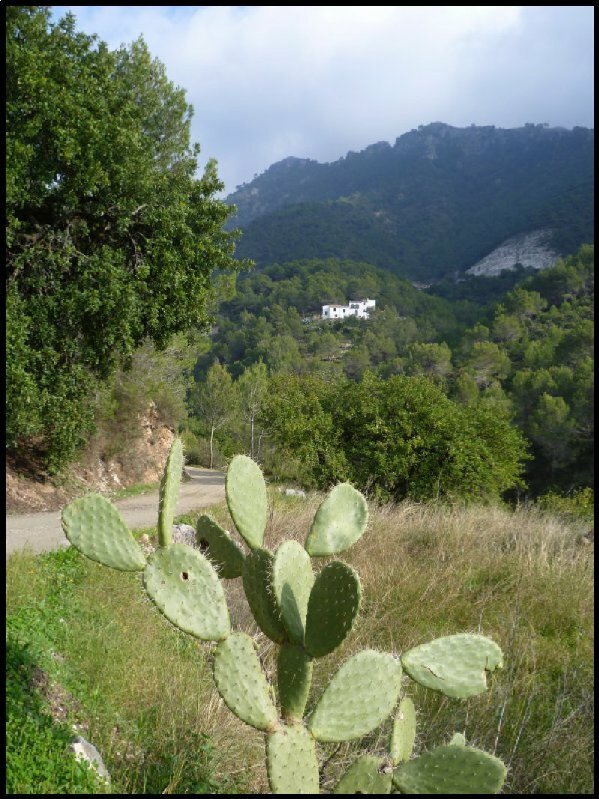 It’s two weeks since I arrived at El Pino and most of that time has been a period of glorious wall to wall sunshine. But that’s only glorious for us winter sun-seekers. For the market gardeners, nurserymen and orchard owners it’s a time of anxiety. They are desperate for rainfall. 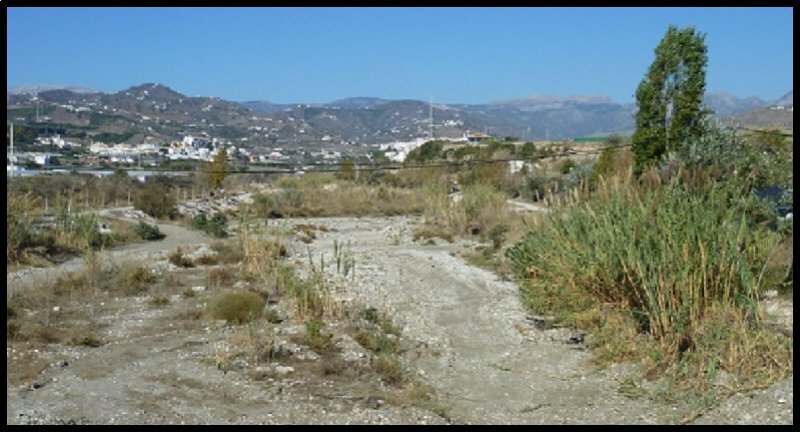 The authorities are threatening to reduce their water supply by 60% and the wide river bed wending its way through Torrox is completely dry. Since arriving here I’ve lived a life of idleness. After the Aquaroll is filled and the grey tank emptied and the plastic pavement which I’ve laid around the awning is swept free of leaves, the rest of the morning is spent at the computer or sitting out watching the world go by and occasionally chatting to passers-by. It always amazes me how whether they be German, Dutch, Norwegian or Swedish who stop to chat, they are all able to speak some English. On my third day here I drove over to the Eroski hypermarket at Velez Malaga to fill my almost empty diesel tank on the car. Their price was 12 cents per litre less than the local filling stations and since I could take on 55ltrs or so, it was worth the drive. 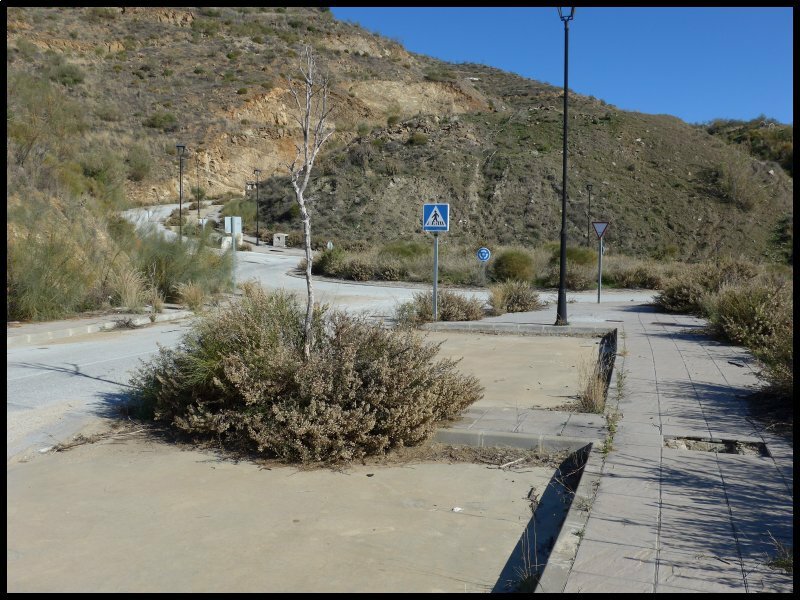 After filling, I took the road inland, along the valley bottom, then up the hill to Lake Viñuela which is a man-made reservoir. 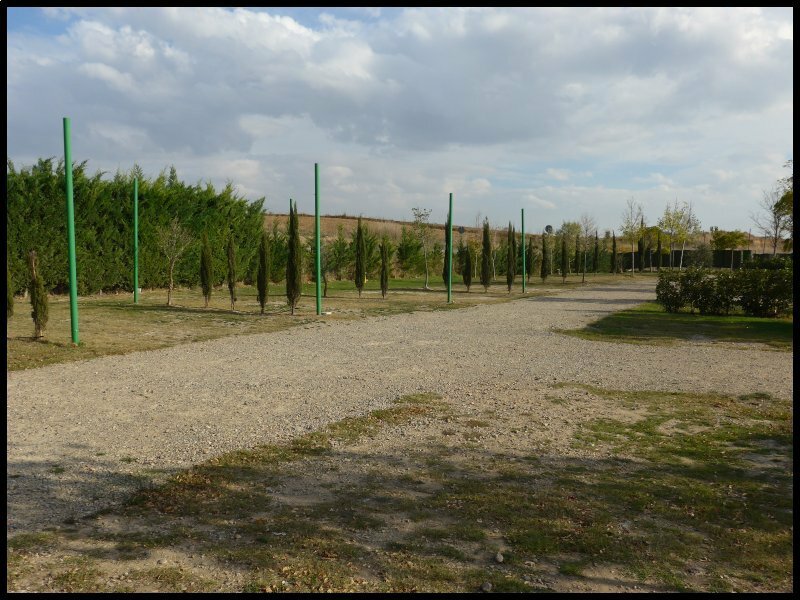 The surrounding area has been landscaped providing dirt roads with parking places. 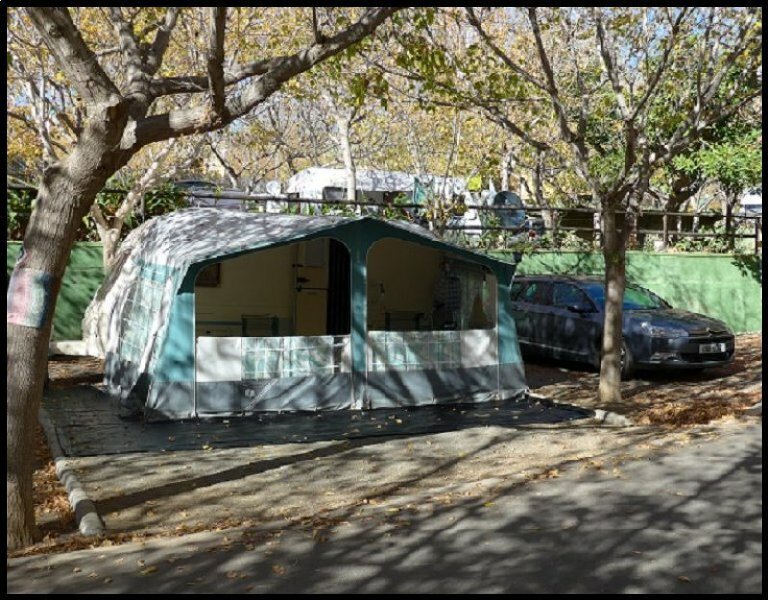 Several years ago the authorities would turn a blind eye to mobile home owners pitching their vans in the park, but that practice has now been stopped. This has been one of my favourite places for many years but I don’t think I have ever seen it with a water level so low. During the past few winters there may have been slightly less rainfall but what I have noticed is the proliferation of plastic greenhouses in places where previously none existed. Obviously they all create a demand for water. Most days after lunch I get on the bike, cycle down the hill, and along the coast road to the lighthouse. Erected between the prom and the lighthouse is a large viewing platform with a cantilevered glass floor reaching out across the cliff and rocks. Under the glass floor are the remains of Roman occupation. 2000 years ago the Romans produced and exported Garum from here. Garum was a sauce used in cooking. It was made by allowing fish innards to ferment in the sunshine . The remains of a pottery where storage jars for the sauce were produced was also discovered nearby. Within the grounds of the lighthouse are the excavated foundations of a Roman villa. After a ride along the prom, I sit for a while doing a bit of people watching. Before riding back to the site I pop into one of several supermarkets to pick up a few essentials. Then it’s a strenuous climb back up the hill to the site. In all, I will have done around three miles. 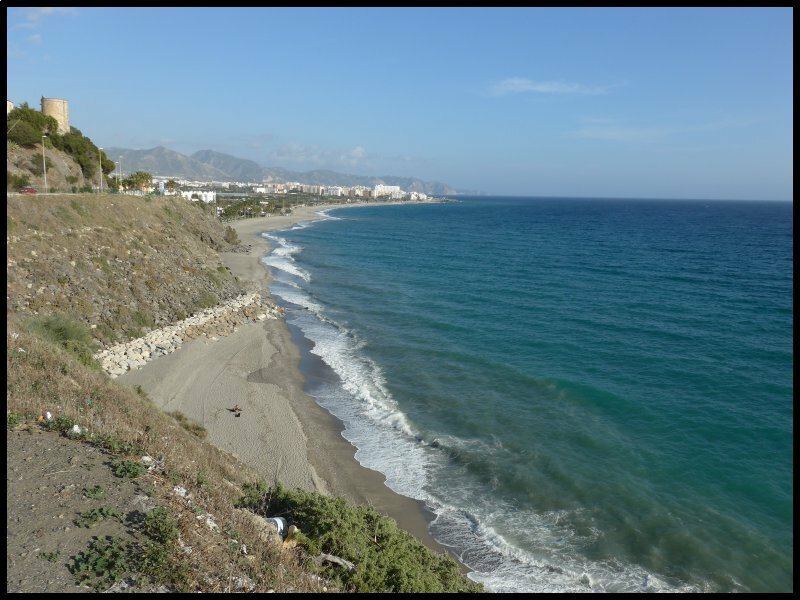 Last Sunday I cycled the other way along the coast road towards Nerja. This, I think is a beautiful stretch of coastline with some tiny beaches dotted between the outcrops of rock.. In many places where the original road has been widened or realigned, it leaves a useful stopping place. One of my stops was at the point which overlooks Playazo Beach. In front of me was the long expanse of almost deserted beach, whilst behind me, standing high on the cliff top was one of dozens of ancient watch-towers. These were built on headlands during the 16th Century to give warning of marauding pirate vessels crossing the sea from North Africa. 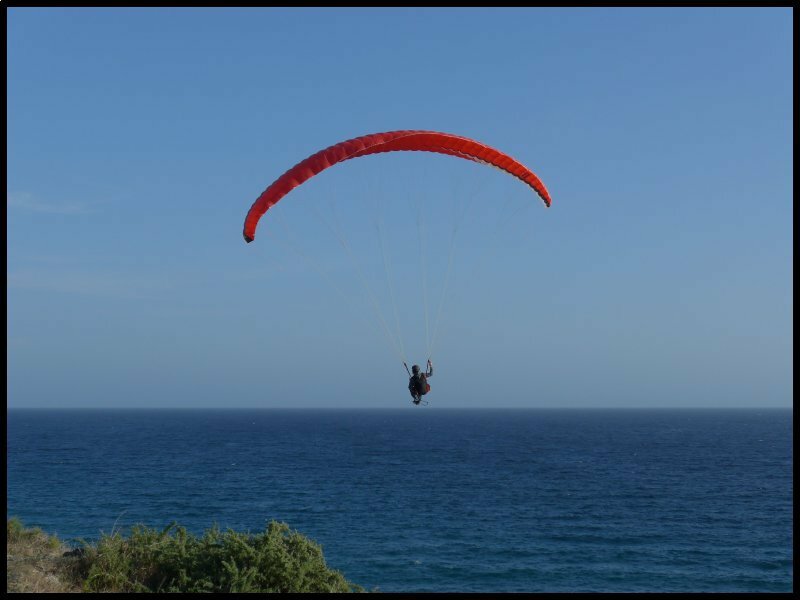 At another stop, a young guy was climbing into and adjusting his harness to do some paragliding. After laying out the cords behind him on the ground, he bravely ran towards the cliff edge and launched himself into the air. He soared upwards at first, turned, then swooped down out of sight. Curiosity getting the better, I strolled across to the cliff edge only to see the guy wallowing in two feet of water whilst he gathered together his kite. But he’d had enough for one day. Five minutes later he returned to his van, packed everything away and departed. And I did the same. Back along the road and up the hill to the caravan. Altogether I’d cycled seven miles. The forecasters mentioned rain! And they were right! It started in the early hours of Wednesday morning and it’s continued almost without a break. This is the first rain I’ve experienced since the morning when I left Villafranca nearly four weeks ago. A change in the weather is expected on Friday. Let’s hope so! 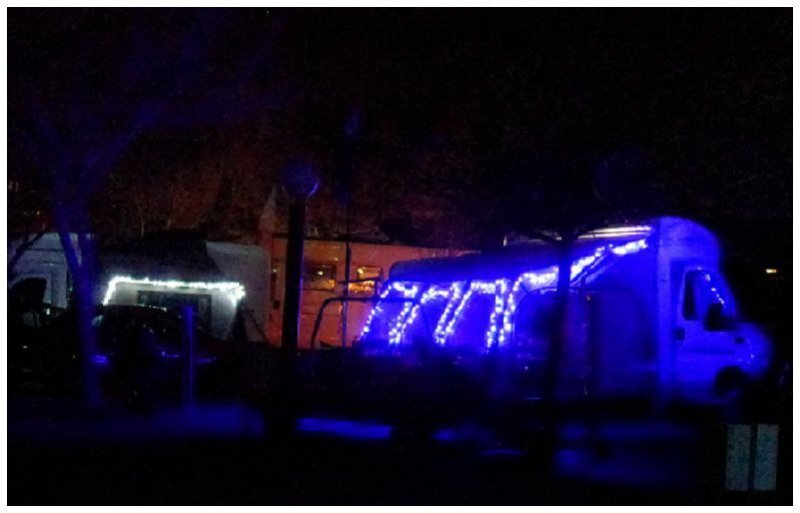 Many caravanners here who will be staying till after Christmas and the New Year have already put up their Christmas lights. After it was dark I took a walk around the site. Here are some of them. there’s street lighting, roundabouts, car parking spaces, pedestrian crossings and street furniture. But all for no purpose! Because in 2008 the financial crisis hit bringing to an end all the house building plans in the area. 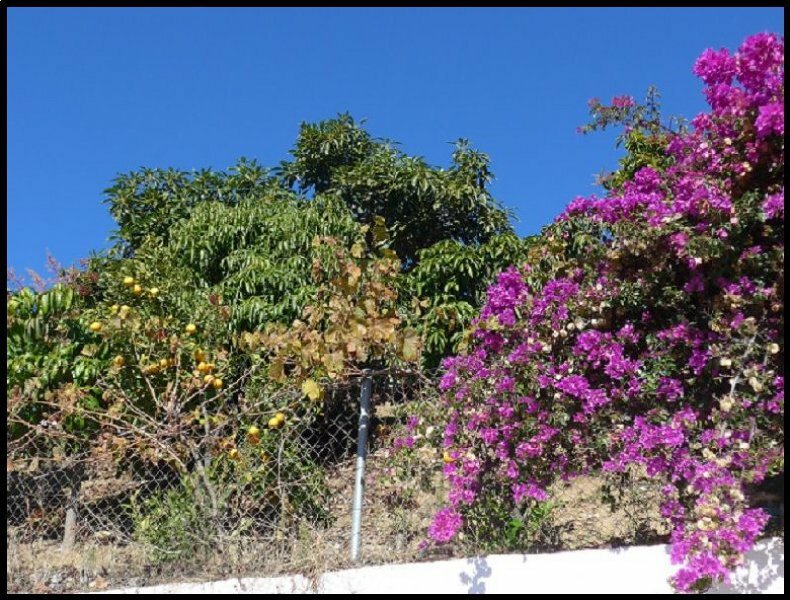 Today, the orange trees have long since died, the electric substations have been vandalized for their cable and equipment, the verges are a riot of gorse and other wild shrubs and in places, even the manhole covers have been stolen for scrap. 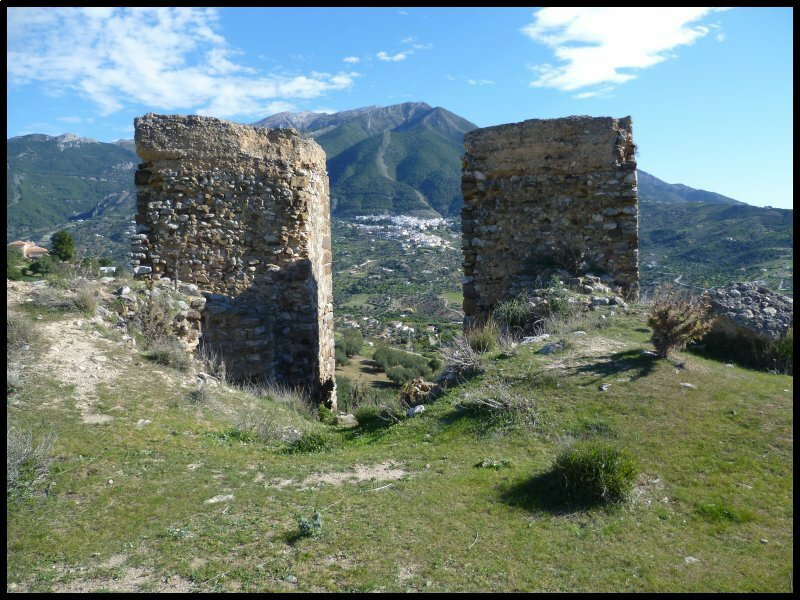 At first the road runs down the side of the ravine and looking across the valley, there, on the far side are the remains of the Sugar Factory. 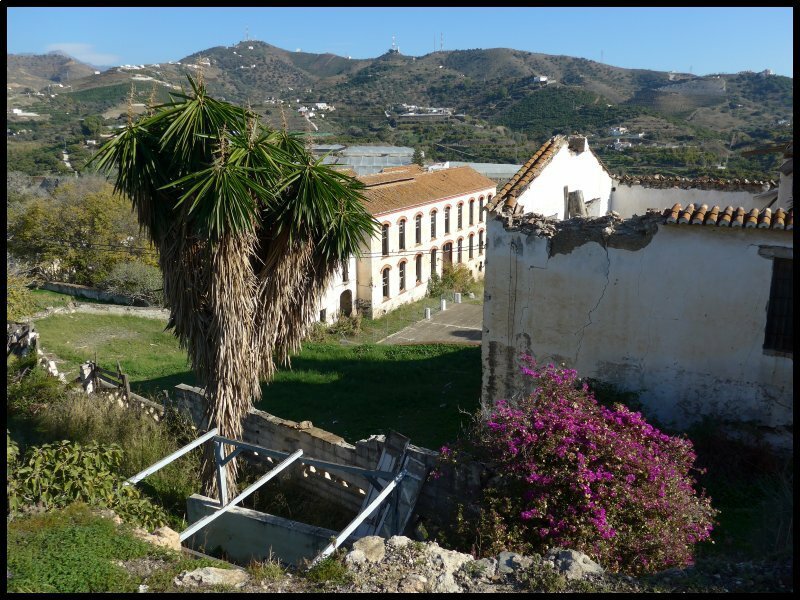 Sugar cane was introduced into this part of Andalucia during the Arab occupation, however this factory together with others at Nerja were built in the 17th Century, and it functioned right up to the end of the 19th Century. Down in the valley bottom the ground is used for vegetable growing – very often potatoes – but always under plastic. During the past three or four years there’s been a big increase in the amount of plastic fields and plastic greenhouses all of which cause the water shortage to get even worse. The road climbs steeply again to pass under the A7 motorway. 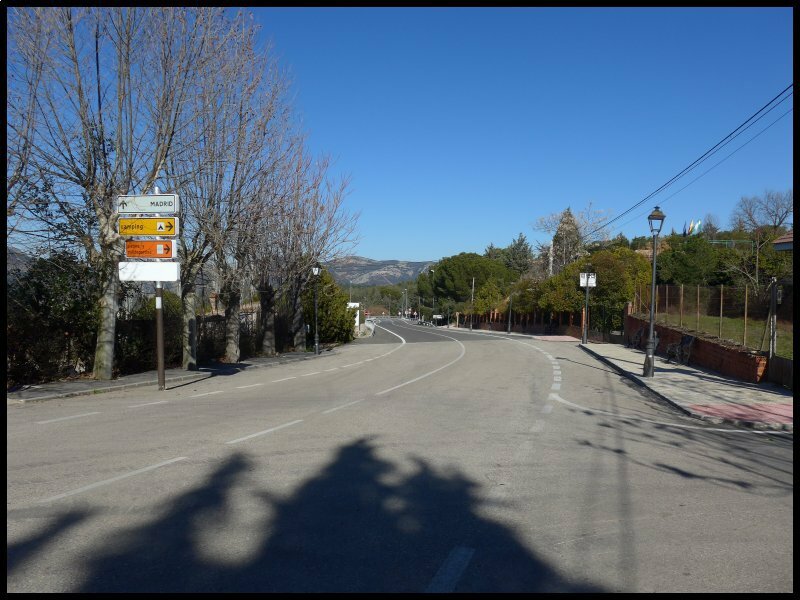 This is the road which starts at Le Perthus on the French border and ends 800 miles later at Algeciras – much of it toll-free but a lot of it peage. 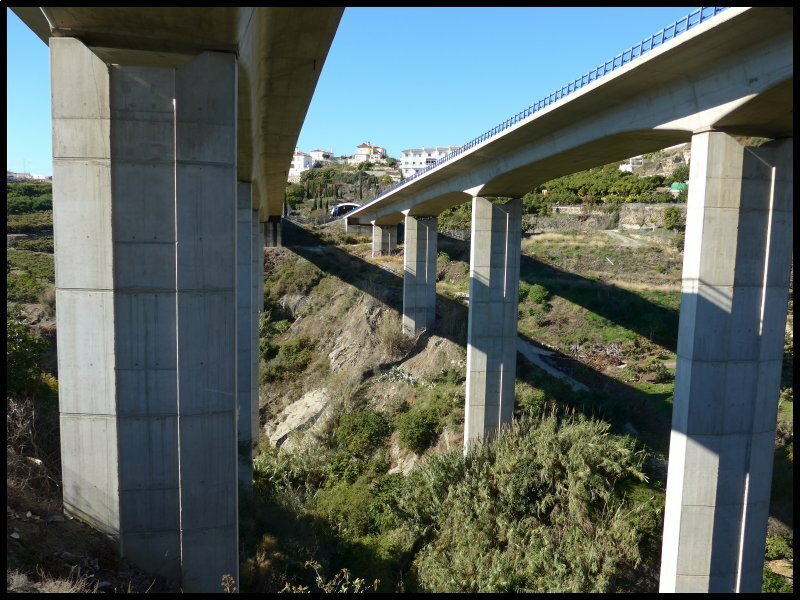 The entire road which I’m told was paid for with EU money must have cost an astronomical amount of Euros because all of it is either built on viaducts, through tunnels or through deep cuttings. 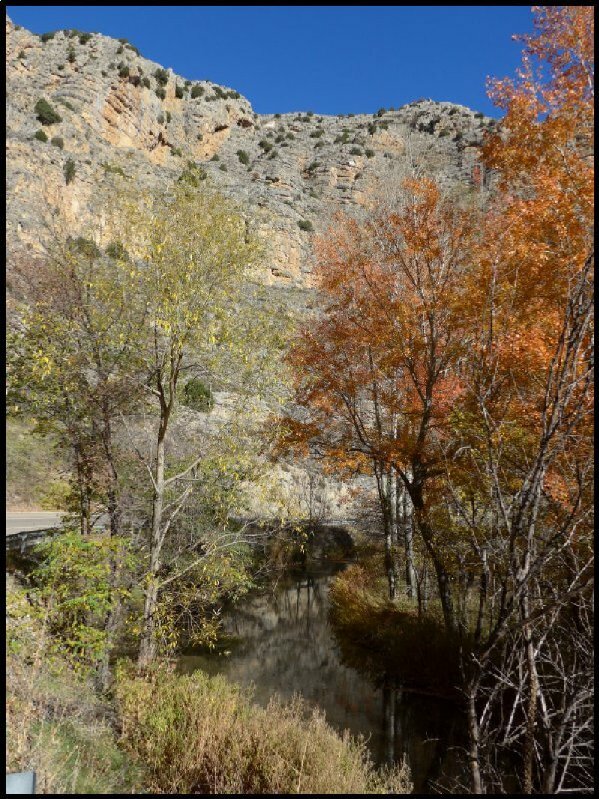 My picture shows the road leaving the Torrox tunnel, being carried across the ravine, through a cutting, then through a further tunnel. Because of the length of the viaduct, the roadbed has to be free to move to allow for expansion and contraction, so standing under the viaduct, the noise is frightening as HGVs hit the spring system. Sadly the geraniums were well past their best. 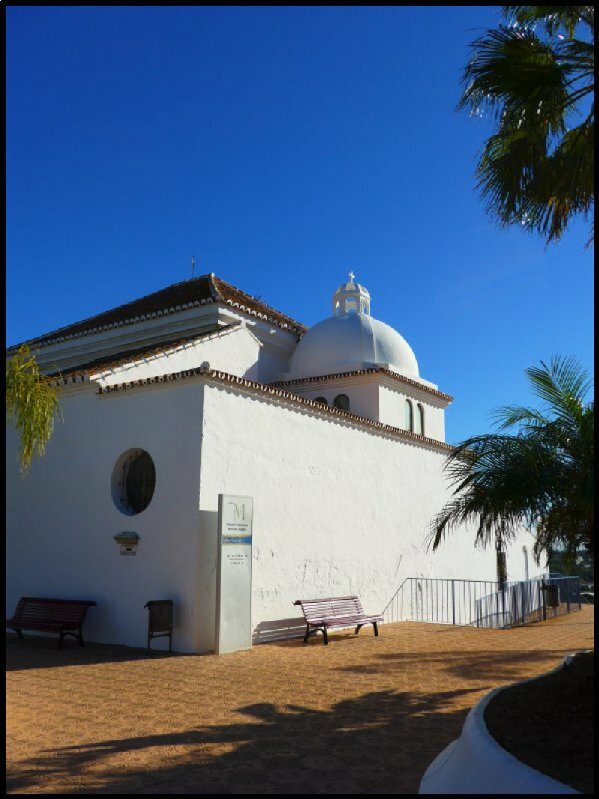 Suddenly the road opened out into a small plaza where at one end is the Ermita de San Roque – a chapel built in the 16th Century on the site of a previous mosque. I sat for a while in the square pondering why there were so many properties with “For Sale” boards attached to them. 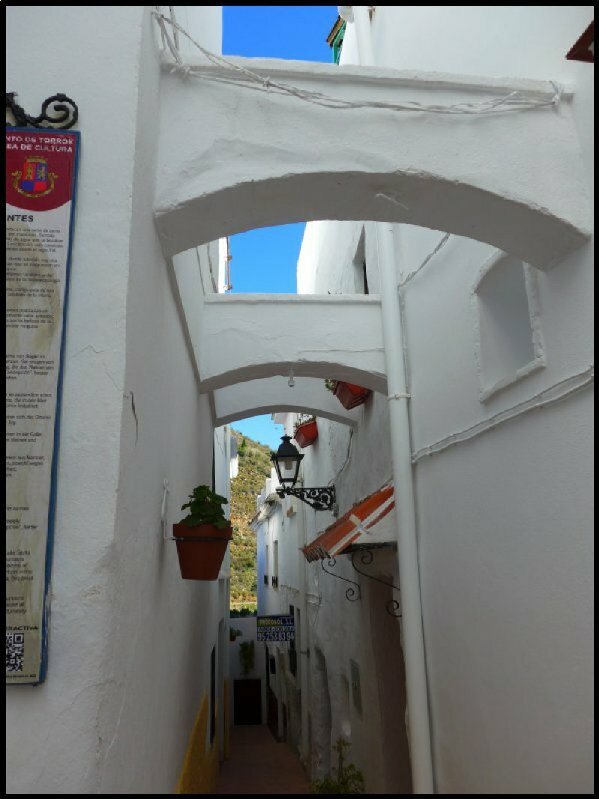 In some of the narrower streets, arches have been built between houses. 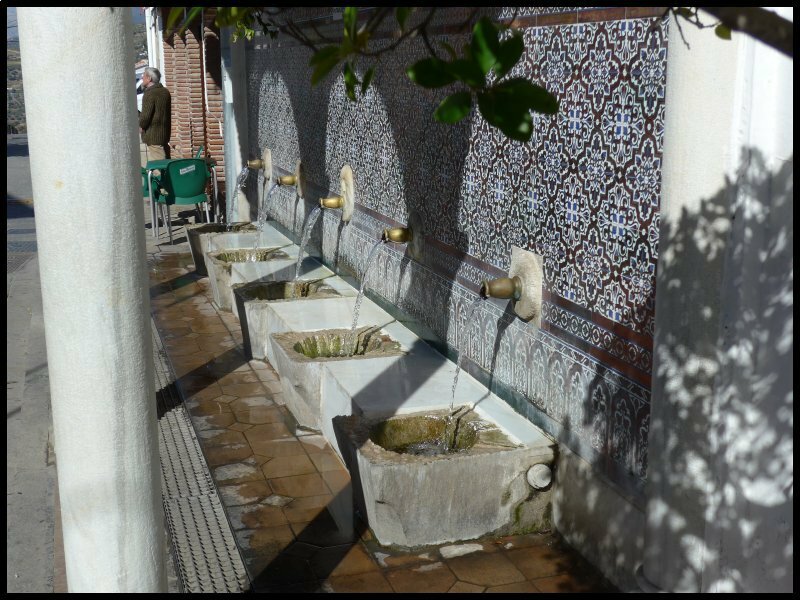 These were installed during the 16th Century as a means of carrying spring water from a source close to the sugar factory. 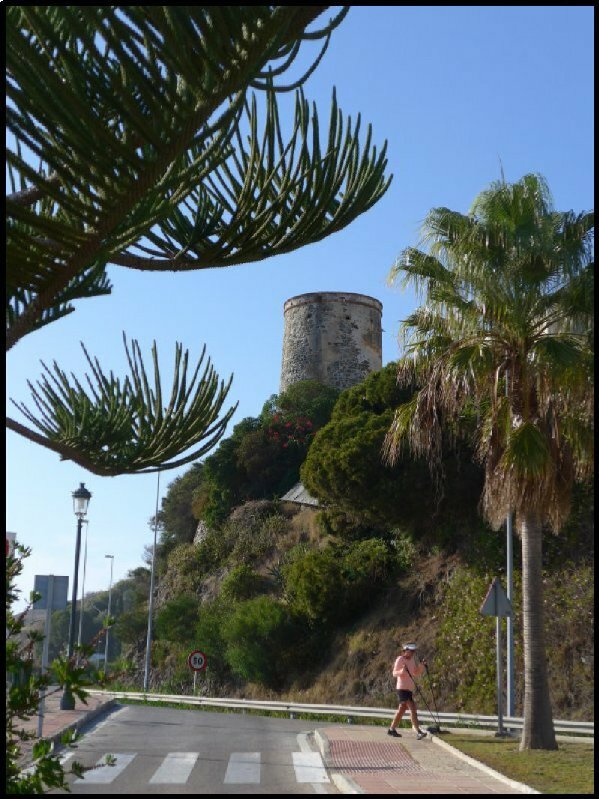 During the Arab occupation the village was protected by a surrounding wall with eight observation towers built into it. Now only one recently renovated tower remains. 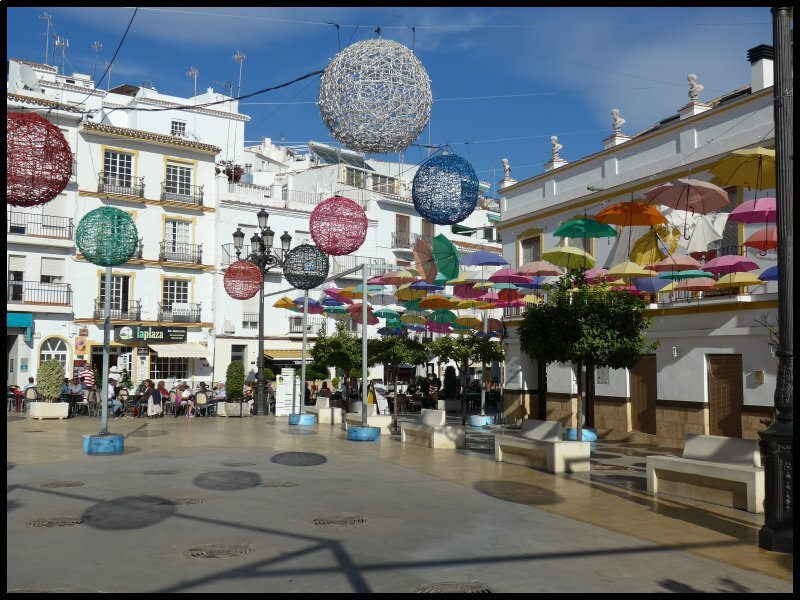 Around the next corner and I’d arrived at the Plaza de la Constitución – the main square of the town. 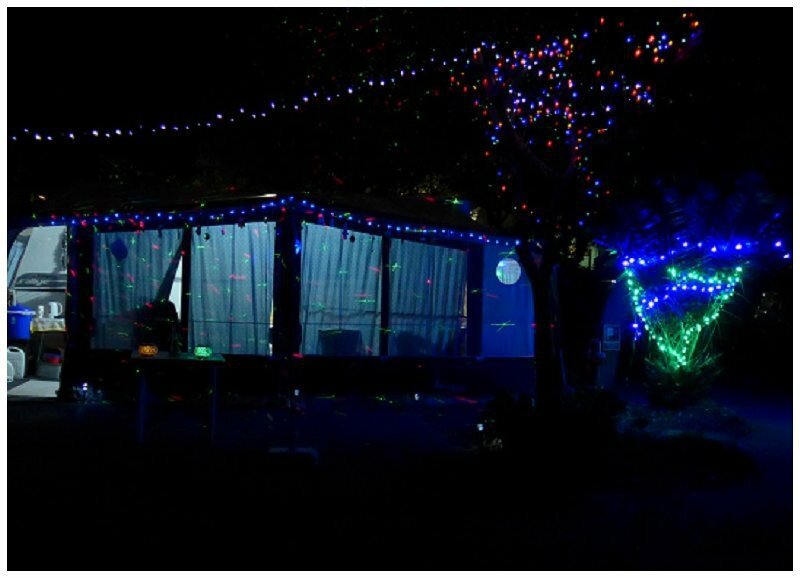 The space where all the outdoor functions take place. On two sides there are several bars and restaurants whose tables and seating spill over to fill some of the open space. Peeping over the roof tops is the tower of the Church of Nuestra Señora de la Encarnación which was built on the foundations of an earlier mosque in the 16th Century and restored and enlarged at the end of the 17th. 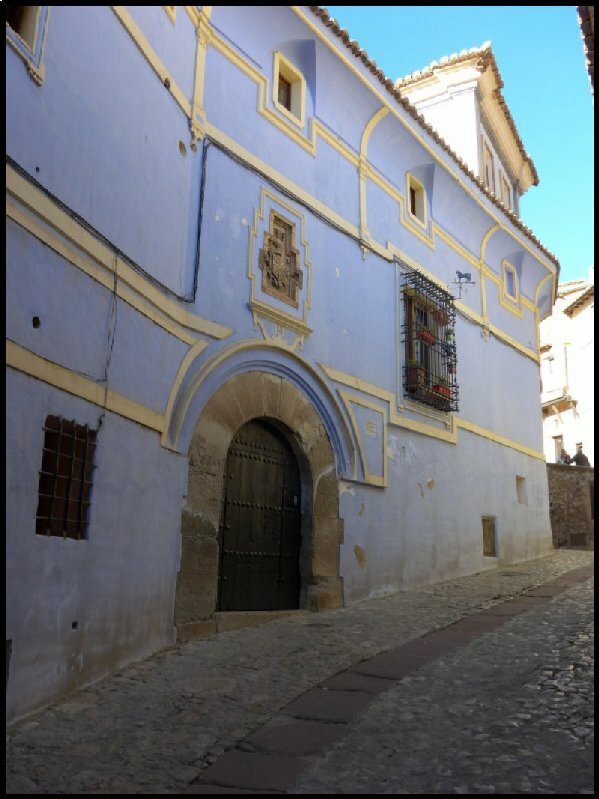 The last building of importance on the route is that of the Convent and hermitage of Nuestra Señora de las Nieves. The original building built on the foundations of a mosque in the 16th Century was used as a hospice and later as a monastery. Today, although part of the building remains as a church, the remainder is used by local government. Another view of the Sugar Factory. 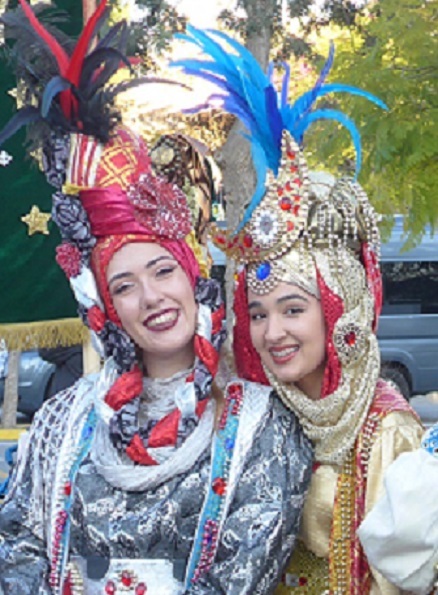 Being the last Sunday before Christmas, it was the weekend for the Migas Fiesta in Torrox Pueblo. 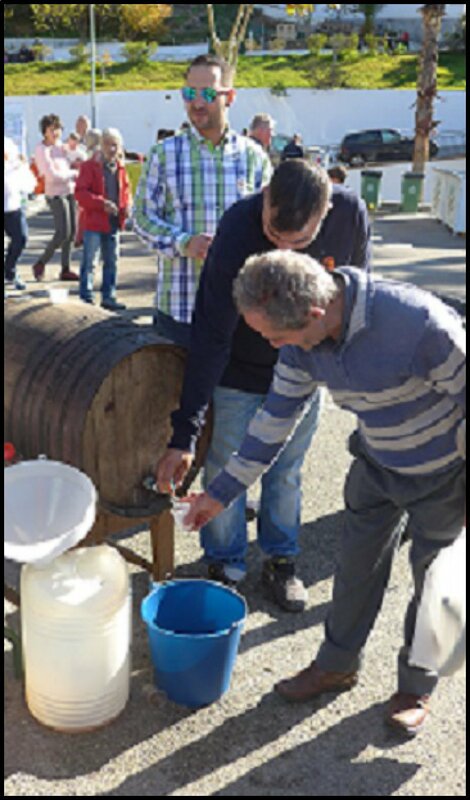 The Spanish, always on the lookout for an excuse to have a street party, revive a traditional method once used by land owners to feed their labourers at mid-day. Migas is a cheap, traditional Andalucian dish made from stale bread crumbs fried in olive oil, to which is added garlic, olives, pieces of chorizo sausage, cubes of ham and peppers – all locally produced. 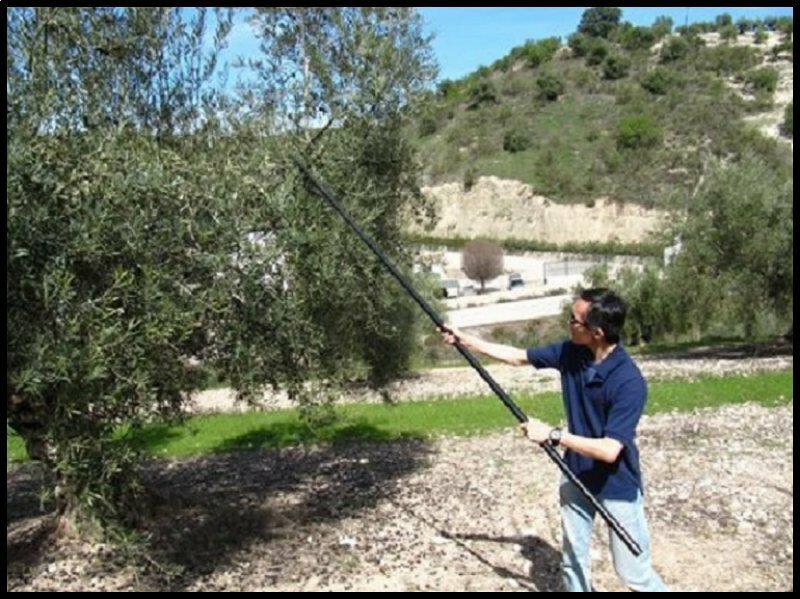 Some people say that the signal for the labourers to down tools and come in from the olive groves and vineyards for dinner, was the ringing of a bell. Others say that dinner time was announced by a conch shell being blown. Certainly the local council seem to favour the latter since they have gone to the trouble of erecting in the Plaza a statue of a youth blowing into his shell. Early on the Sunday morning volunteer teams of cooks began by setting up their fires around the edges of the main car park in the town. 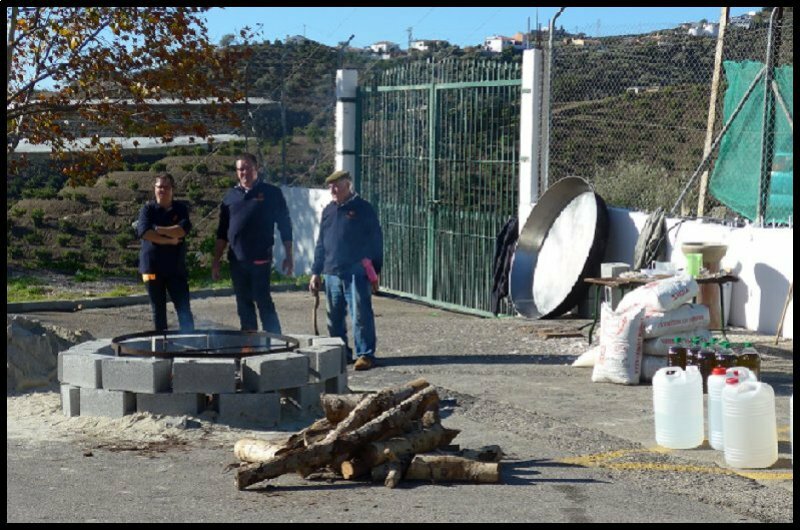 The fires are contained within rings of concrete building blocks on which is mounted huge four feet diameter paella pans. The once used breadcrumbs is now replaced by flour. 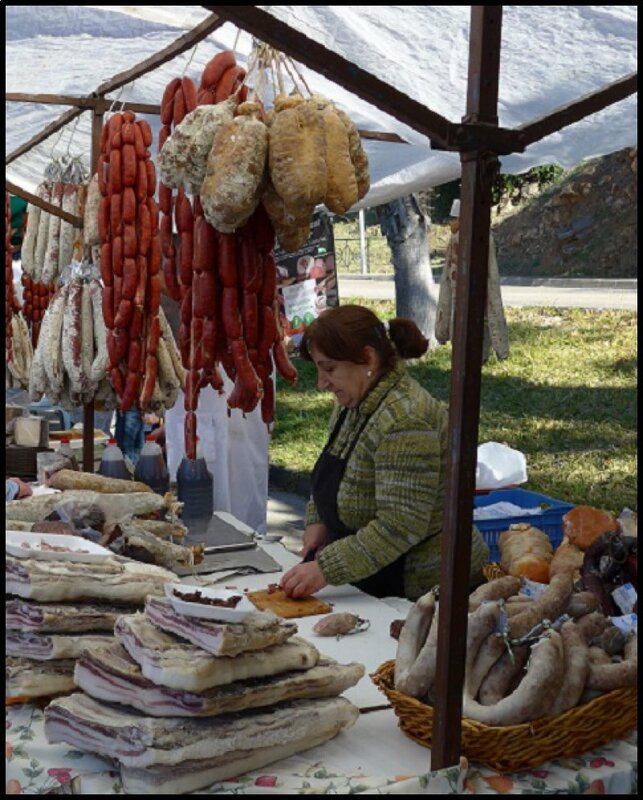 In the centre of the car park, stalls were set up where traders sell their wares, where craftsmen sell their work, and the cheese makers and the sausage producers sell their products. Placed around the park were several barrels of wine so that visitors were free to take a plastic cup and sample the various types of wine. 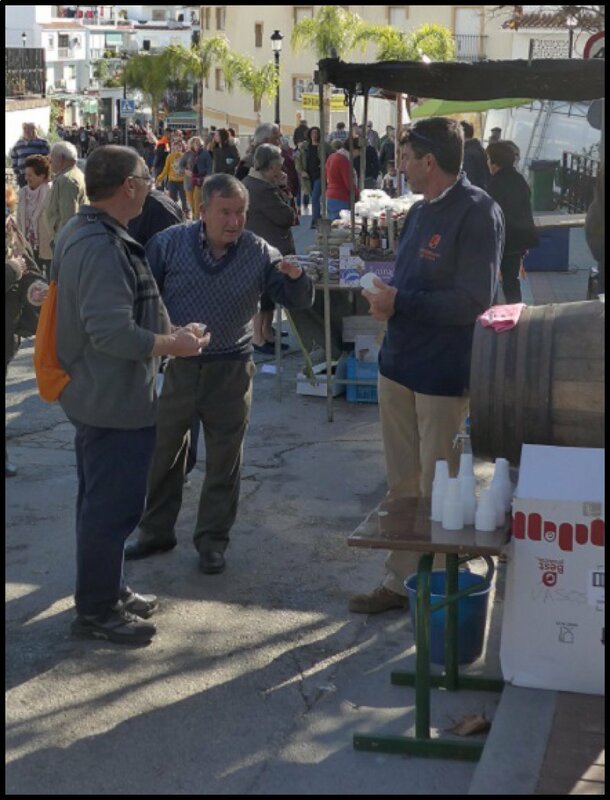 During the previous week a competition was held among the local wine producers where the wines were graded for quality and flavour. The winners got the dubious honour of providing the wine. 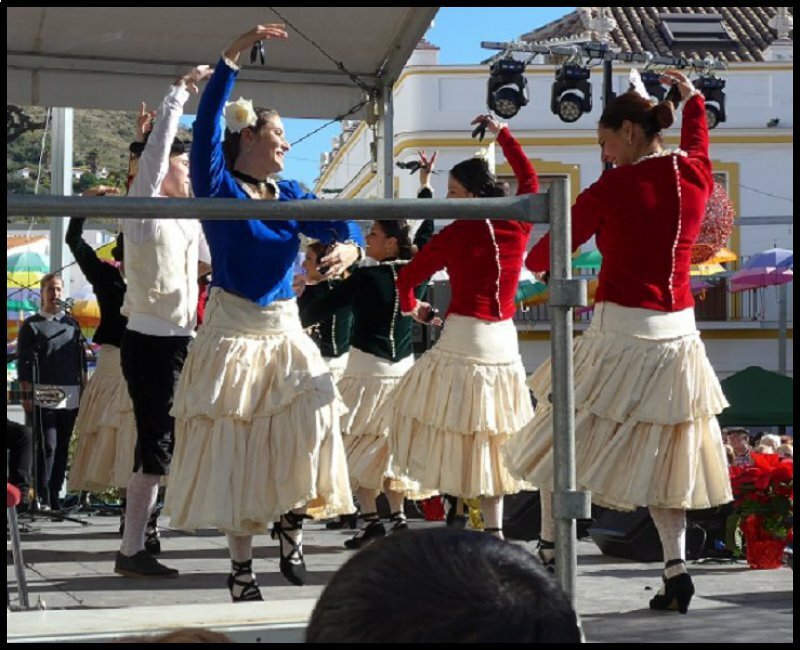 Meanwhile down the road in the Plaza de la Constitución a stage was set up where local flamenco groups, singers and players put on an almost continuous performance. 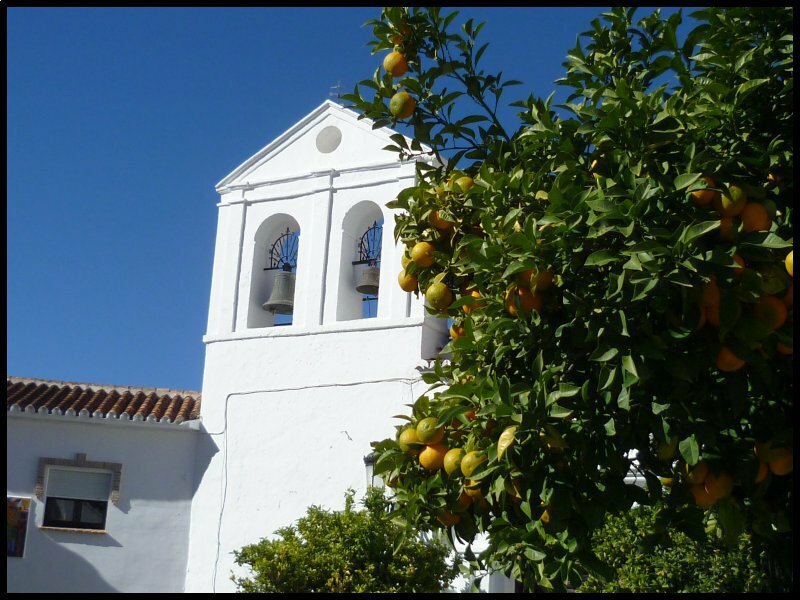 But at 1.30 the ringing of a bell was the signal for all who want to partake, to join one of the long queues to collect a plate of Migas together with a salad consisting of oranges, tomatoes, fried potatoes, onions and olives. Wine was on hand nearby. Walking around in the sunshine, it’s easy to forget that it’s December. On the 19th December my two daughters and grandson came to stay. Not with me in the caravan but close by in an apartment on the Costa.. In fact, from their balcony they had a grand view along the sea front. On our first day out we did a short drive eastwards along the old coast road. 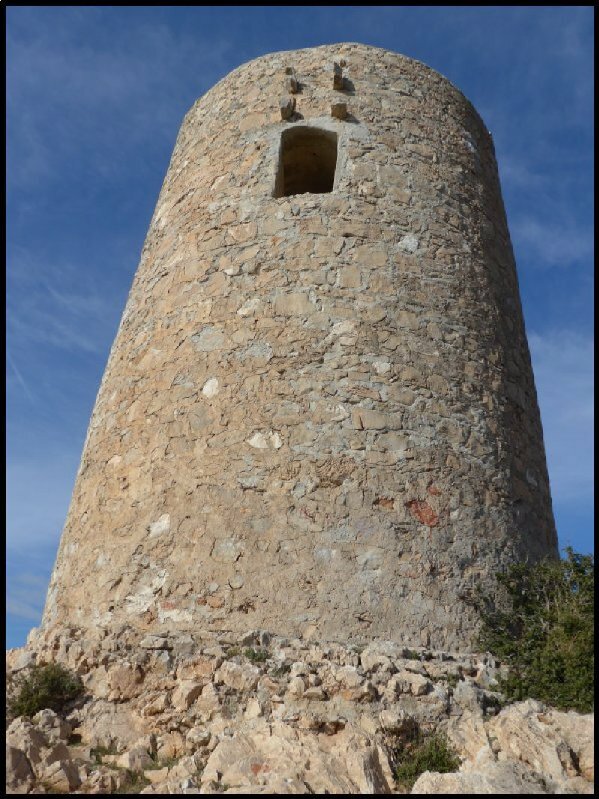 I parked the car on the Cerro Gordo and we all climbed to the top of the promontory where one of the ancient watch towers is situated. In the 16th Century similar towers were built all along this coastline to keep a lookout for marauding pirate vessels crossing over from north Africa. 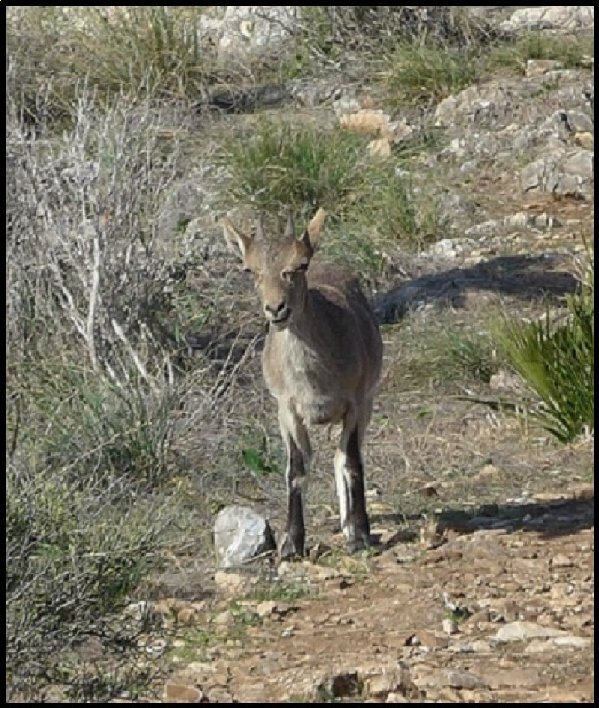 As we tramped across the rocky peak, I don’t know who was more surprised – the ibex blocking our path, or us. But no worries. It quickly turned and bounded after the rest of the flock. In both directions there are beautiful views along the coast. Later we drove down the hill into the bay where we enjoyed a packed lunch on Herradura beach. 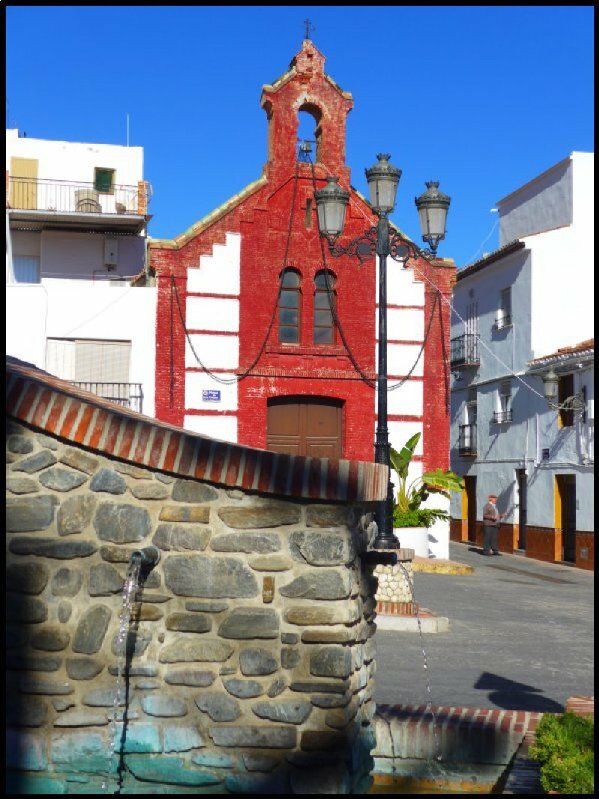 On the next day we drove inland – first stopping at Viñuela. My visitors were shocked to see the water level, as they remember the reservoir being full in earlier years. This picture was taken in 2012. – and this one only recently. After a short stop we drove on and took the mountain road to Comares. 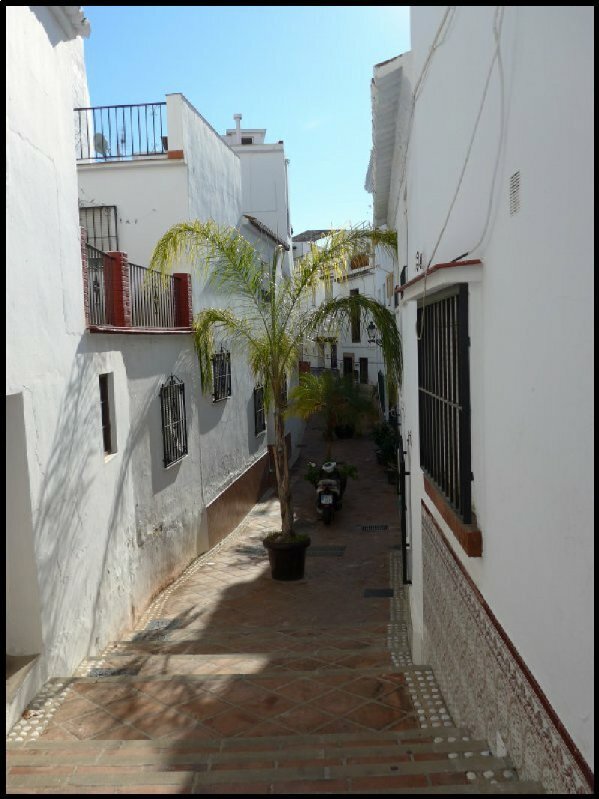 Many claim that Comares is the most beautiful of all the Andalusian Arab-built villages. Standing at 4000 feet, it’s access is sufficiently off-putting to deter the tour operators, so winter visitors are few in numbers. 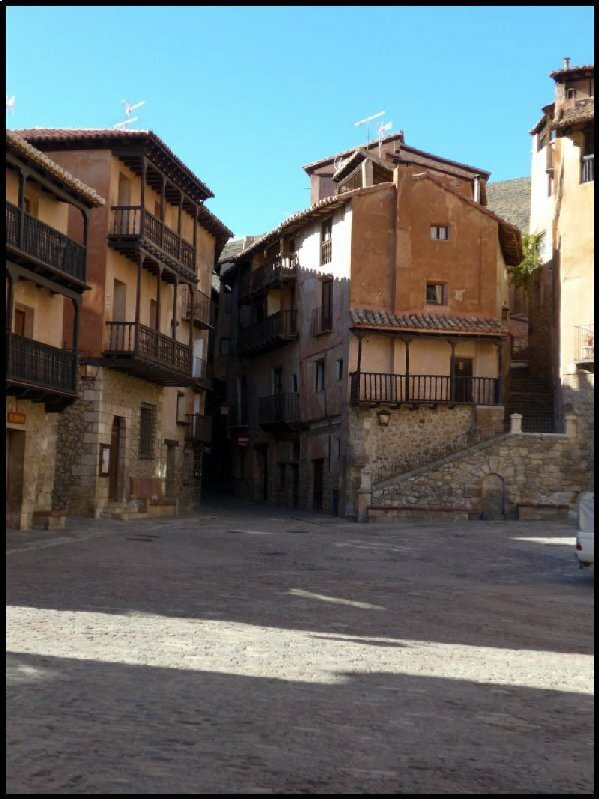 A tiny Plaza stands at its lowest point with very steep streets going upwards in three different directions. Walking in any direction requires a great amount of effort. But it seems not to harm the locals for many of the tombs in the cemetery indicate that the occupant was in their 80’s and very often in their 90’s. 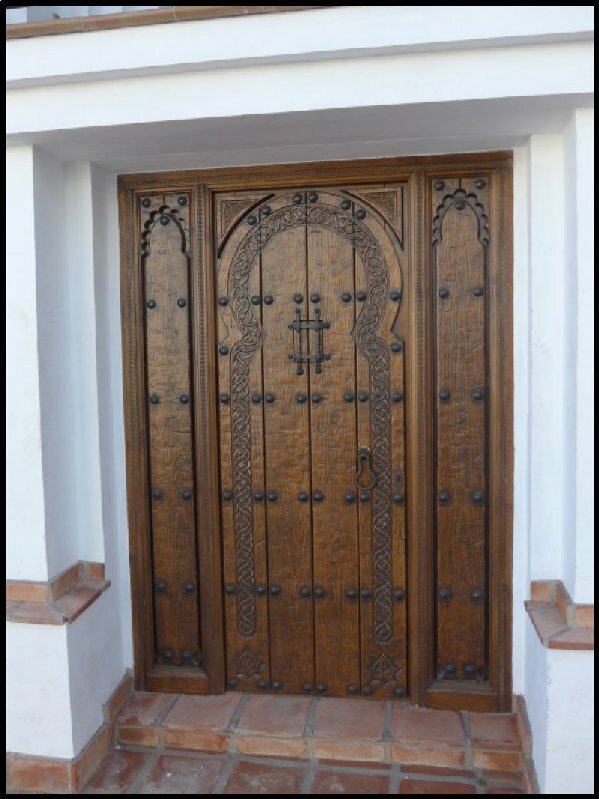 As I strolled around the village I couldn’t help but stop and admire a bit of modern craftsmanship in the form of a new front door on one of the houses. 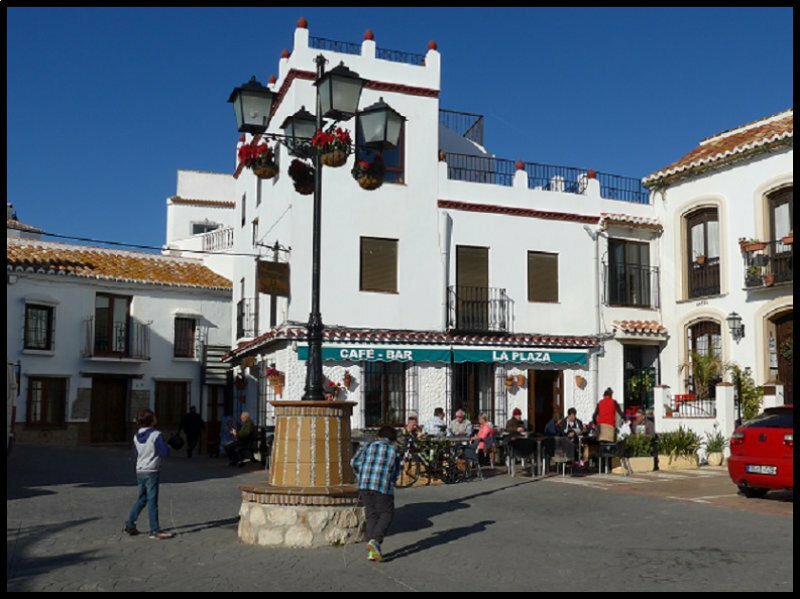 On our return to Torrox, in the evening we walked along the prom for dinner at La Blanca Paloma. We set out on a circular drive today. 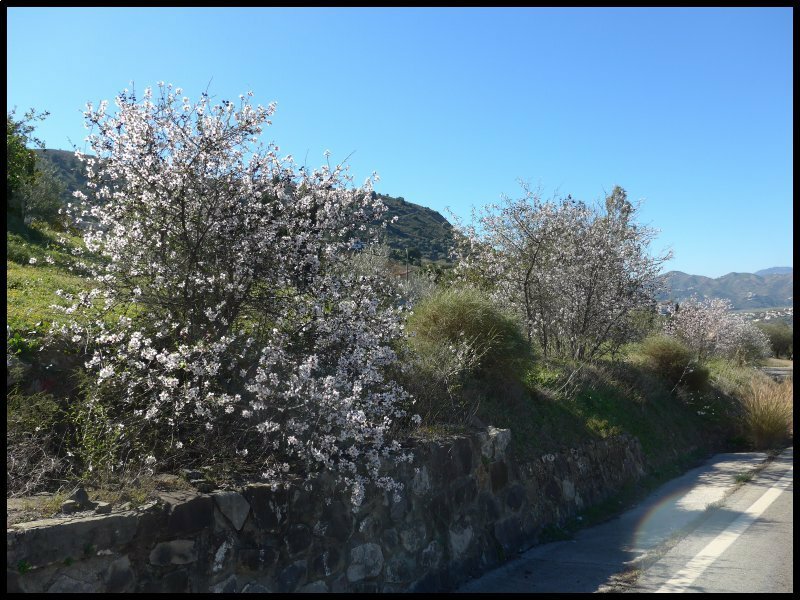 First along the familiar route to Velez then up to Viñuela. 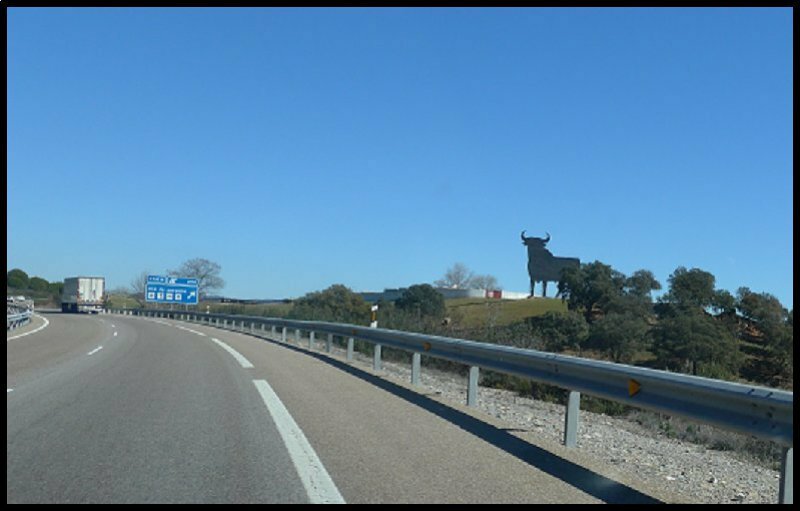 Without stopping there, we continued on through miles of olive groves until finally joining the A45 Autovia and staying on it until Antequera. 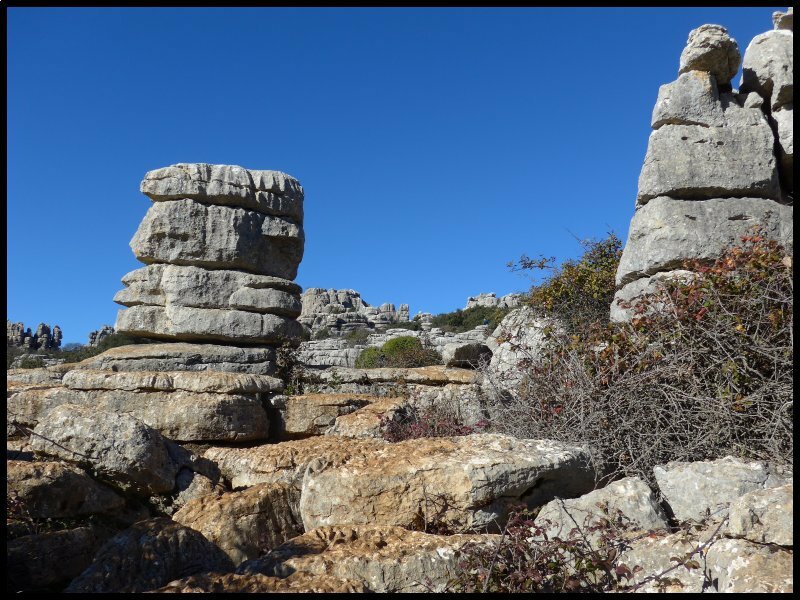 I’d entered into my Tomtom the coordinates for the Dolmens on the outskirts of the town. We went to see the Menga Dolmen – , a burial chamber built around 5000 years ago. 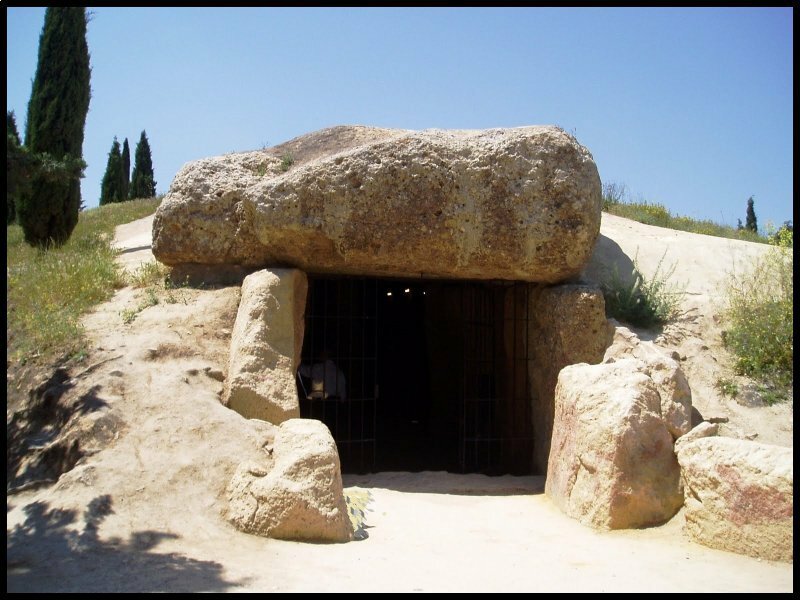 At 30 meters long, it’s the biggest dolmen in Europe. 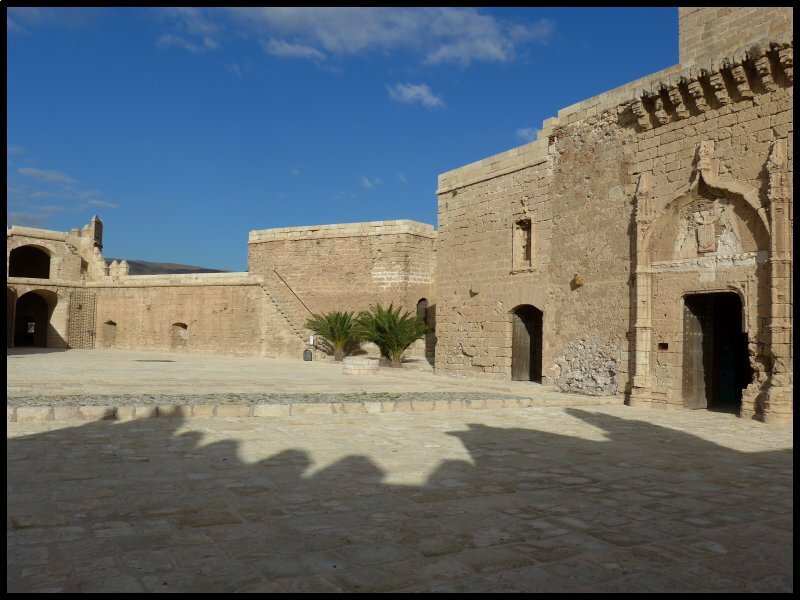 It’s built with two stone walls and a stone slab roof supported in places with columns. 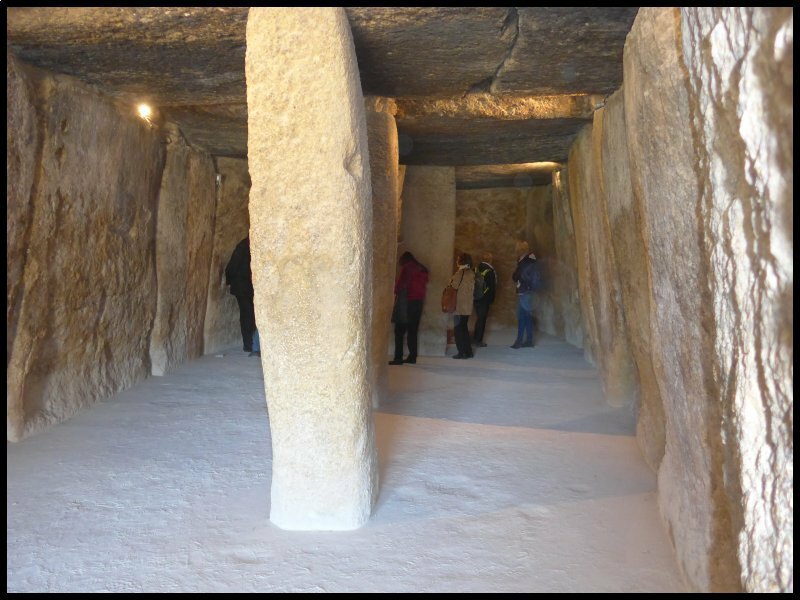 Engineers have calculated that the upright stones weigh around 180 tonnes each and since they were quarried and transported several miles from their source, the builders set themselves a mammoth task. 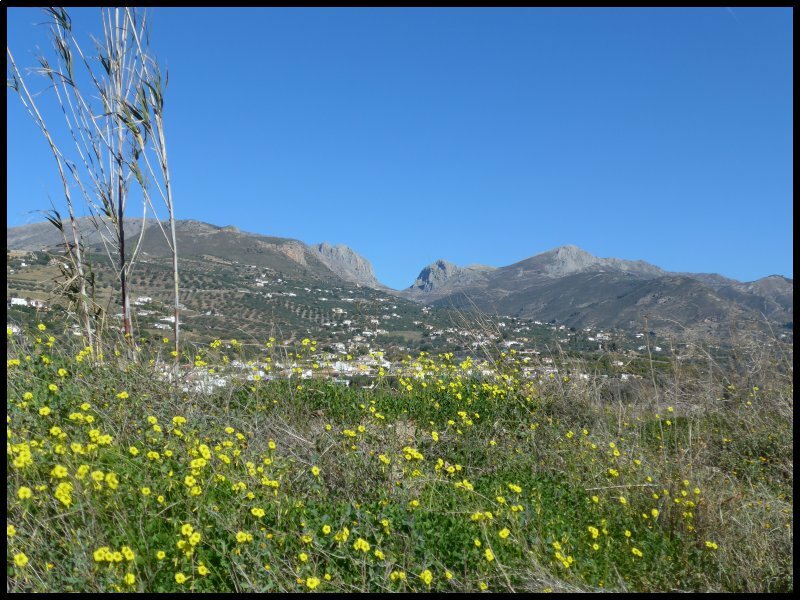 Situated in the centre of the plain is a huge craggy outcrop of limestone. The Dolmen is aligned so on the summer solstice, as the sun rises over the peak, the first rays shine directly into the mouth of the chamber. 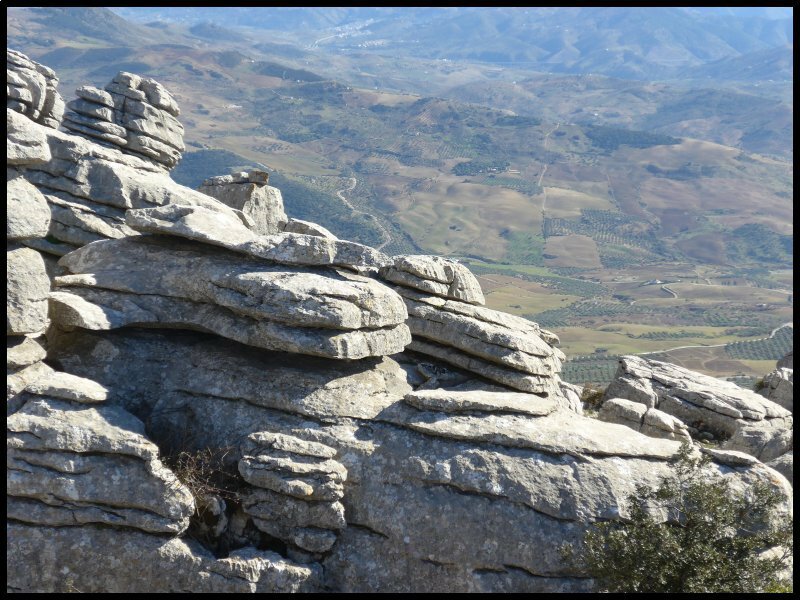 From Antequera we drove up to El Torcal which is a national park full of weird limestone rock formations. Millions of years ago the rocks were laid down whilst they were under the sea. Later eruptions forced them upwards to where they stand now at 4000 feet above sea level. The wind and rain has worn away some of the softer layers leaving the shapes we see today. 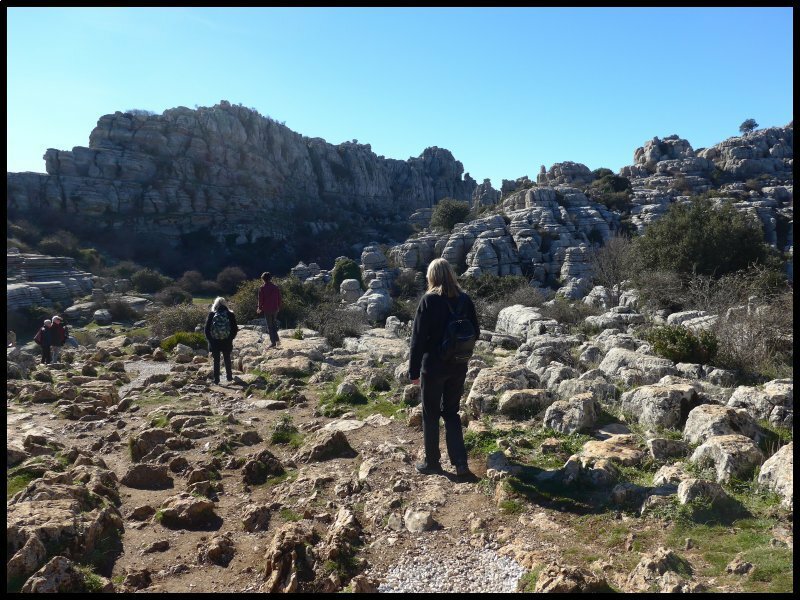 Although all of them require some climbing and scrambling, there are three different signposted circular routes. 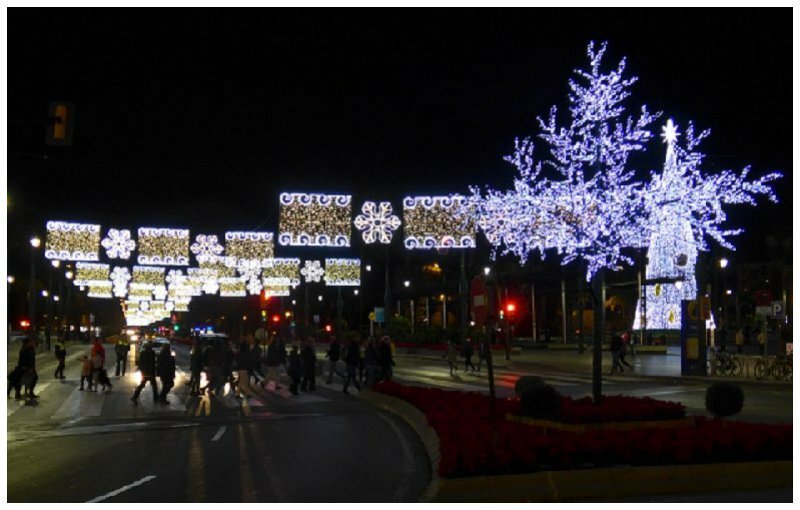 Christmas Eve and we planned to drive to Malaga so that we could visit the Cathedral and the Castle and also see the Christmas lights. As the lights didn’t switch on until 6.30, my visitors walked along the river bed and up to the site where we had lunch. 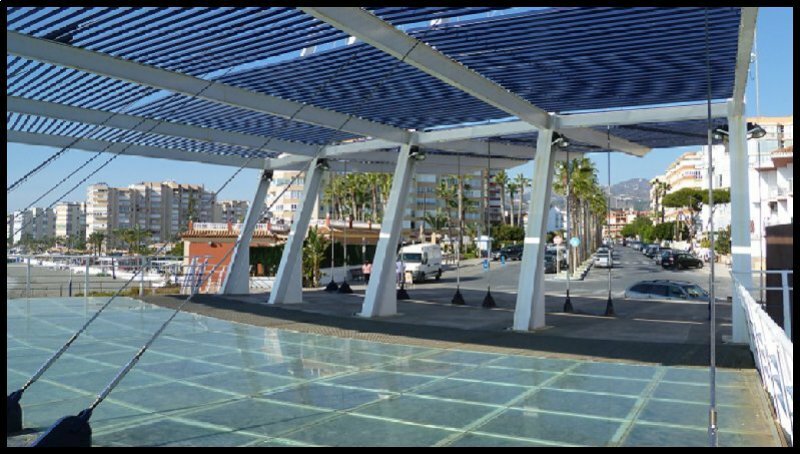 Car parking in Malaga City is a nightmare so I dropped the family at the Port then drove a few miles along the promenade until I found a space, then unloaded the bike. Malaga is a very bike-friendly city. It has numerous bike lanes with their own traffic lights. I met up with the family outside the Cathedral but we were in for a disappointment. We joined other visitors reading the “2pm to 6pm on Sundays” opening times, then we walked around the Cathedral looking for the entrance, but No – It was closed. 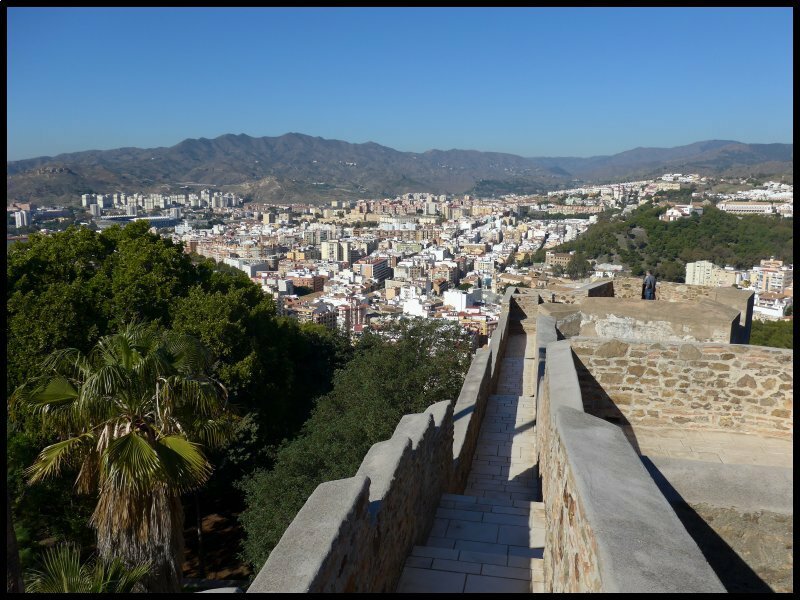 So we went on to the Alcazaba, a fortress which was built in the 11th Century by Malaga’s Arab rulers. The building also served as a palace. 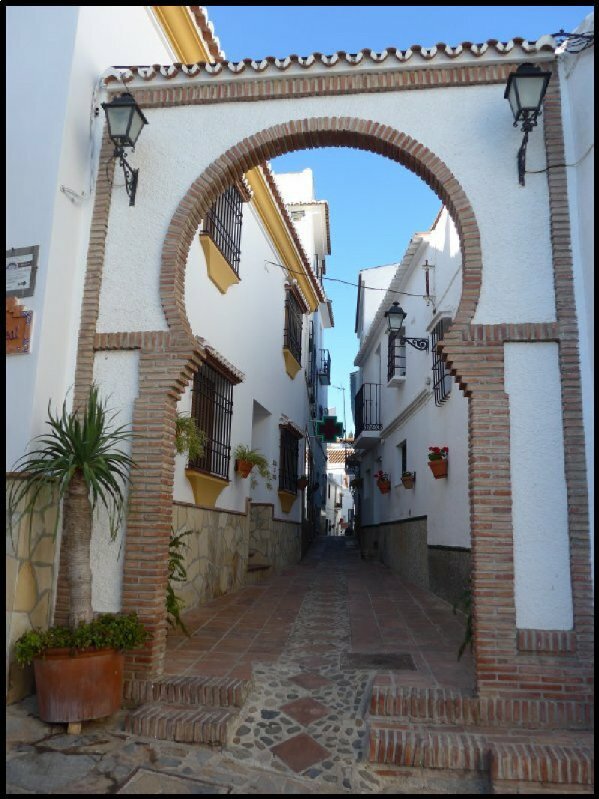 The entrance is at the foot of the Gibralfaro hill and stretches its way upwards. 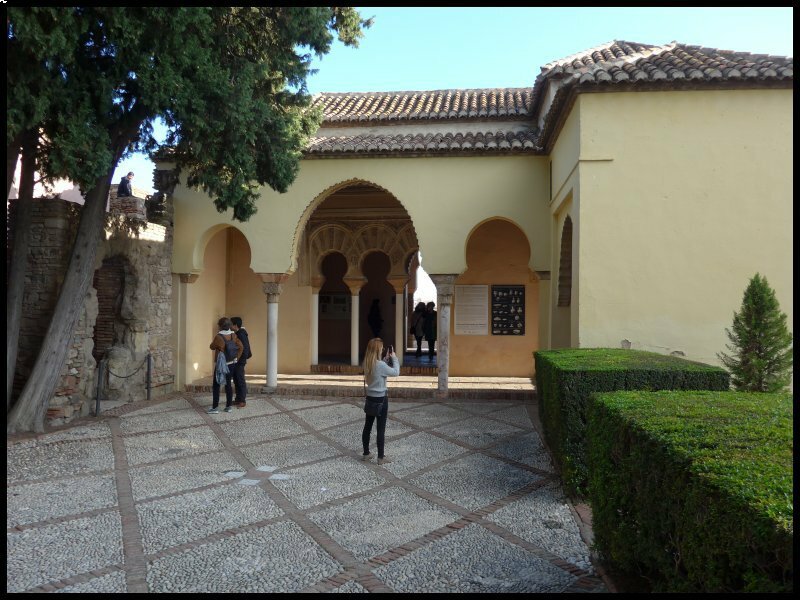 In 1279 the city became part of the Nasrid kingdom and the palace was redesigned so that with its rectangular patios and spaces around gardens and pools, it became very much like the Alhambra. 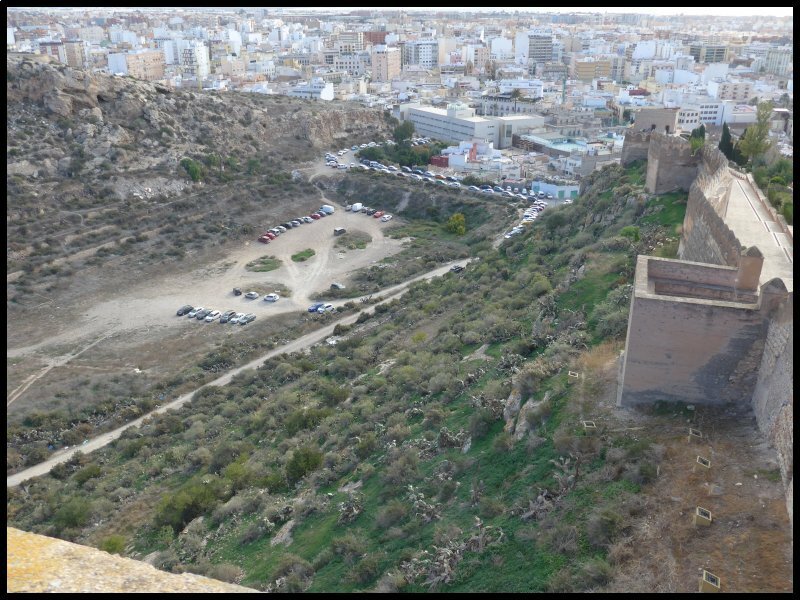 From the top of the walls there’s a grand view over the city and port. 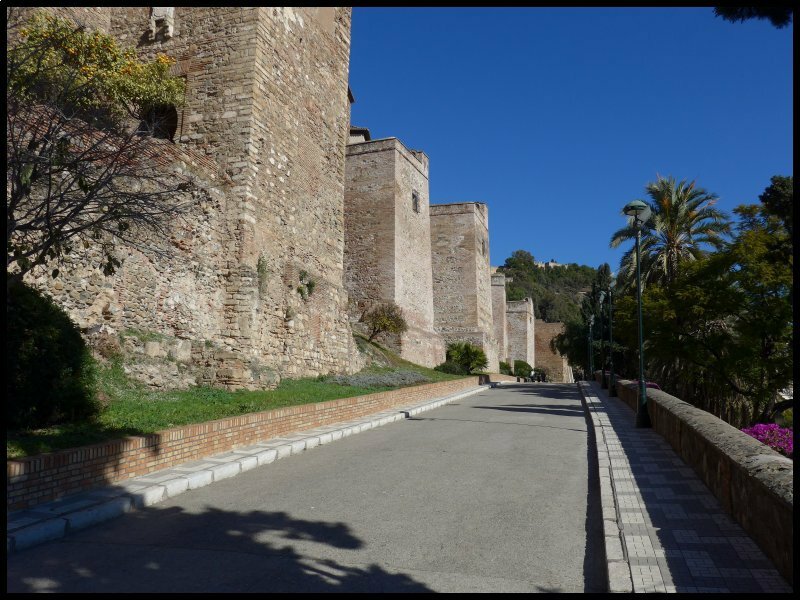 Rising even higher above the Alcazaba is the Gibralfaro castle, built in the 14th century to protect the palace. Although the two are connected, to enter the Castle now means a long walk or a bus ride to another entrance. The climb is such that I decided to leave visiting for another day – maybe. 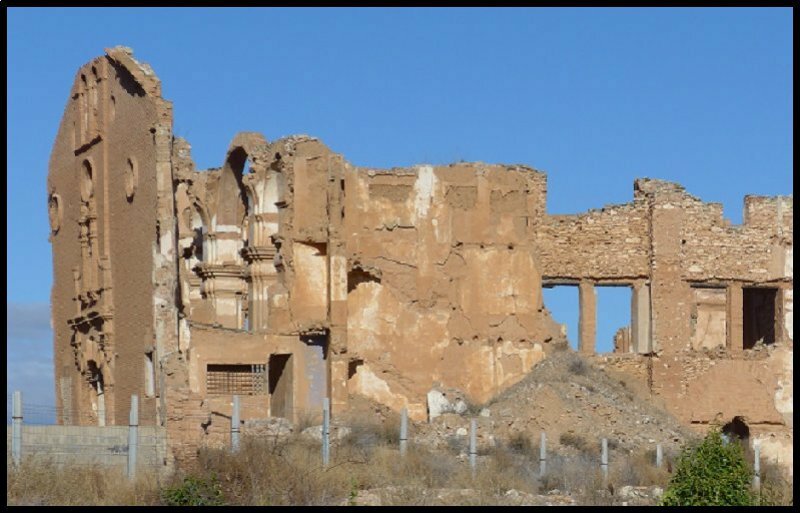 We contented ourselves with taking a look at the remains of the Roman Theatre – a treasure only uncovered in 1995 after the demolition of a modern building. We then wiled away some time over drinks at a nearby pavement cafe as we waited for sunset. 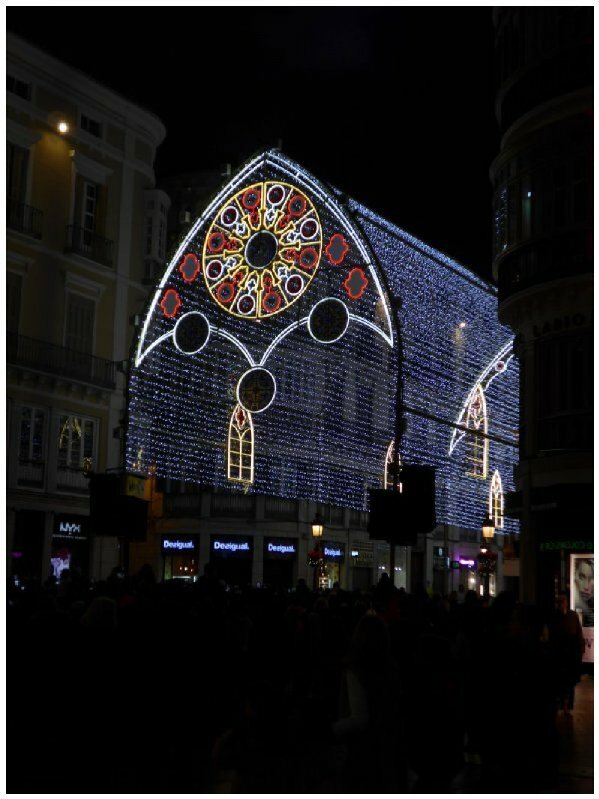 It was only a short walk to the Calle Larios where the best of the Christmas lights are to be seen. 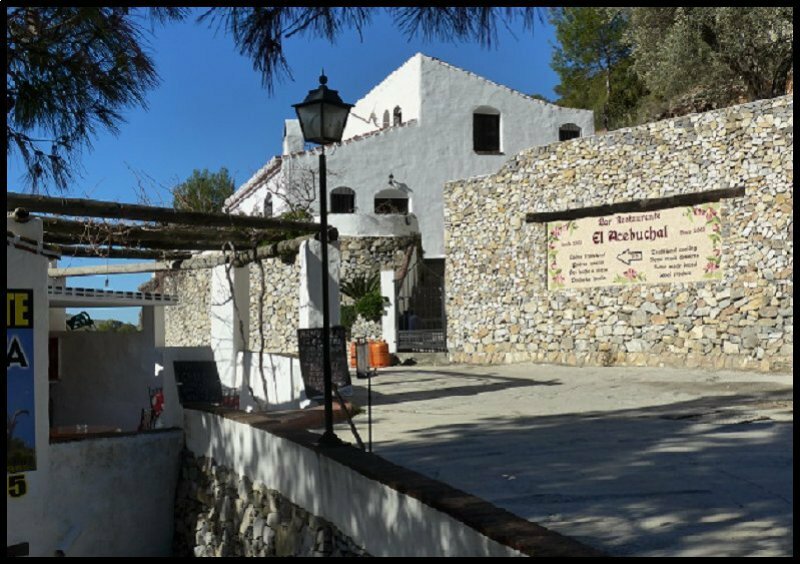 After a stroll down Larios we got back to the car and drove the forty miles to Nerja where we arrived at The Bamboo just in time for our 8.30pm booking. 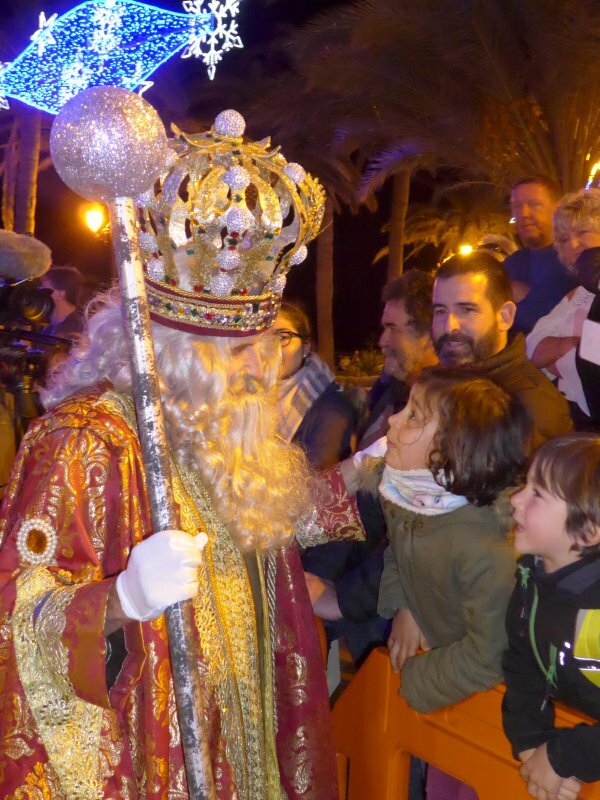 Today is a Bank Holiday in Spain because it’s the Dia De Los Reyes or Three Kings Day. In the church calendar it’s Epiphany. 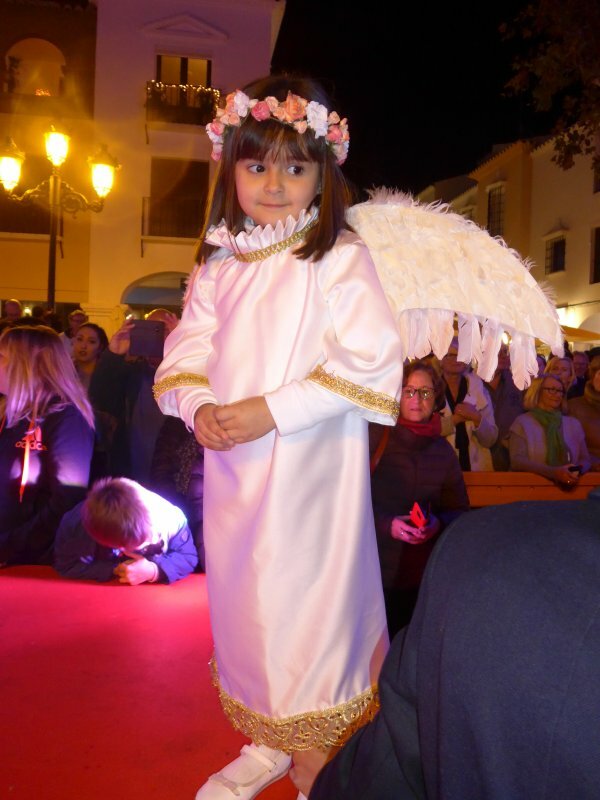 In traditional Spanish families it’s on the 6th when children receive their presents from the three kings rather than from Santa Claus, although I’m told many families use Christmas Day for present giving. 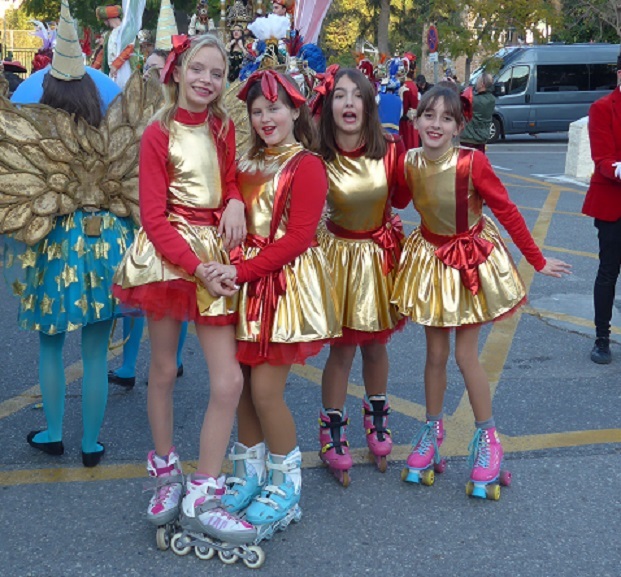 On the evening of the 5th some towns and villages celebrate by holding a fiesta with a procession going around the town. Last night I went to the one in Nerja. It began to form up in the car park on the edge of town from about 4.30pm. 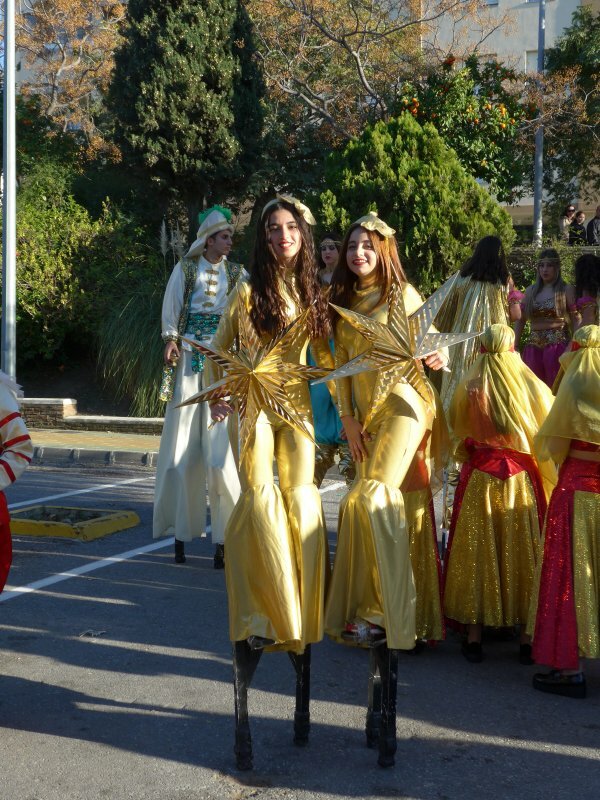 The procession is lead by young women walking on stilts. 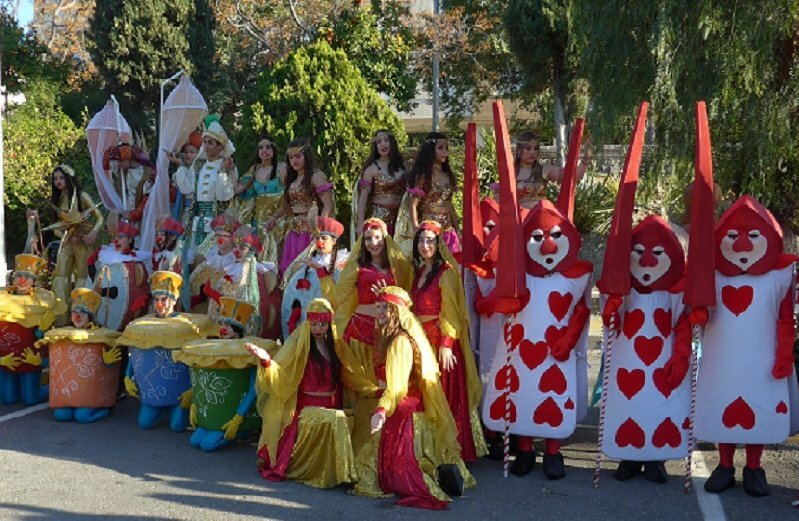 Then come groups of dancers, various bands and wind orchestras, followed by the floats carrying the three Kings seated on their thrones and surrounded by their retinue of Queens and servants. 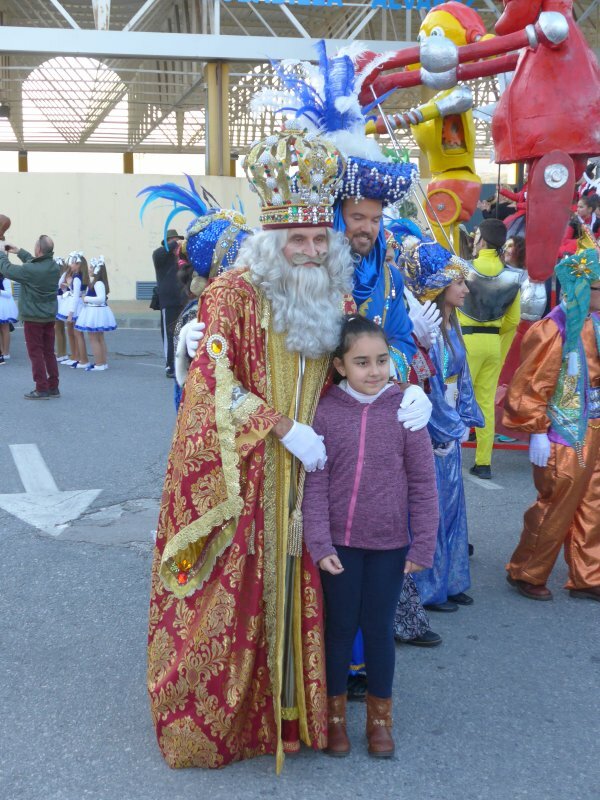 As the procession gets on its way around the town the Kings throw handfuls of sweets to the children lining the streets. 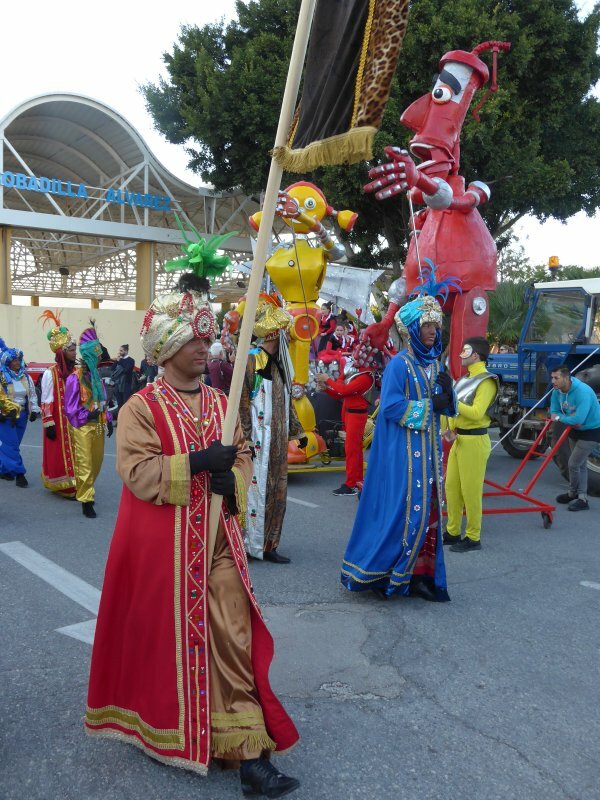 Once I’d seen the procession on its way I took to my bike and cycled across town to the Mirosol where I had dinner. An hour later, and back on the bike I rode to the Balcon where a huge crowd had gathered to await the procession. A stage was set up outside the church with a raised gangway laid out through the crowd. Seated on the stage was a Joseph and Mary nursing her baby. After what seemed an age, loud music announced the arrival of the procession. 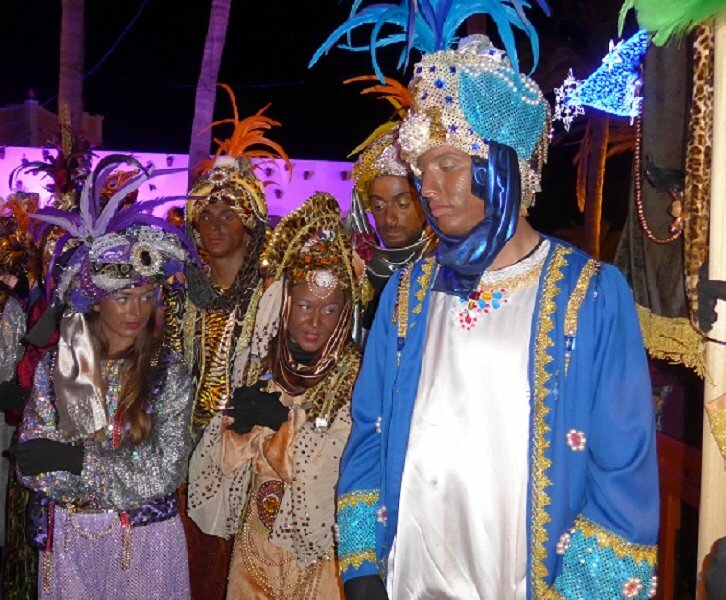 After some performances by two or three groups the Kings and their retinues began to slowly make their way up onto the gangway and to the stage where they presented their gifts. How fortunate it was that the forecasted rain held off until the fiesta was over. But in the early hours the lightning flashed, the thunder crashed and the rain hammered down. It’s almost a month since I posted my last edition and as much as I would like to have presented this page earlier, it didn’t happen. The reason comes later. On Wednesday the sky was clear right from the start and already by 9.30 it was feeling warm. I thought it was time for another day out. With lunch and a beer packed into the cool-box, and the bike loaded into the car, I set off along the coast road in a westerly direction. Within a few miles I passed a familiar view perched high up on a cliff top. What I was looking at was the familiar silhouette of a bull. 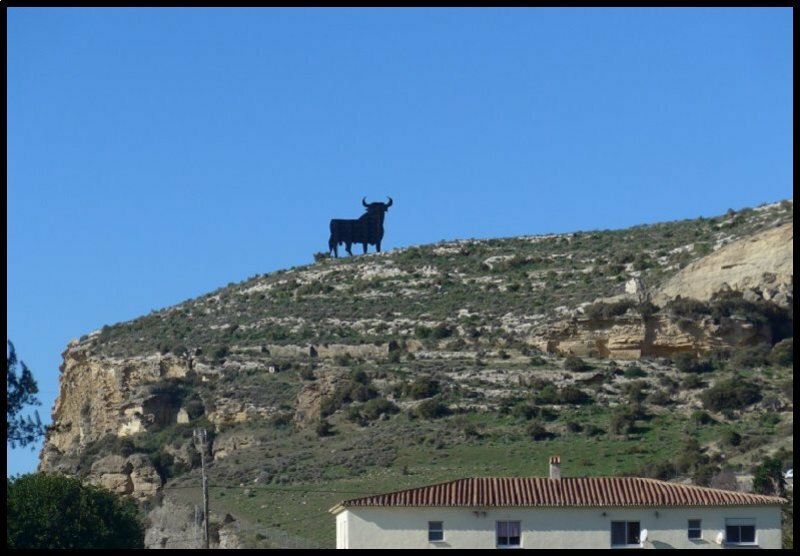 First time visitors to Spain soon become familiar with the Osborne Bulls. Not only is it often displayed as a sticker on the rear ends of vehicles, or included in sports clubs badges, but can also be seen standing proudly alongside the road network. They have an interesting story to tell. 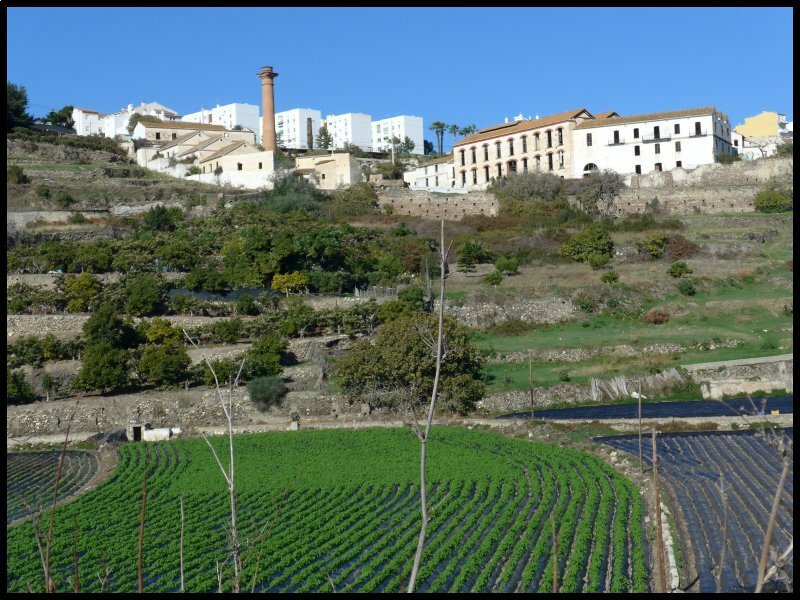 During the 18th Century Thomas Osborne Mann, a British immigrant to Spain set up the Osborne Sherry Company. In 1956 the company commissioned a local Andalusian artist to come up with a design for a roadside advertisement featuring their “Brandy de Jerez”. He designed a black bull with a red logo. The original designs were much smaller and slightly different in shape, but the signs were erected alongside the main roads. 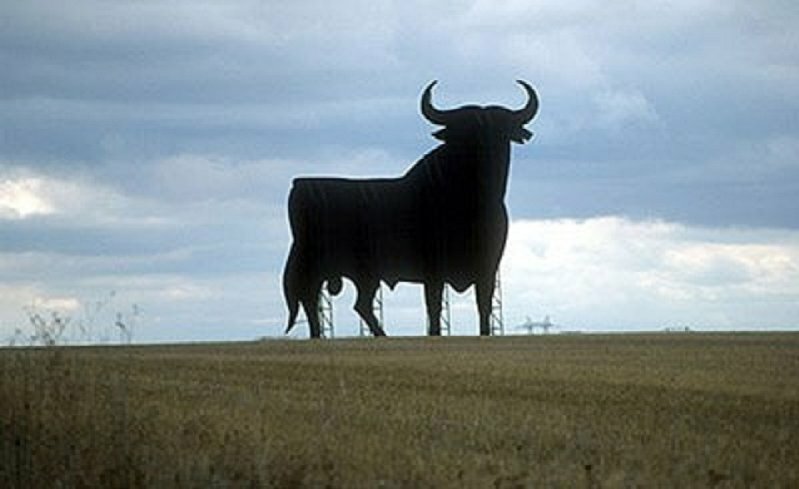 The original bulls were cut from wood which offered little resistance to climate and wind and demanded a lot of maintenance. Later the design was changed to 3mm galvanized steel sheet. 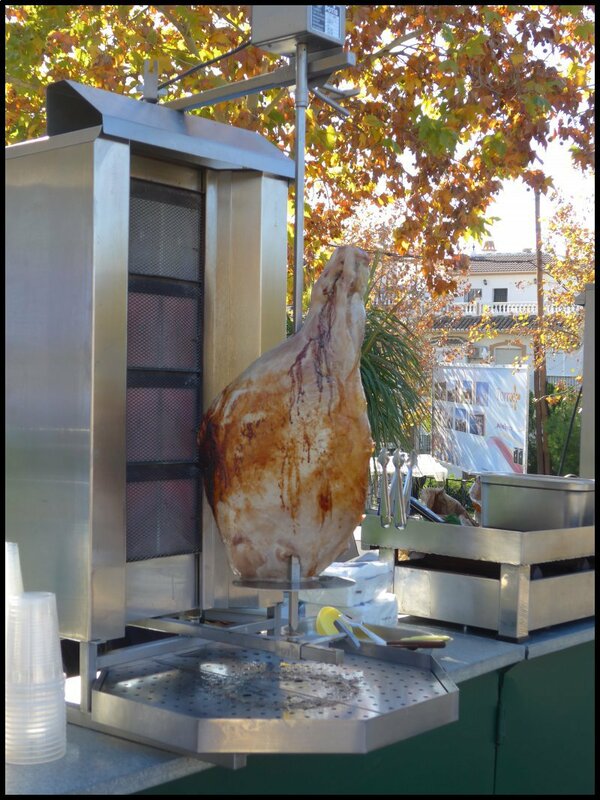 Many of the 90 or so examples standing around Spain reach a height of 14 metres and weigh up to 4 tons. 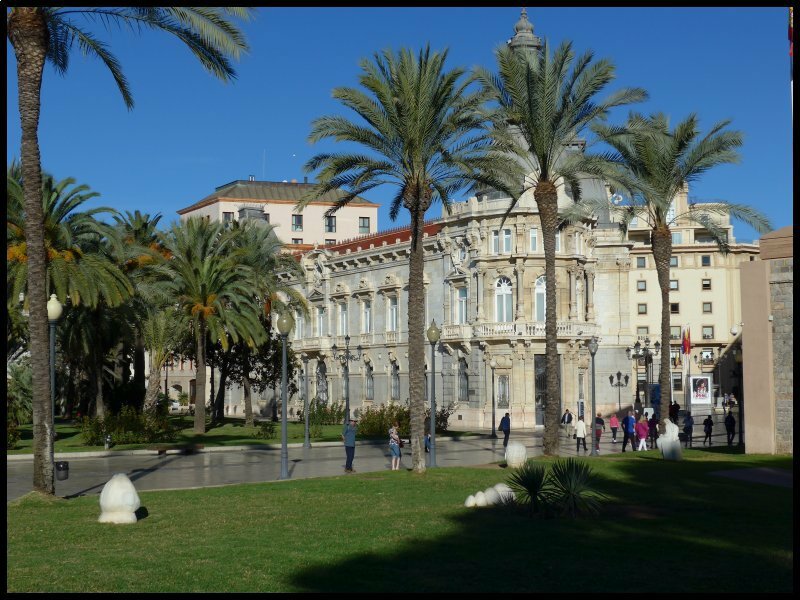 Parking is virtually impossible in central Malaga so if I have the bike with me I usually drive to the far end of the promenade and park near there. There, I unload my bike and cycle into the City. 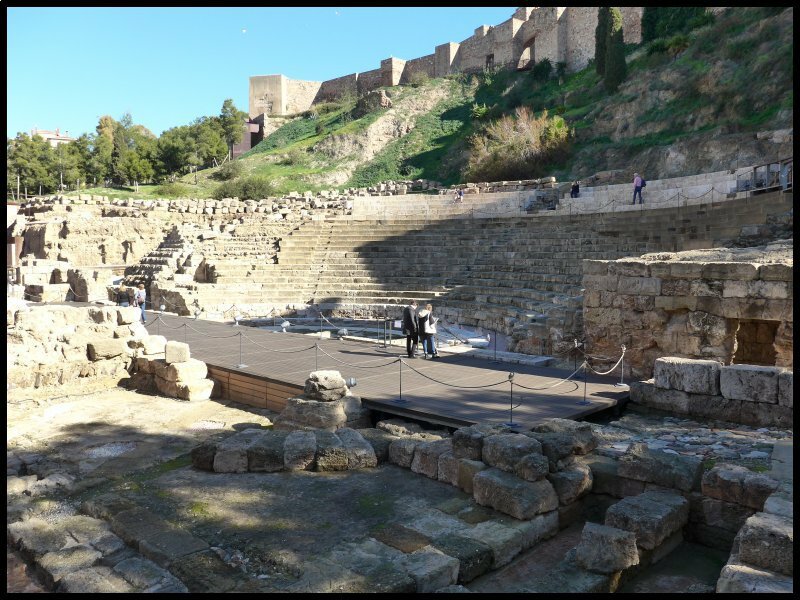 On this day, my aim was first to visit the Roman Theatre, then cycle up to the top of the hill to see the Gibralfaro, then finally visit the Cathedral which was closed the last time we came here. I rode straight to the Roman Theatre and locked up the bike. 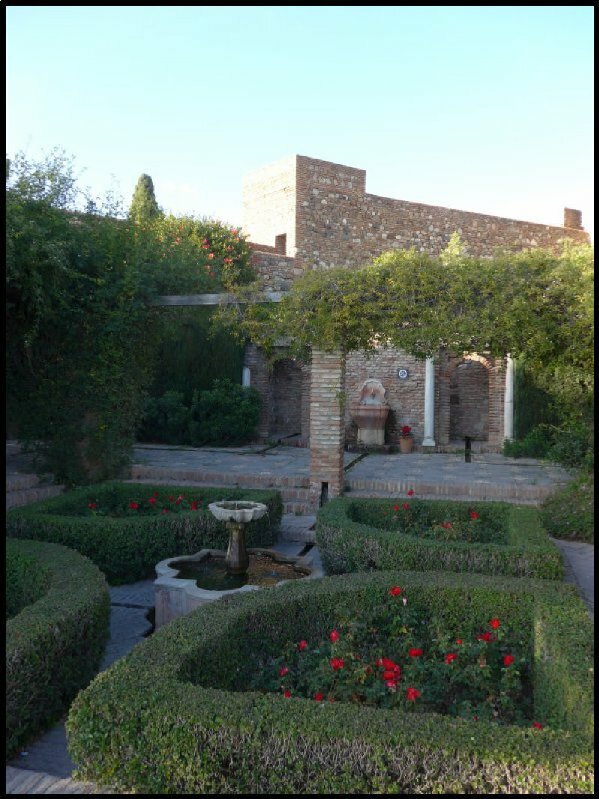 I ignored the Alcazaba – the fortified palace built in the 11thC because we visited it a few weeks ago and my account is written elsewhere. 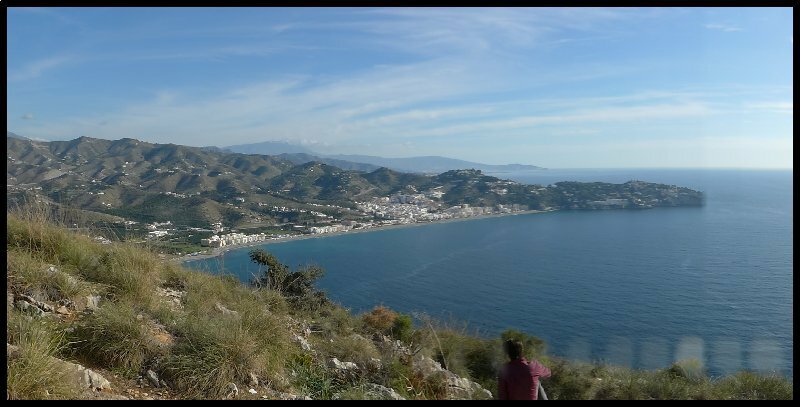 Instead I took to the bike and cycled up hill along side it, up to the Gibralfaro. The higher I rode, the narrower the pathway became. Eventually I arrived at steps so I locked up the bike, chained it to a lamp–post and left it. My word, what a steep path it was. It snaked its way upwards, forever expecting that around the next bend, I must surely be at the top. 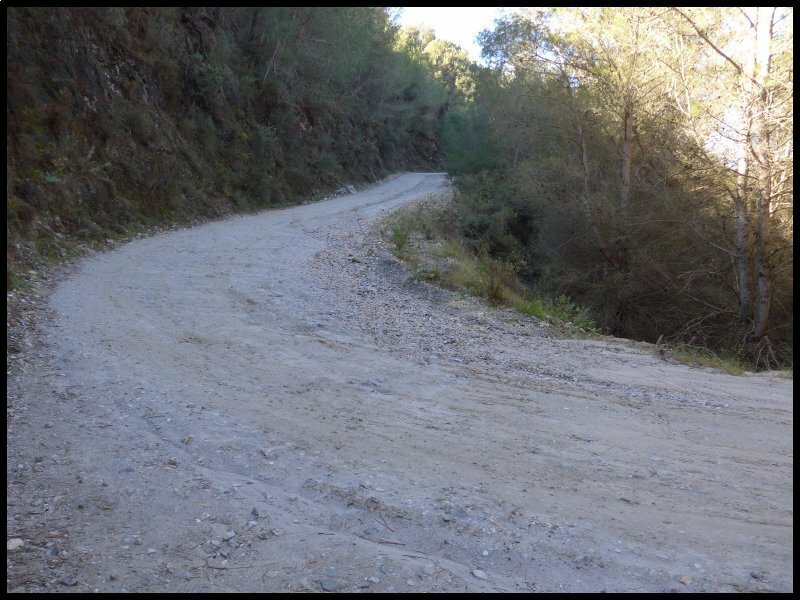 But no – another 100 yards or so before another hairpin bend. But soon there was a viewing balcony with a marvellous view across the city. I got out the camera and took a panoramic picture. 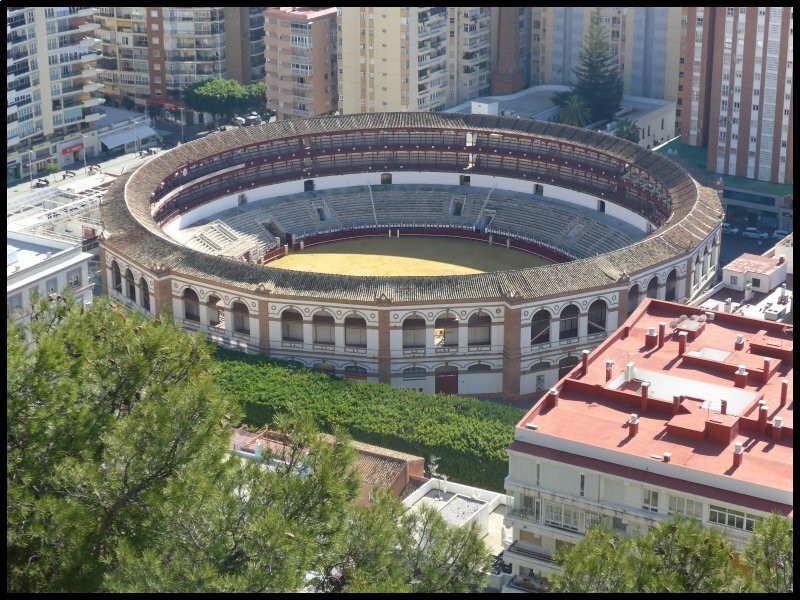 Starting from the left, and almost out of the picture is the bull-ring, built in the 1800’s but now completely surrounded by modern buildings. At mid-centre is Malaga docks with the car ferry almost ready to begin its journey across to Melilla in Morocco. In the foreground are the gardens of the Customs House whilst round to the middle right is the one tower of the Cathedral. 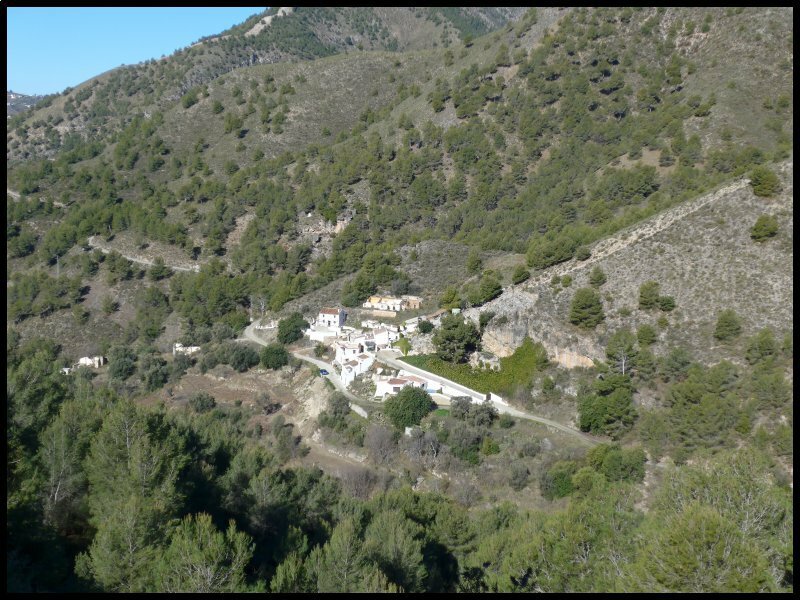 The trees at the bottom right hide the Alcazaba. 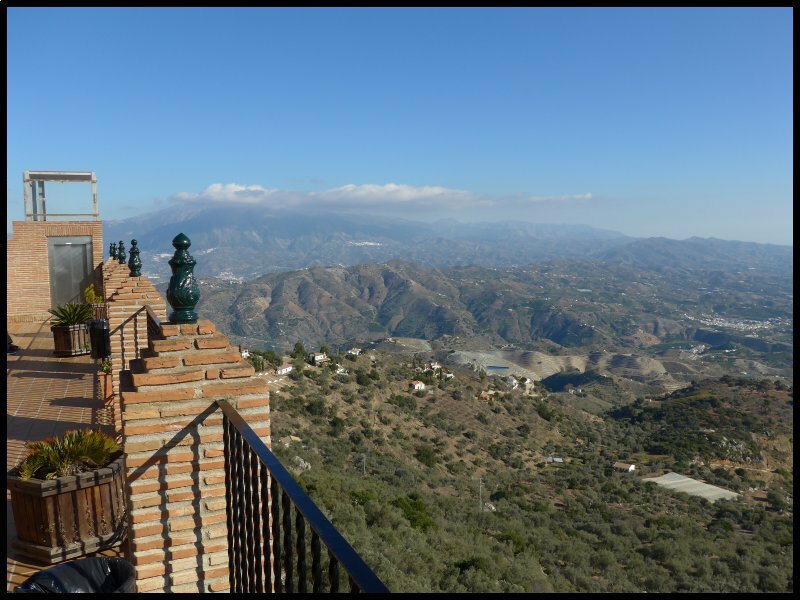 In the back ground is Mount Calamorro – the back-drop for Torremolinos. But back to the hill climb. A few more lengths; a few more bends and finally, I was there – at the entrance. Once inside, there was even more climbing. This time up steep steps to the walk-ways around the castle walls. 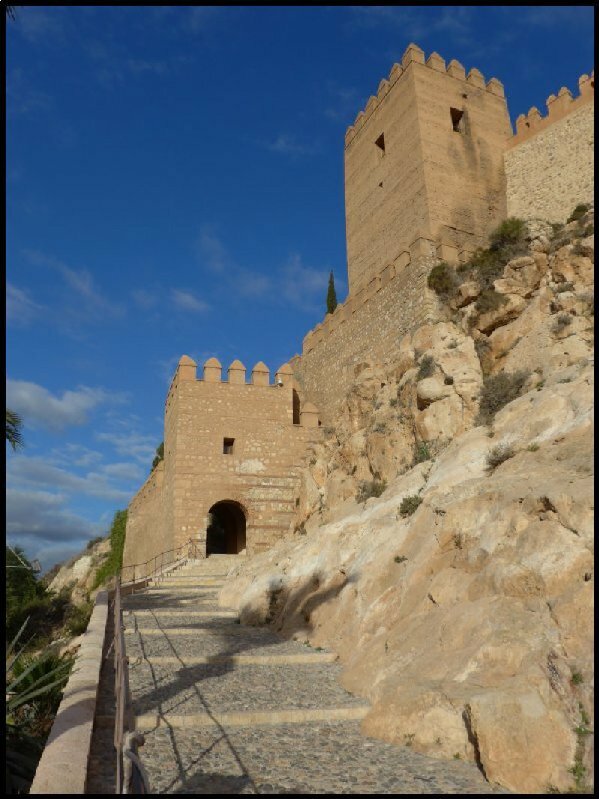 The castle was built in the 900’s by the Caliph of Cordoba, on a former Phoenician enclosure and lighthouse, Then at the beginning of the 14th C the Sultan of Granada, enlarged it. 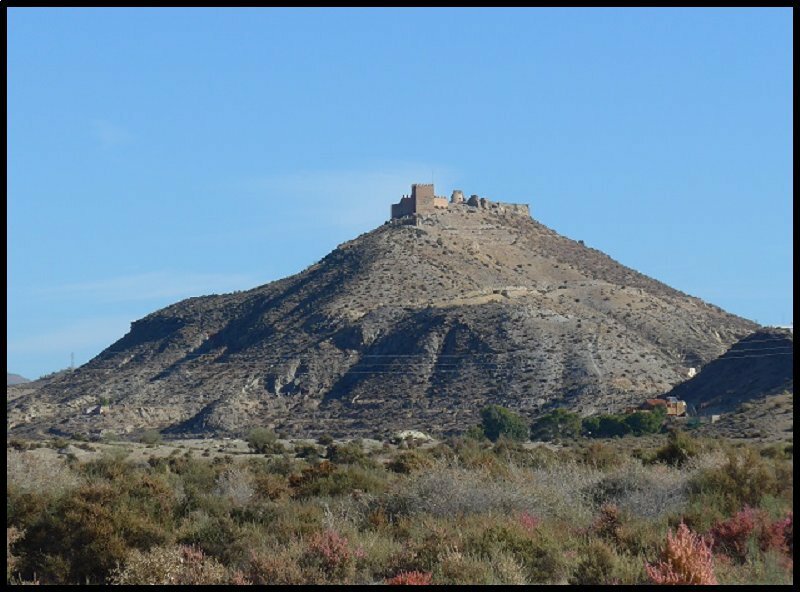 The castle held out against a three-month siege by the Catholic monarchs, Ferdinand and Isabella, which ended only when hunger forced the Moors to surrender. Afterwards Ferdinand occupied the site, while his queen took up residence in the town. leaving the Cathedral with only the footings for the second tower and the frontage between the two tower bases without coping stones. Stories for the stoppage of work in 1780 abound. 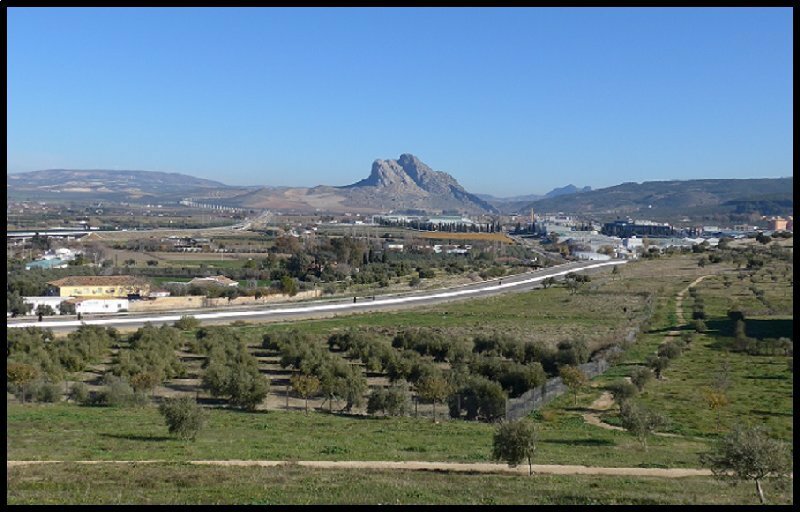 Two of the favourite stories are that the money was diverted to America to help fund the War against Britain, and the other that the road between Antequera and Malaga was in need of urgent attention. 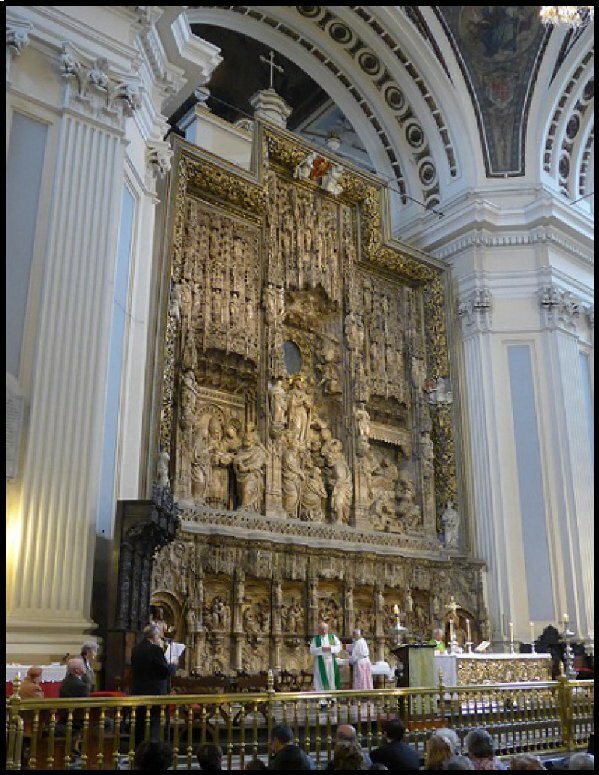 The Cathedral work has never been restarted and although there is support for completion, agreement is never reached. The ground plan of the Cathedral is of three naves standing side by side. 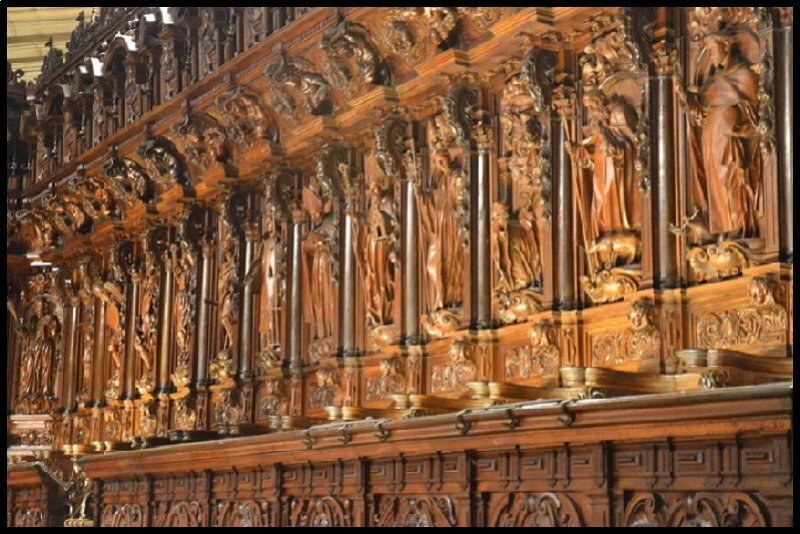 My first stop was to see the Choir stalls. What an exquisite display of craftsmanship. 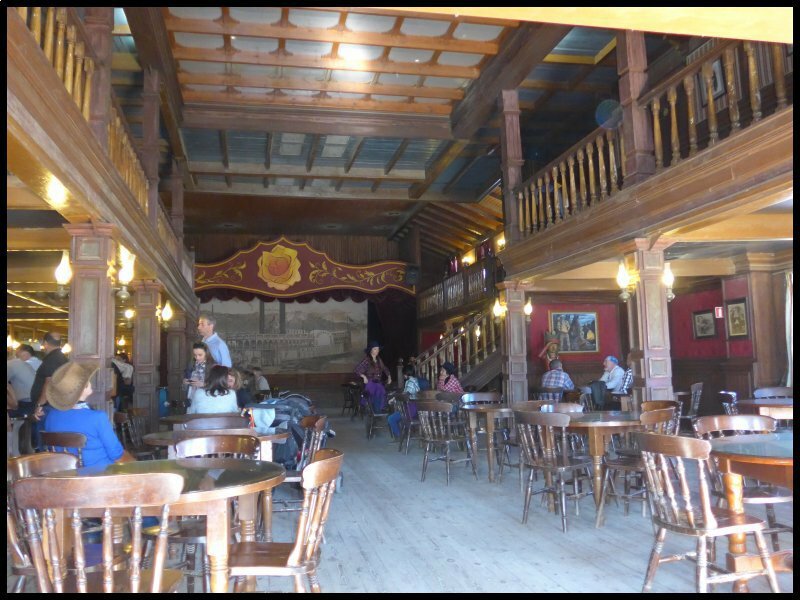 Forty-two finely carved seats and canopies all done in contrasting timbers and all depicting a different character. 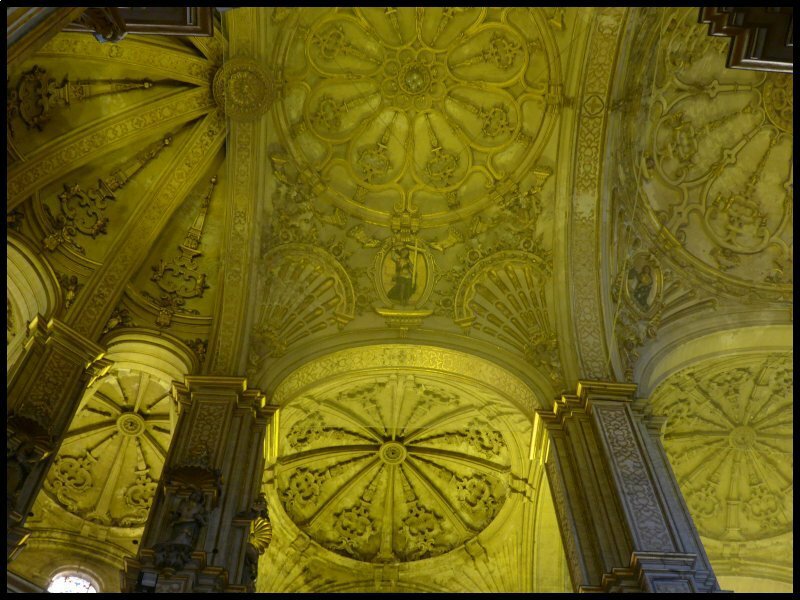 They were designed by a pupil of Granada’s Cathedral mason and carved by a team of master-craftsmen. 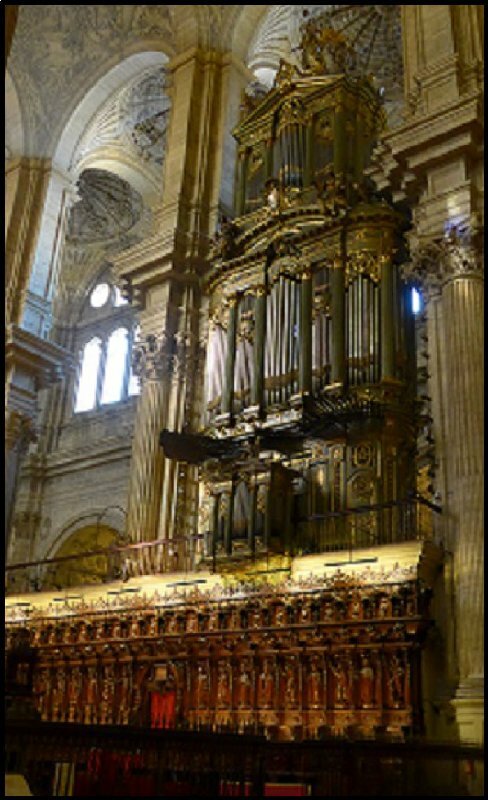 Above the choir is one of the two 18thC pipe organs. Back on my bike, I set off homeward bound around the Cathedral precincts. But just too late, I realized I was riding over freshly washed marble tiles. My wheels slipped from under me and I crashed down on to the tiles with the bike on top of me, A young guy helped me up; I assured him I was OK; I got back on the bike congratulating myself on a lucky escape..…………… I felt fine! ………… I rode the four miles back along the prom. Folded the bike and loaded it into the car and set off on my forty miles drive back to the site. 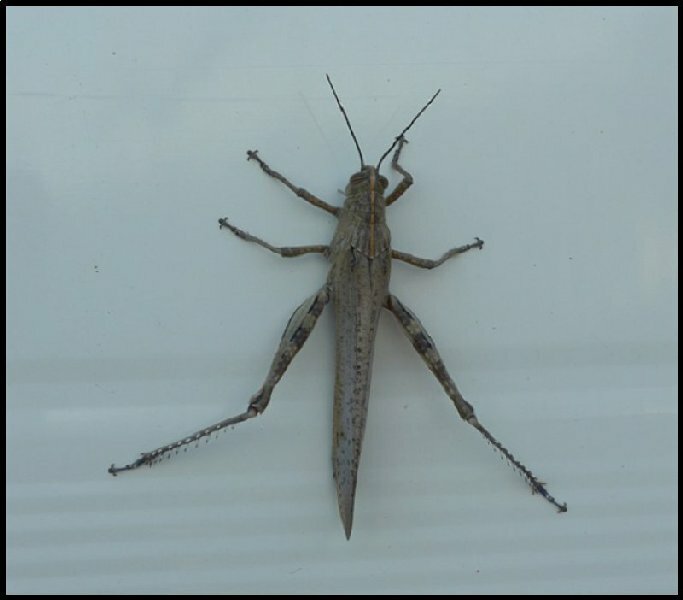 But with the car unloaded and myself back in the caravan I began to shiver and shake. I didn’t want to eat and felt very sickly. After a hot drink, I went to bed. By morning (probably because of Warfarin) my right leg was a deep purple from groin to ankle and very painful to move. Gradually over the next two weeks, with gentle exercise, movement became easier and less painful. Then just as I was thinking I had turned the corner, I took my weekend-visiting daughter out for dinner to celebrate. But misfortune stayed with me. I picked up a stomach virus. That confined me to the van for several more days, and only now am I trying to put the memories of a miserable three weeks behind me. 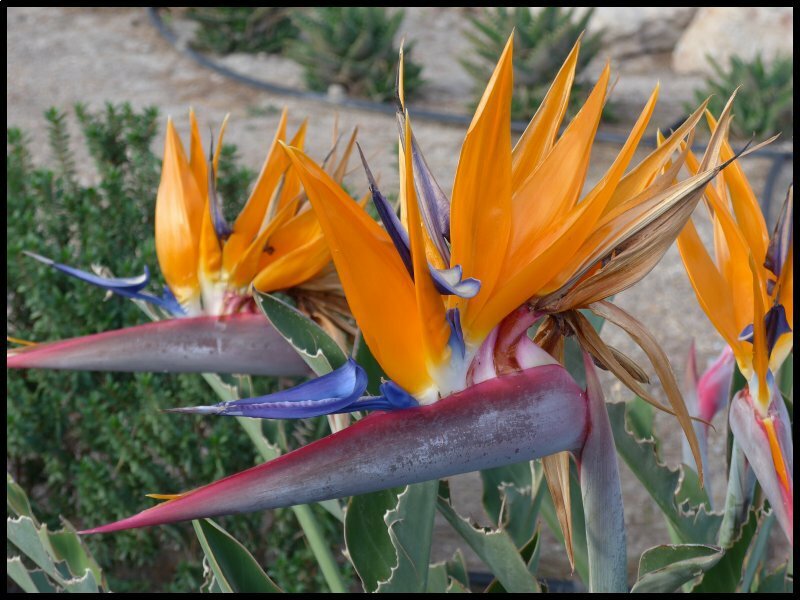 There’s no doubt about it, and most of the visitors here in southern Spain agrees, that this has been the coldest winter we have experienced. That’s not to say that it has been wet, because it hasn’t. You only need to see the shockingly low levels in the reservoirs to appreciate that, but many nights have been much colder and some days have been decidedly chilly. Of course that’s speaking relatively. When I say some nights have been cold I’m talking 5oC and a chilly day is when the temperature doesn’t get much above14oC. Probably in a few weeks time when I’m home, 14 degrees will seem quite barmy. But yesterday, when the Australian guy told me 21 degrees was forecast for the afternoon, I had a sudden urge to pack some lunch and a beer into the cool box and go out for the day. This would be my first day out since that disastrous fall off my bike four weeks ago. 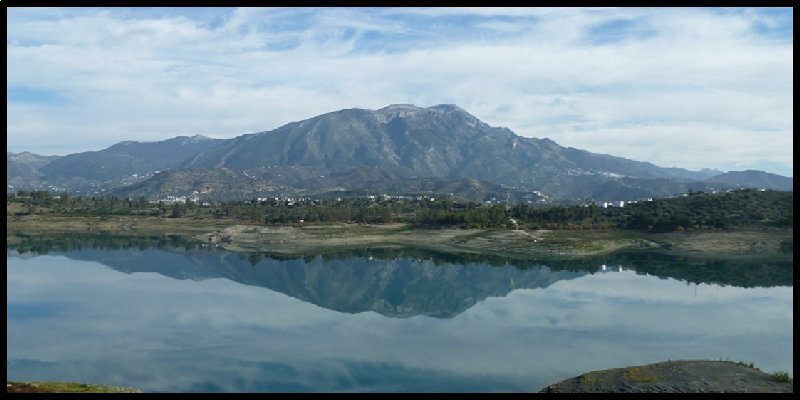 I set off along the motorway to Velez Malaga where I turned inland and headed up to Lake Viñuela. I resisted the urge to stop at my favourite lay-by over-looking the Lake and instead, headed over into the next valley where I took the road up to Alcaucin. 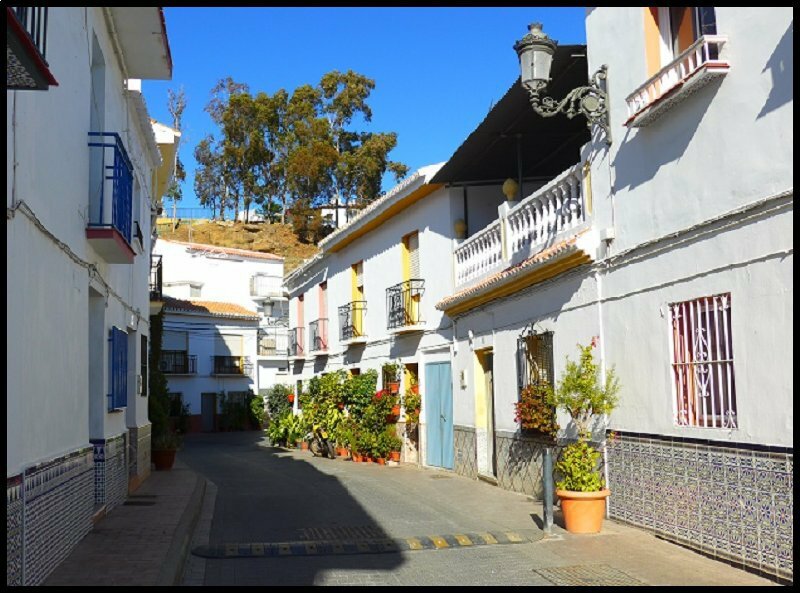 The village is located in the foot hills of the Sierra de Tejeda mountains and from the road climbing up to the village, there are some stunning views. Looking across the valley is the U-shaped pass known as the Boquete de Zafarraya. It was here just a few years ago that in one of the caves high up above the pass, the remains of a Neanderthal skeleton was uncovered. A twisting, steep road leads through the pass to the village of Zafarraya which is built on a plateau on the far side of the mountain range. 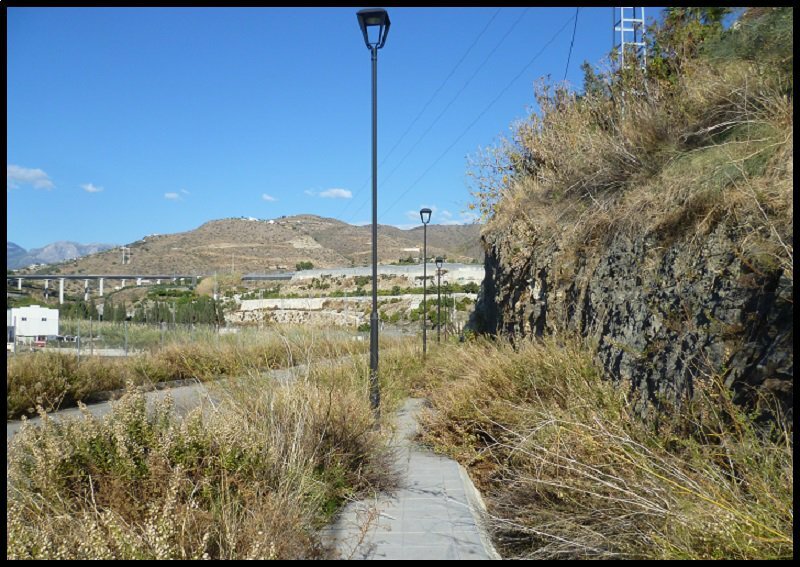 The road was once an important trade route between Granada and the coast. 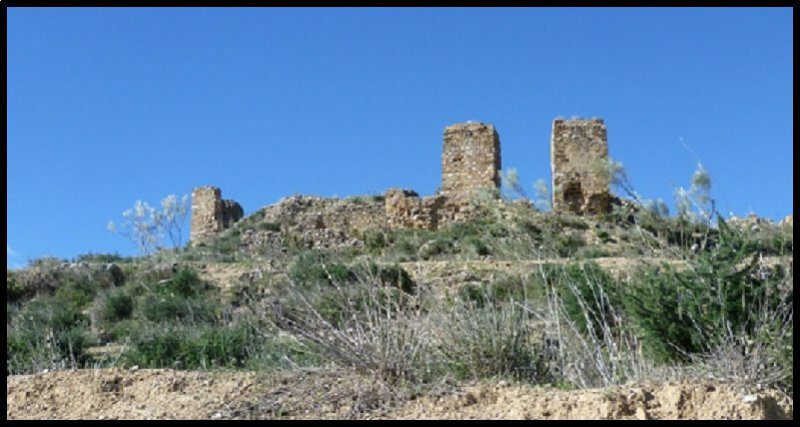 So much so, that the Moors built a castle and town over looking the road. 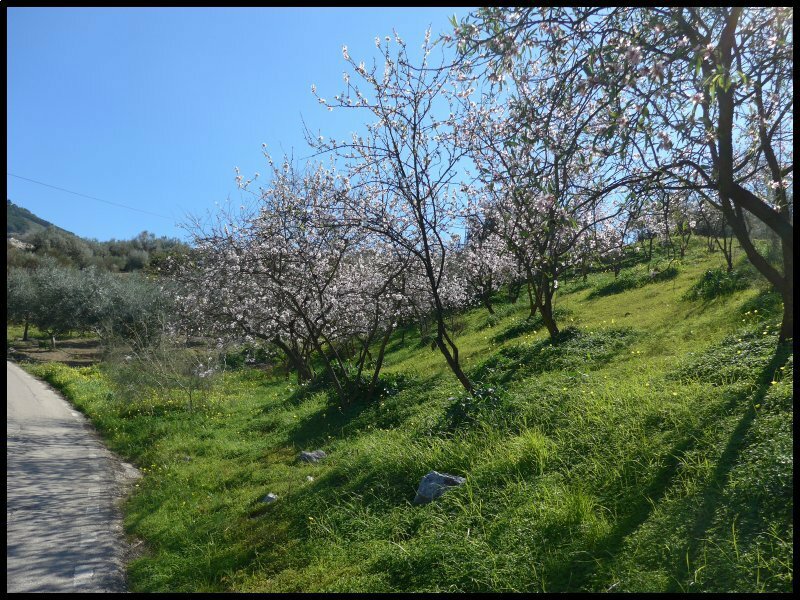 Closer to my view point were the first signs of Spring with the almond blossom beginning to bloom. 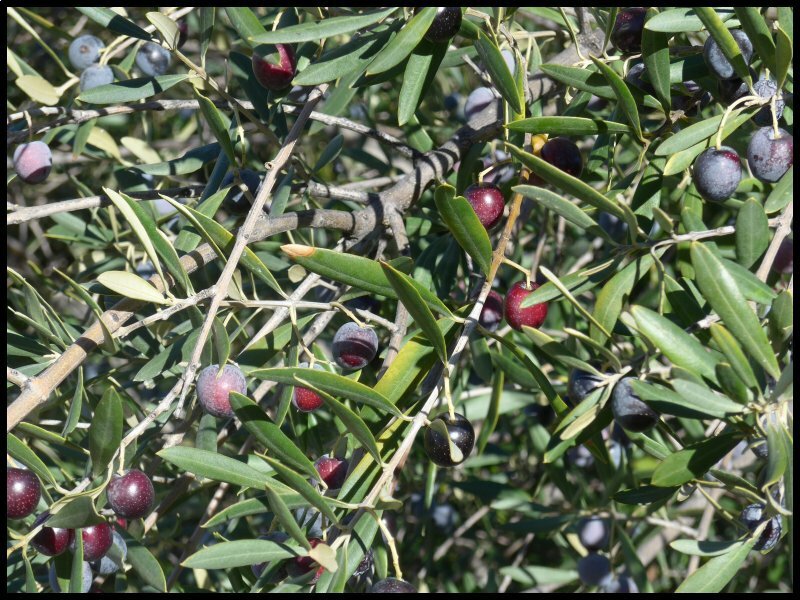 The olive harvest was also just getting underway with huge sheets being spread beneath the trees. 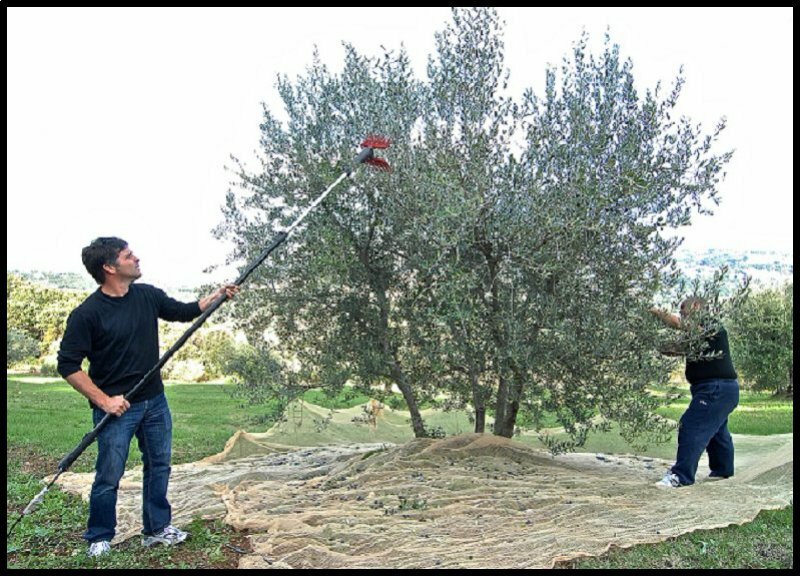 Labourers then use long handled rakes to pull down the olives before being gathered up and packed into sacks. 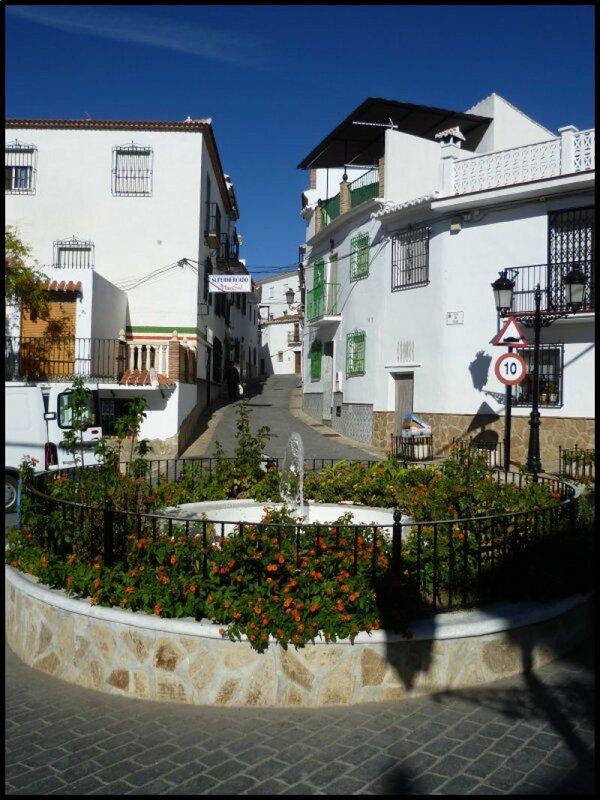 At the village the road ends so with no through traffic, it has an unspoilt, traditional charm. Car parking is at both ends of the village. 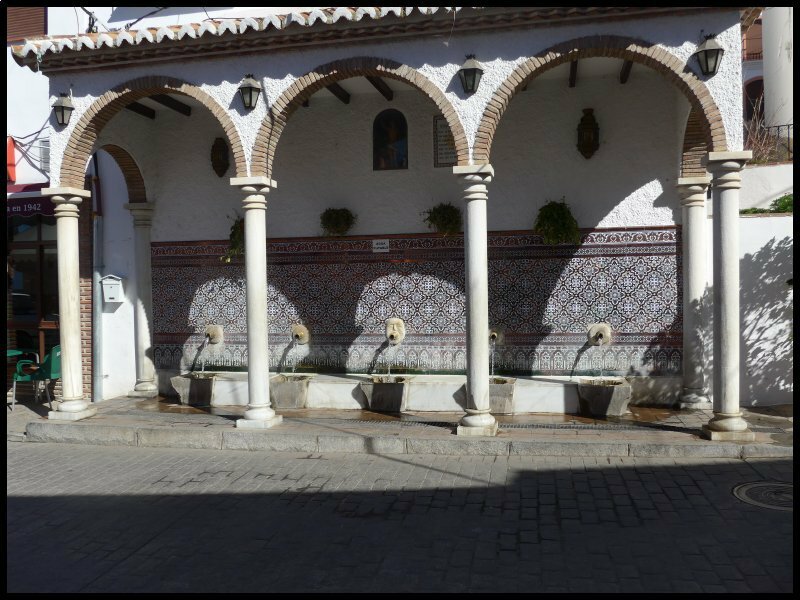 Walking through the narrow streets, the first object of interest is the restored Moorish fountain, La Fuente de los Cinco Caños, with its five spouts providing fresh spring water. Whatever the time of year, the fountains never cease to run. There’s a traditional story that if an unmarried person drinks from the centre spout, that person will marry someone from the village within the year. But there’s no need to rush! I tried it three years ago and it didn’t work! From the fountain I walked through the narrow streets up to the tiny Plaza where there’s the town hall and the 16th Century church. What a shame all these beautiful photo opportunities have to be spoilt by the parking of cars. The best shot I could find was the bell tower peeping over the orange trees. 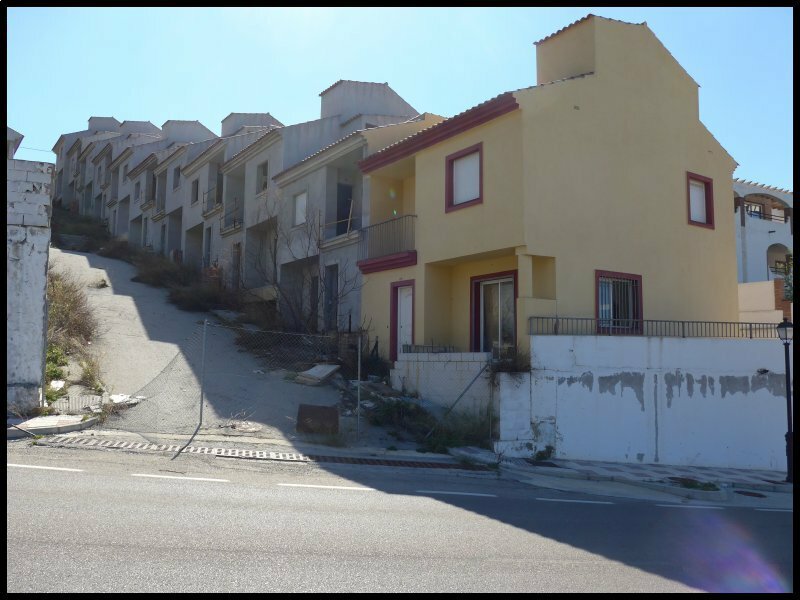 There can’t be many towns and villages in Spain without its share of abandoned building projects. Sadly the outskirts of this beautiful village is blighted by hundred of half built apartment blocks and houses. These ones have been derelict for more than 10 years. Whatever will become of them? Time is running out! Not too many days left now. 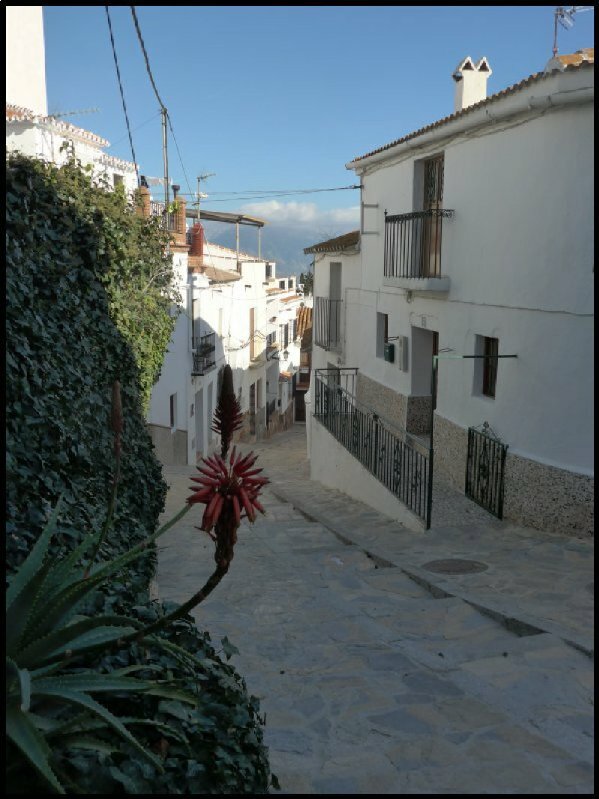 But it looked as though another beautiful day was on the cards which I thought would be good to take advantage of before I’ve got to start getting the awning taken down before heading homeward bound, so with lunch packed into my cool-box, I headed up into the hills beyond the white village of Frigiliana. 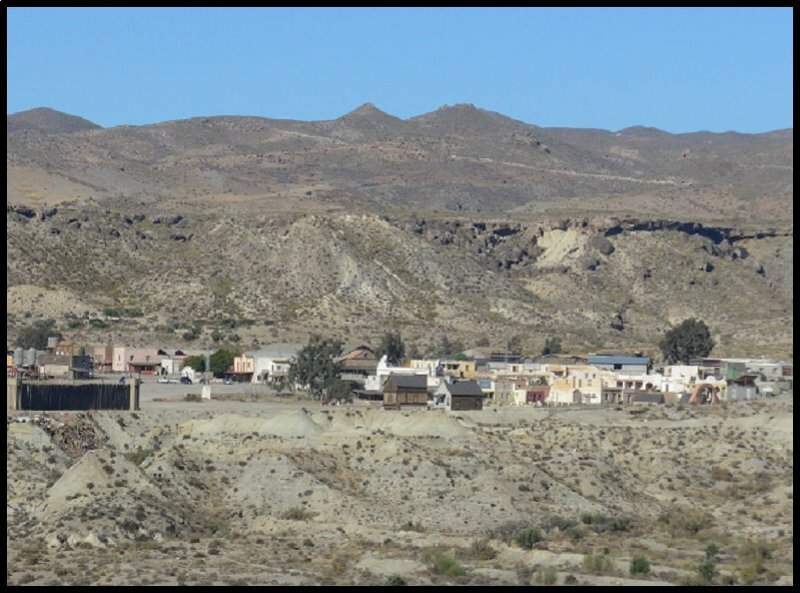 My aim was to take another look at the remote hamlet of El Acebuchal. Even now it doesn’t have a surfaced approach road. A dirt road wends it way around the hill sides for four miles or so before descending into a valley where there’s a collection of houses. 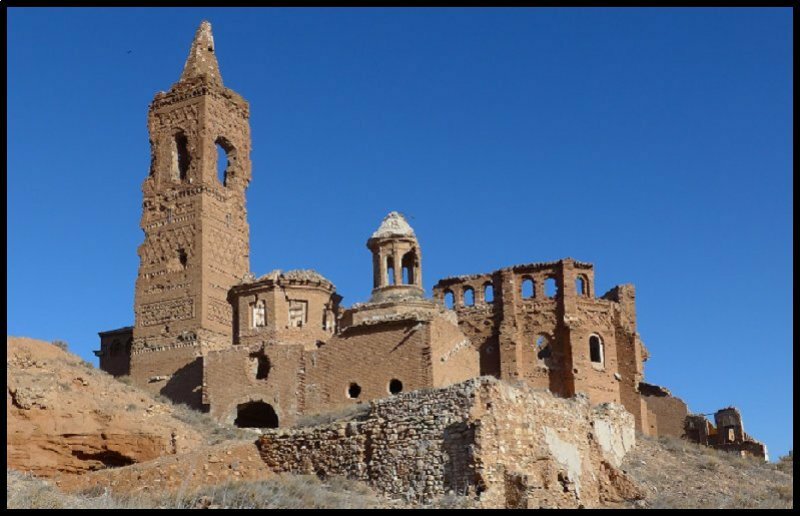 The place came into being during the 17th Century since it sits alongside one of the ancient mule routes between Granada and the coast. 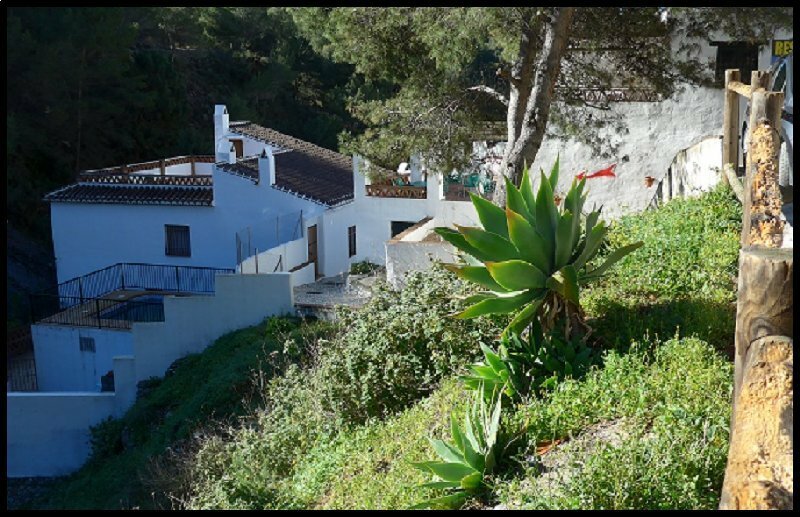 Life would have been hard for the inhabitants but it became even more difficult when they were caught between Franco’s Guardia Civil and the guerrillas who had taken to the mountains at the end of the Spanish Civil War. 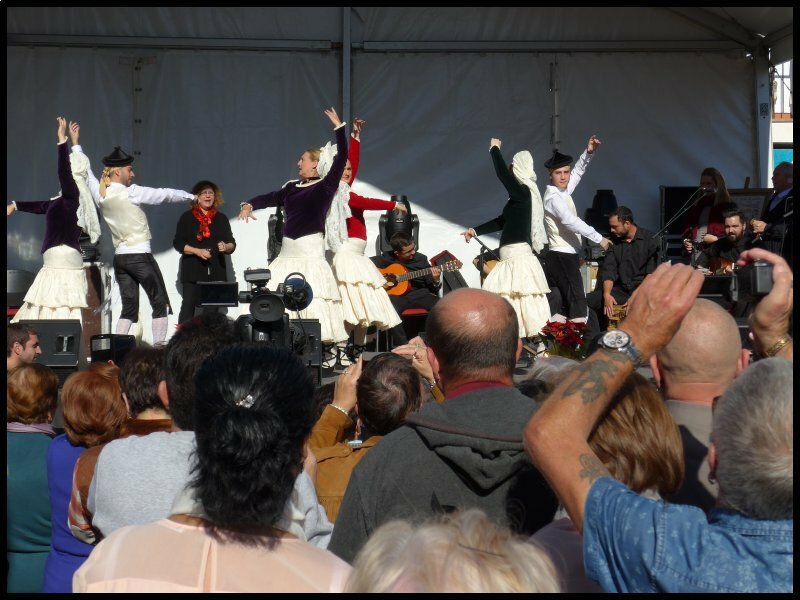 The Franco authorities suspected that the villagers were supporting the rebels by providing them with food and refuge. Some of the villagers were summarily executed; others were imprisoned, and eventually, those remaining were ordered to leave their homes together with their live-stock. 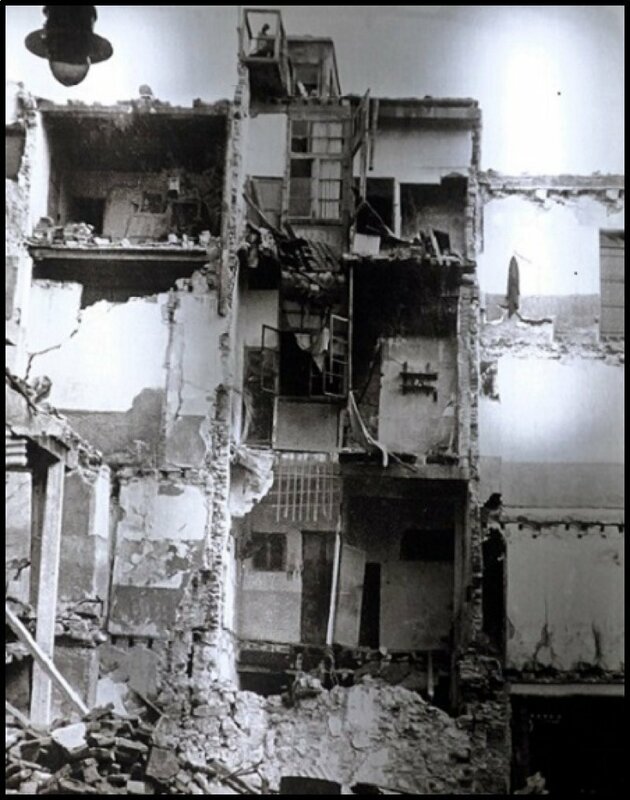 The roofs of the houses were pulled down so that they became uninhabitable. 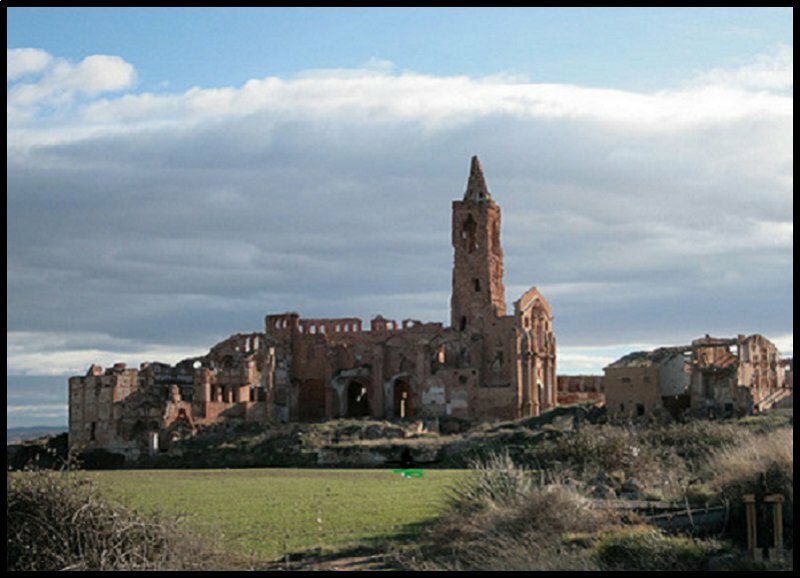 And the village became known as the “Pueblo el Fantasmas” – the village of ghosts. And so it remained for the next half century. Then twenty years ago a descendant of one of the original families decided to try to rebuild his grand-parents old house. 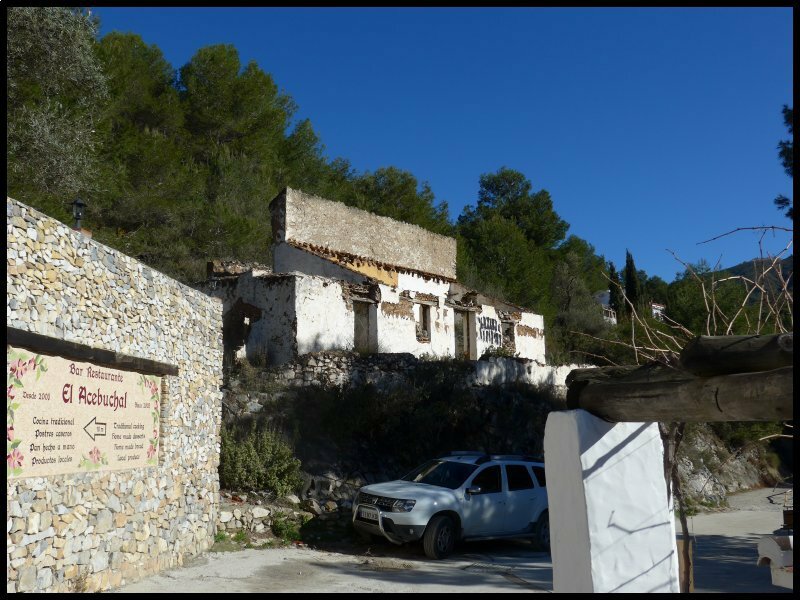 Those premises are now the village’s bar and restaurant which has built up quite a reputation. The church has been rebuilt and it had its inaugural service in 2007. Several other houses have been renovated and occupied, whilst others are still derelict. 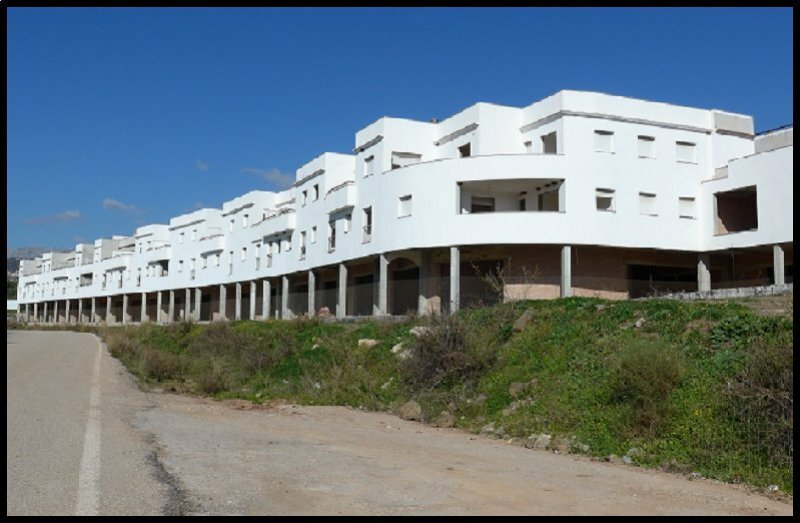 In fact 36 houses are now habitable – many of them as holiday lets however, besides being no metalled road, there’s also no telephone land-line, no mobile reception, no shops or ATMs. Somebody couldn’t wait to get there! It had to happen. Leaving day had almost arrived. It was time to prepare to head homeward. I’d planned to set off on Friday, doing a leisurely four day drive north. In the forecast the weather looked good all the way through Spain, although with some very cold nights. I decided packing up would be best done on Wednesday. I made a half past eight start by cleaning and dismantling the awning kitchen unit. I’ve got a microwave oven and an electric oven with a two burner hotplate on top of it, all sitting on a table with an extension top. Once the ovens were cleaned, they were put on the floor in the bathroom giving me access to them on the journey. Then the two PIR halogen strip lights which clip to the awning roof bars were taken down and packed in the car. By 9.30, friend William had arrived with step ladder, long brush and bucket. He then set to cleaning the awning roof of three months worth of bird droppings. Next to arrive was Jim, closely followed by Paul. I am so grateful to these guys, both those three who helped me pack up, and Martin who helped me with the awning away back in November. By 11.30 we were finished so we broke open the beers with me being very relieved that all the gear had been packed away in the dry. 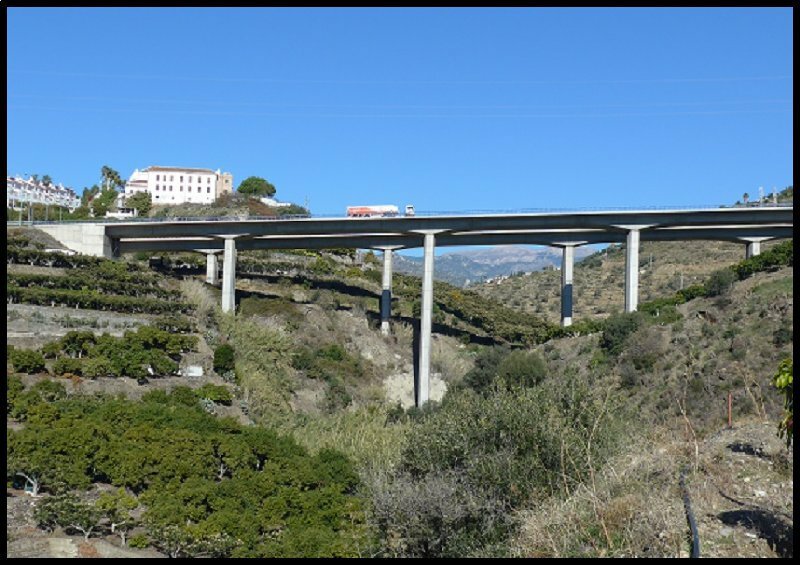 I left El Pino at around 9.15 on Friday morning and within 10 minutes I’d reached the A7 motorway, heading eastward towards Motril. 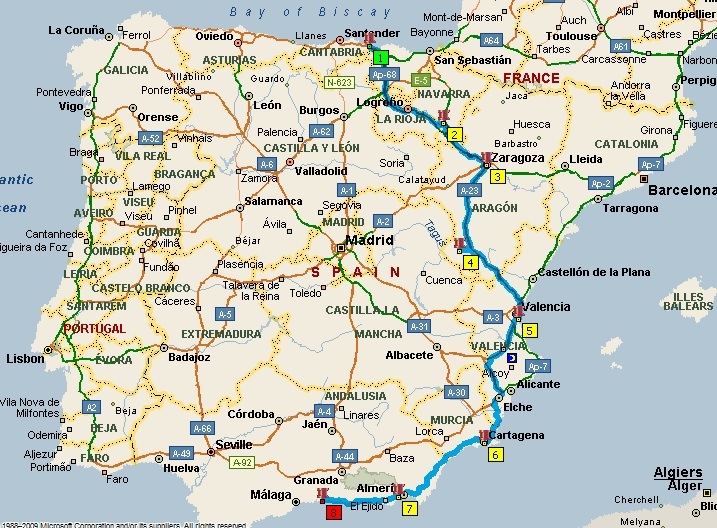 The journey now (except for the approach roads to my overnight stops) would be entirely on dual carriageway all the way to Bilbao – and nearly all of it would be toll-free. After I’d driven 100 miles and was on the A44, at KM70 (or there abouts), I pulled into a Repsol filling station, cafeteria with large parking area to take a coffee break. 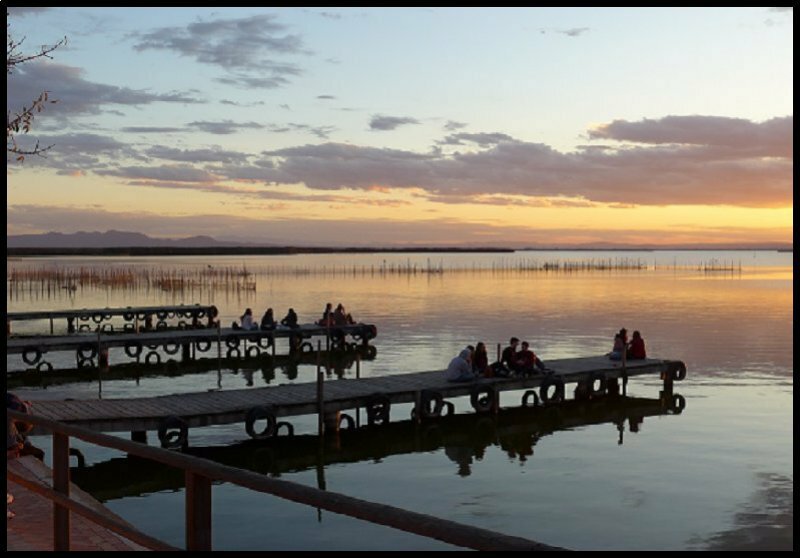 Within 15 minutes I was on the road again and I didn’t stop until I’d completed 170 miles which brought me to Santa Elena. When I saw the Osborne Bull I knew I needed to turn at the next exit. 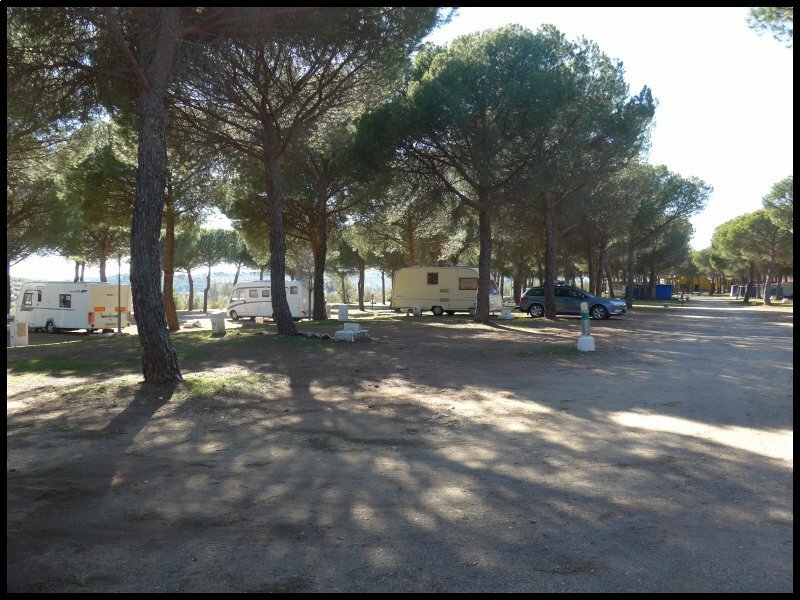 I booked in at Camping Despenaperros which is situated at the far end of the village in Calle Infanta Elena. 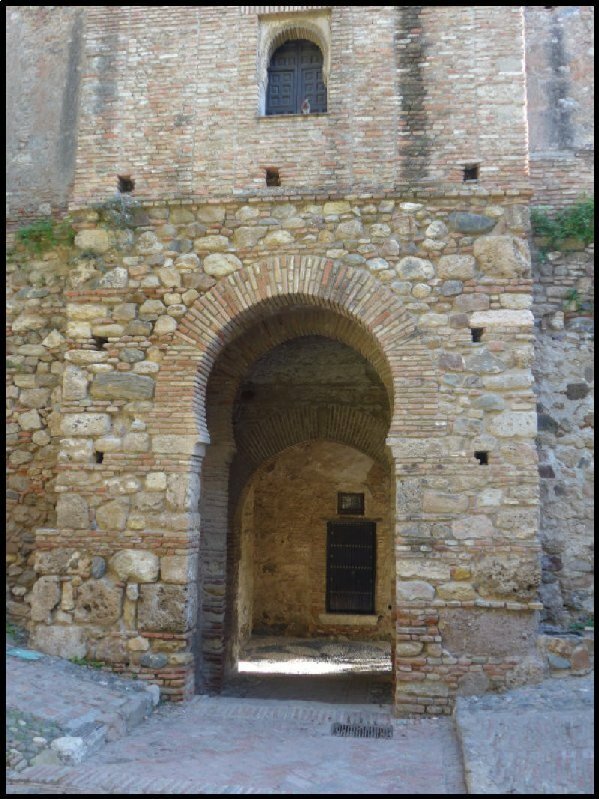 The site entrance has a double arched entry which with long outfits needs some care in entering. Pitches are level and all under trees without any boundary markers. Each pitch has an adjacent electric point, water tap and drain connection although some of the electric sockets require attention. Electricity is switched on at reception so if the supply is accidentally tripped, you maybe be in trouble since reconnection requires a visit during office hours. The toilet block is centrally placed on the site and all the facilities are modern and in a clean condition. However, whilst toilet rolls are provided, none of the pans are fitted with seats. Free Wifi is available over most of the site. With my ACSI card I was charged €17 per night. For the past four years the motorway has been carried over the gorge on a viaduct and to join the motorway requires a drive through the village to the junction however, I turned right and drove down through the gorge to the next junction. During the journey I’d been debating with myself whether to make my next night stop south of Madrid at Aranjuez or north at La Cabrera. I finally decided to get north of the City so I took a coffee break at the filling station at KM98 on the A4 after driving for 100 miles. I also took on some fuel – but not too much. I didn’t notice the price until I’d started to fill. A whopping €1.20 per litre. That particular stop has easy access from the motorway and a good parking area. My rest over, and I headed towards Madrid. There are three ring motorways around the city. The M30, the M40 and the M50. The M50 takes the widest detour and adds about 10 miles however it carries the least traffic, so I turned on to it at junction 17. It joins the A1 at Junction 21. 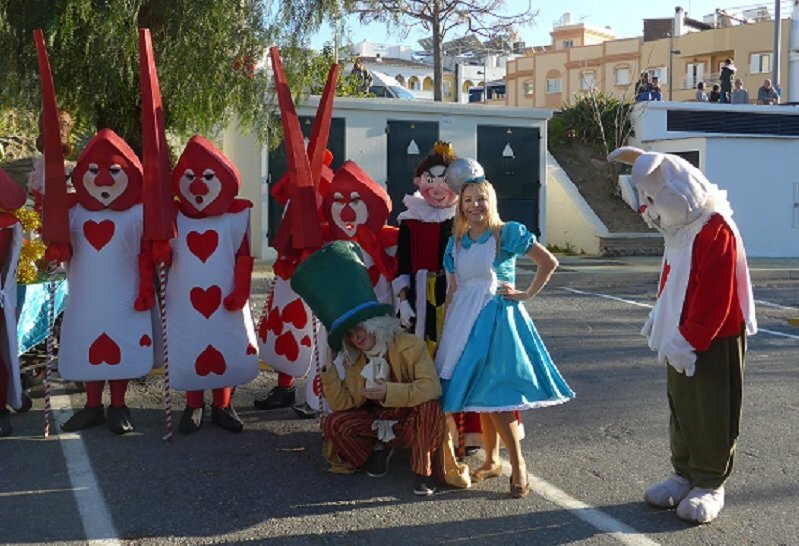 At KM57 I took the slip road and five minutes later I was checking in at Camping Pico de la Miel. My ACSI card was accepted with a payment of €19 for the night. Most of the site is taken up with mobile homes and bungalows however, at the edge of the site there’s an area devoted to tourist pitches. A water tap and electric bollard are shared by four pitches although being winter, the water was turned off. The toilet block is close by which has modern facilities, is clean and also heated. Washing up sinks are outside where there’s hot and cold water. 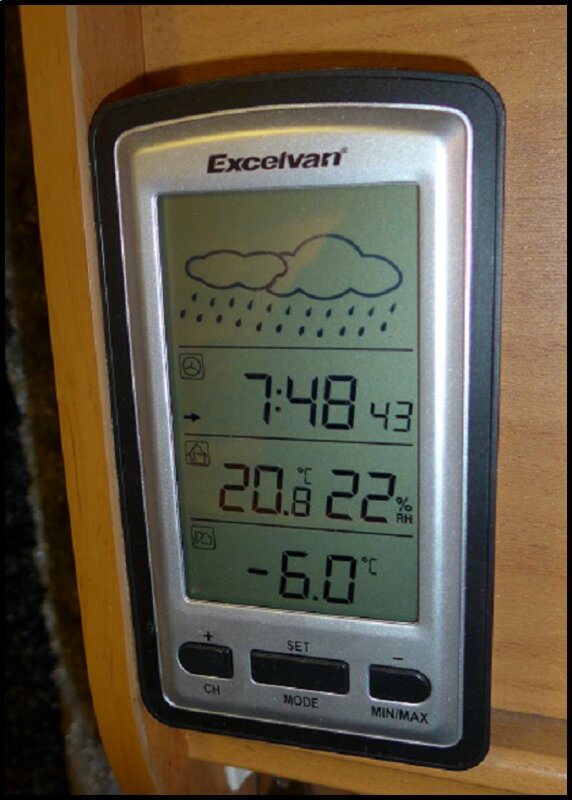 With the pitch taps being turned off, there was nowhere to fill an Aquaroll..
At 8.30 I went out to an ice covered car with the outside temperature down to -6c however with the engine running, the windows quickly cleared. 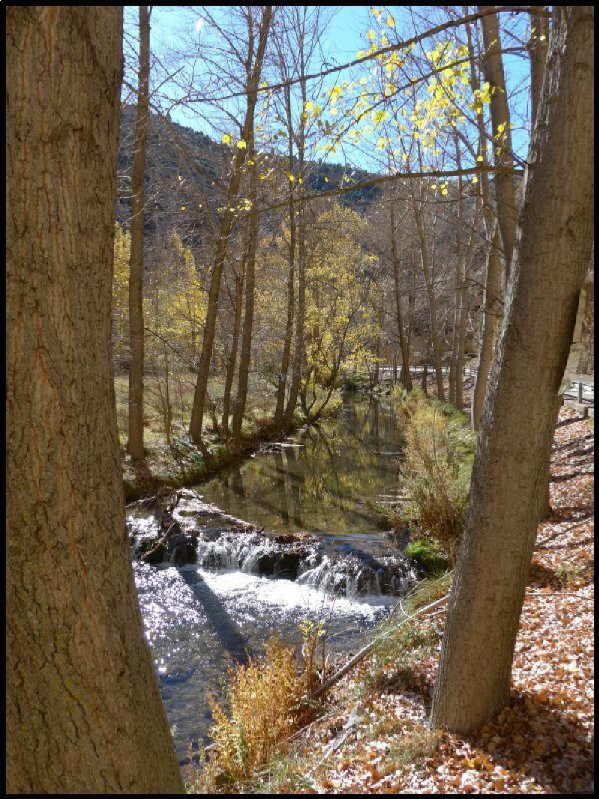 Within twenty miles I’d reached the foot of Somosierra, the pass through the Sierra de Guadarrama. It rises about a thousand feet over a distance of four miles however it’s a well-engineered three lane motorway without any serious bends. 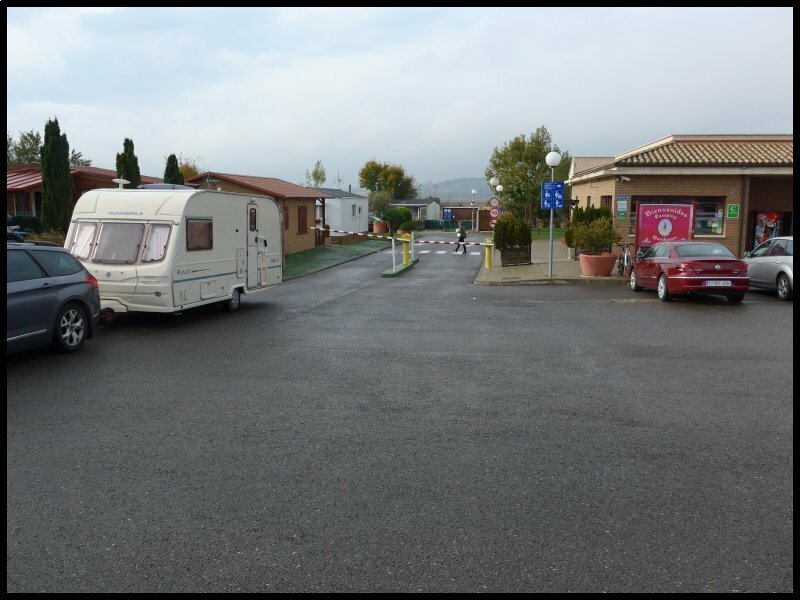 Today’s drive was just 120 miles so it was just on lunch time as I arrived at Camping Fuentes Blancas at Burgos. I presented my ACSI card but when the receptionist realized I was on my own she told me to put it away as the site fee for a single person was cheaper. I paid €17.60 so presumably the ACSI fee would have been €19. Pitches are on level ground which is inclined to become boggy in wet weather. In some previous years when I’ve stopped there the pitches have been so water-logged that I’ve parked on the roadways. There are several ranges of washing up sinks dotted around the site however, the water is turned off during the winter months. Water is available at the two toilet blocks but again there’s no tap where an Aquaroll may be filled. 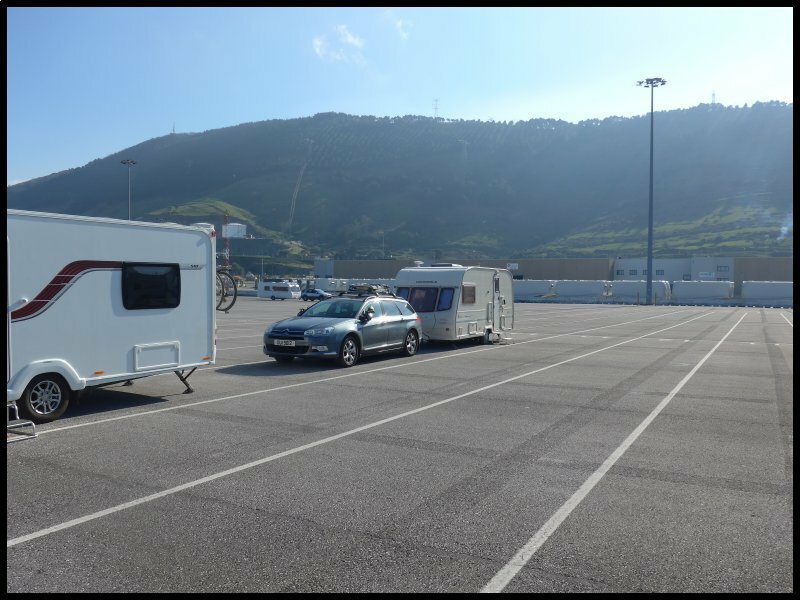 The last stage of my journey was the 110 miles down to Bilbao ferry port. I didn’t leave until just before 12 mid-day because my plan was to spend the night on the dockside. Arrival and check-in was scheduled between 4pm and 7pm but when I arrived at 3pm several outfits were already waiting. Check-in began at 3.15. Very soon I presented my booking number and passport and I was issued with my boarding slip and cabin key. When I took a walk around the parking lanes at 7 in the evening there were 45 outfits overnighting on the dockside. The night was quiet and I slept well. But where were the blue skies that had been with me for the past four days. They were gone – only to be replaced by heavy black clouds. Maybe the forecast for snow in northern Spain by Wednesday was going to be correct. The ferry arrived at around 7.30 and loading began at 9.30. The ship was fifteen minutes or so late in leaving but we had a reasonably smooth crossing. We docked at 9am; unloading took for ages, as did Border Control but by 10.15 I was on the motorway and home just 90 minutes later. Just a pity about the snow! As I’ve done in previous years, here’s a break down of my expenses for the four months.